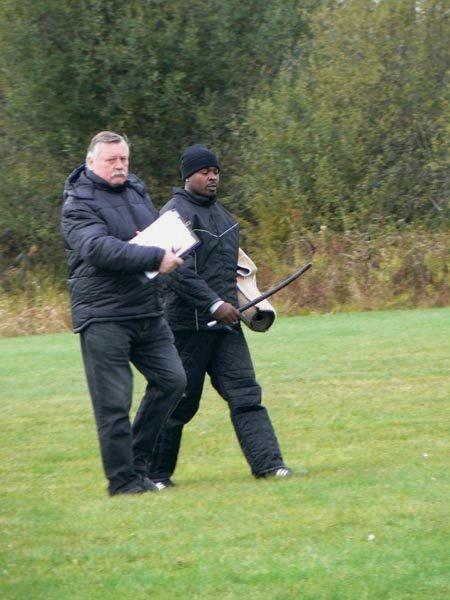 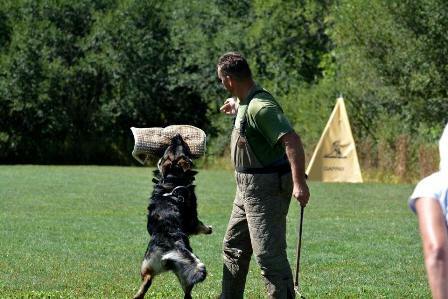 work and dedication to the sport and our dogs. 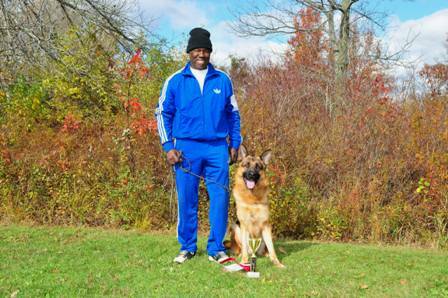 A special moment to Kenneth Payne and "Baccus"! 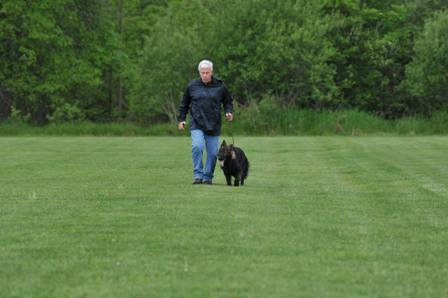 Retirement is never easy on our working dogs. 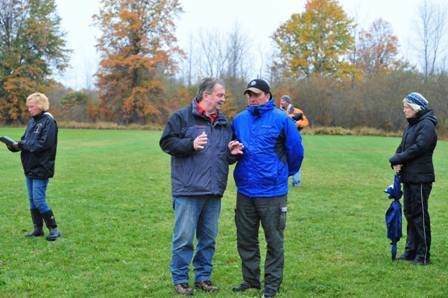 Thank You, Al Rinow & Peter Qi, for the Photos! 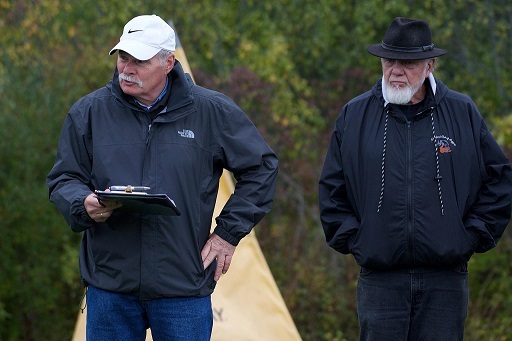 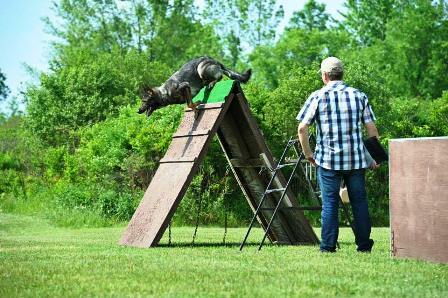 Thank you Al Rinow & Peter Qi for the Photos! 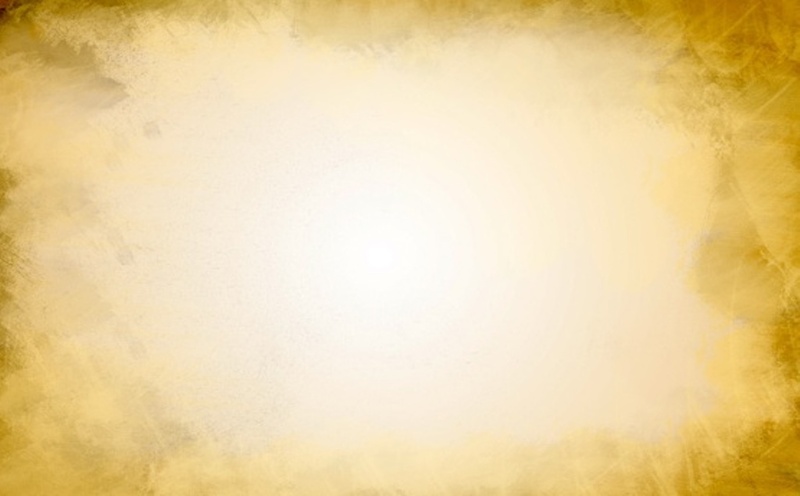 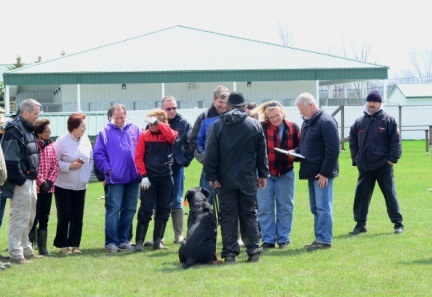 A Special Thank You to the Club! 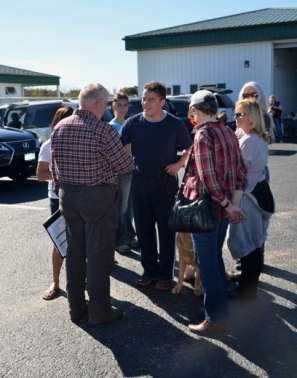 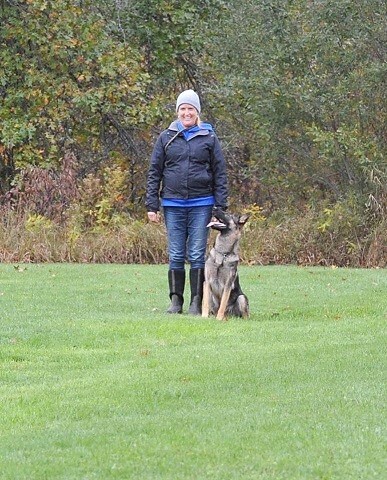 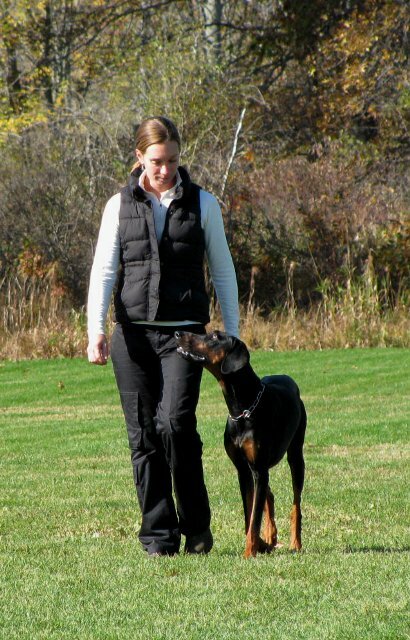 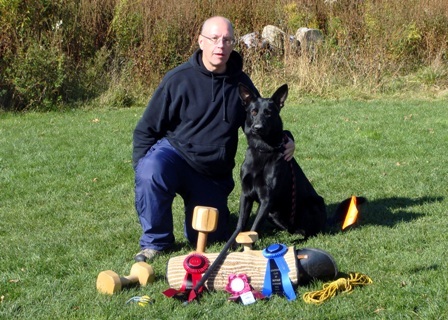 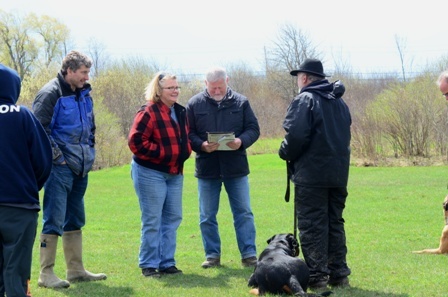 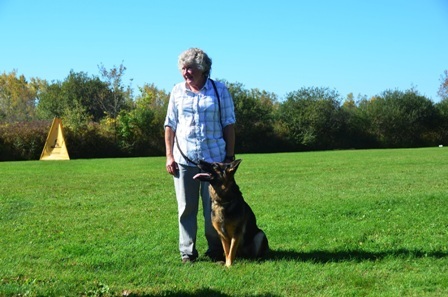 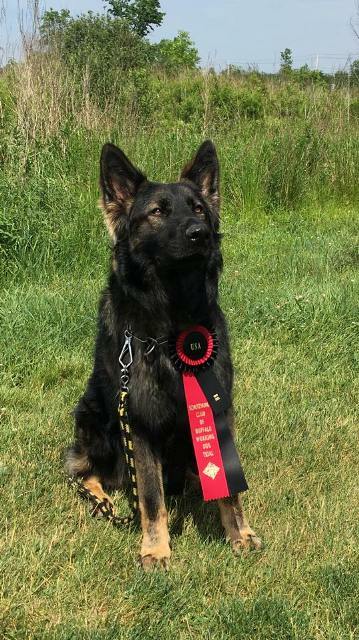 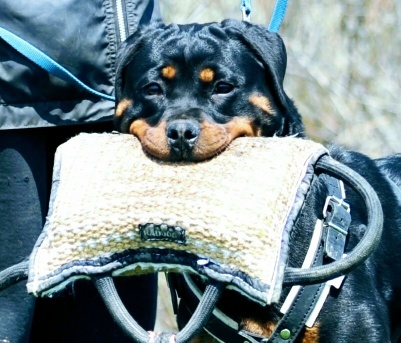 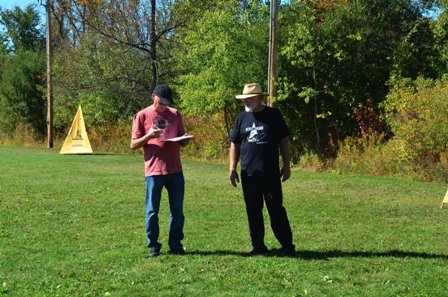 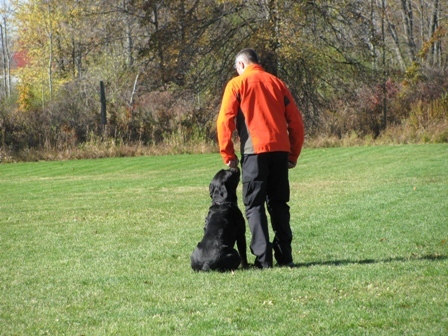 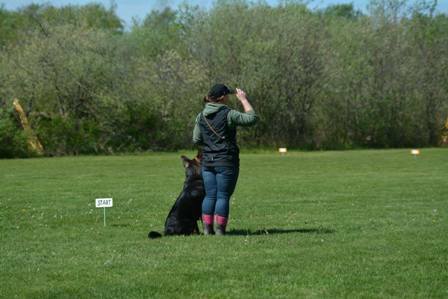 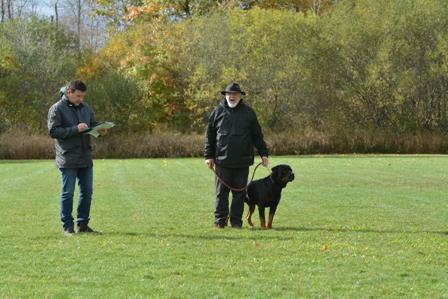 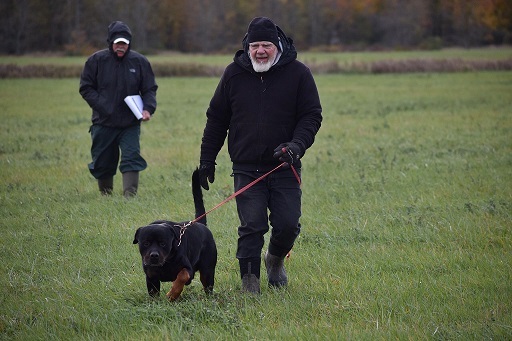 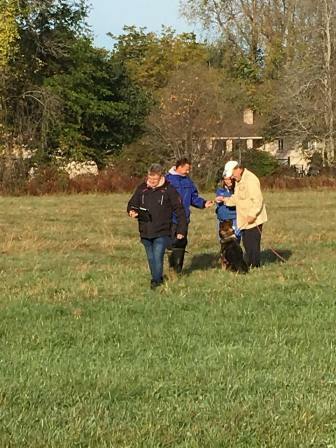 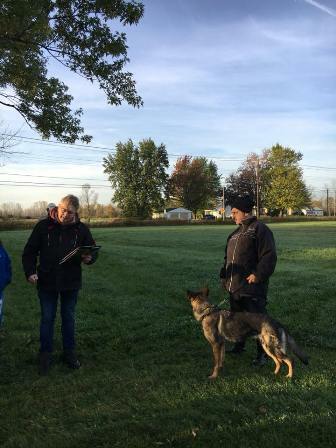 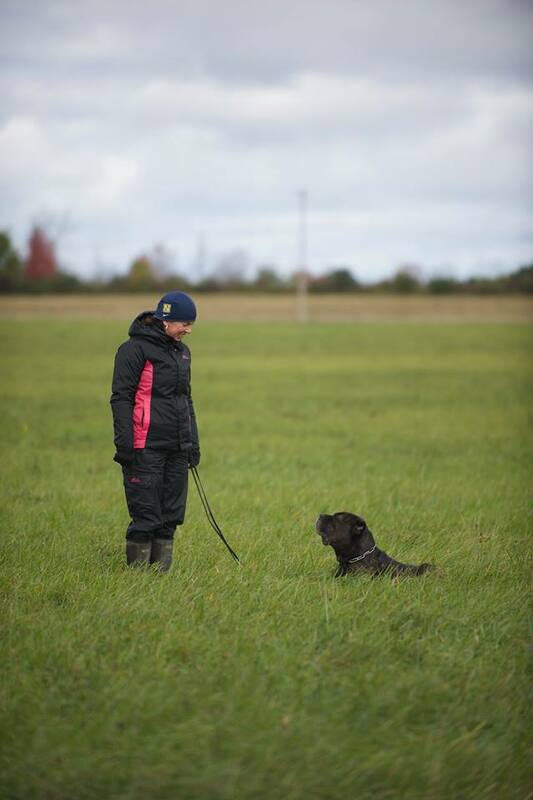 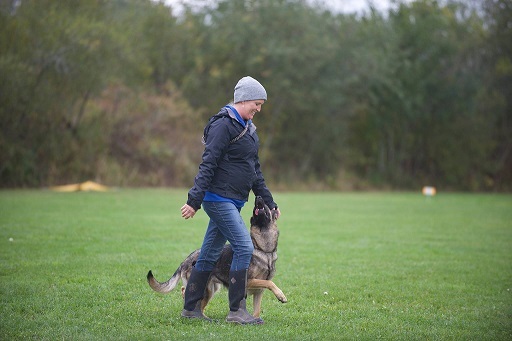 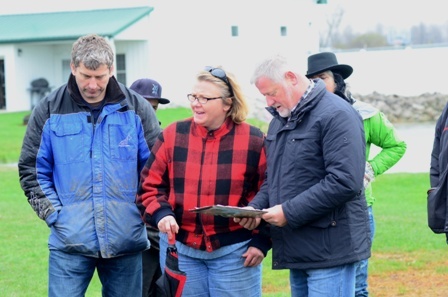 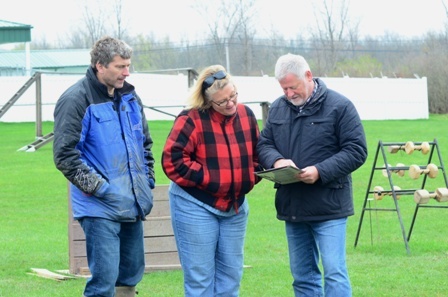 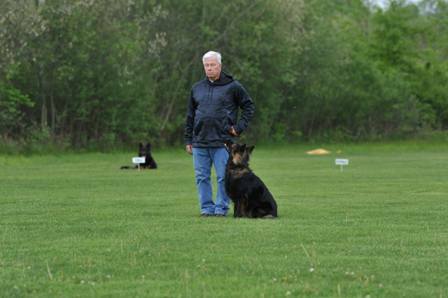 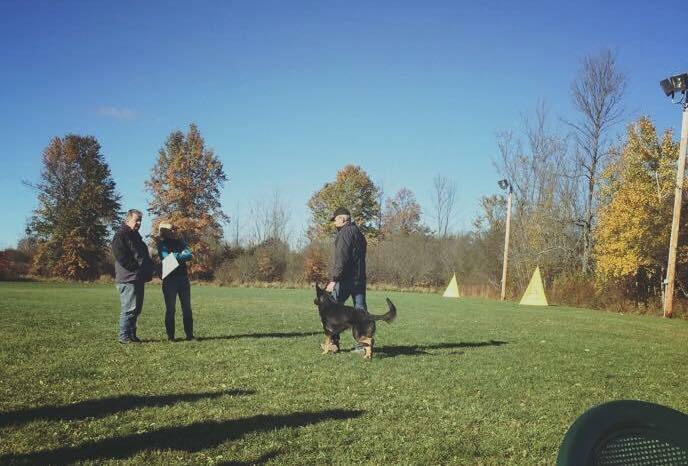 After judging the New England Regional Conformation Show& Breed Survey& Club Trial 2015 at the Schutzhund Club of Buffalo, is it particularly important for me to say THANK YOU. 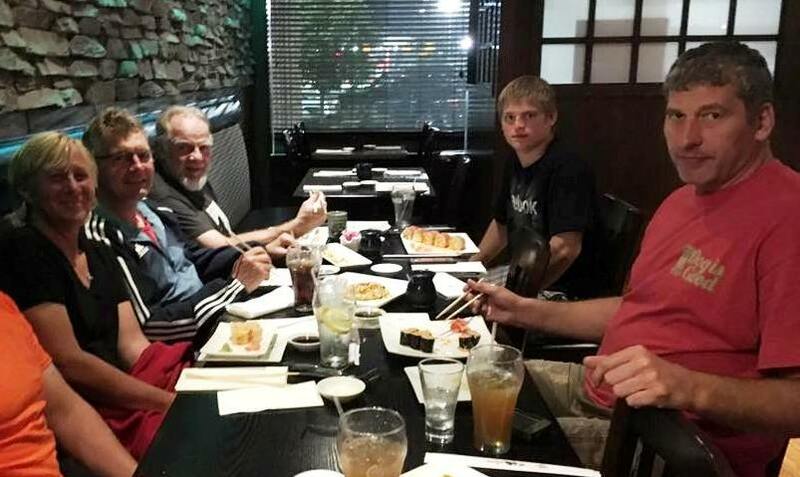 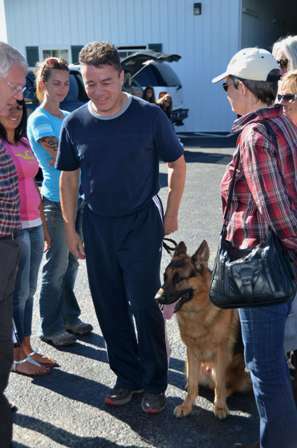 I felt warmly welcomed since my arrival in the USA and you made my stay so pleasent. 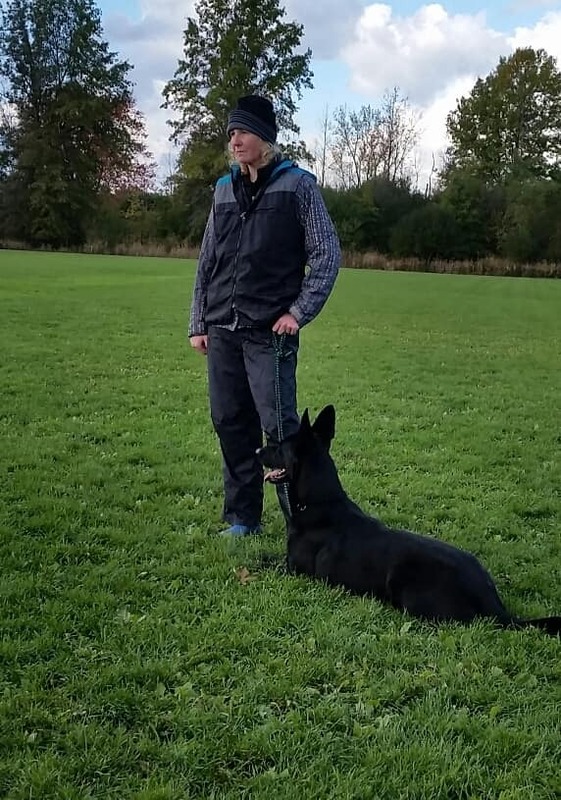 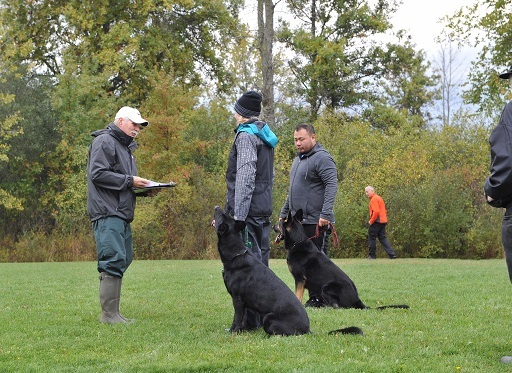 My first impression of your Schutzhund Club appeared to me just extraordinary and during my stay I could see that this impression came absolutely right. 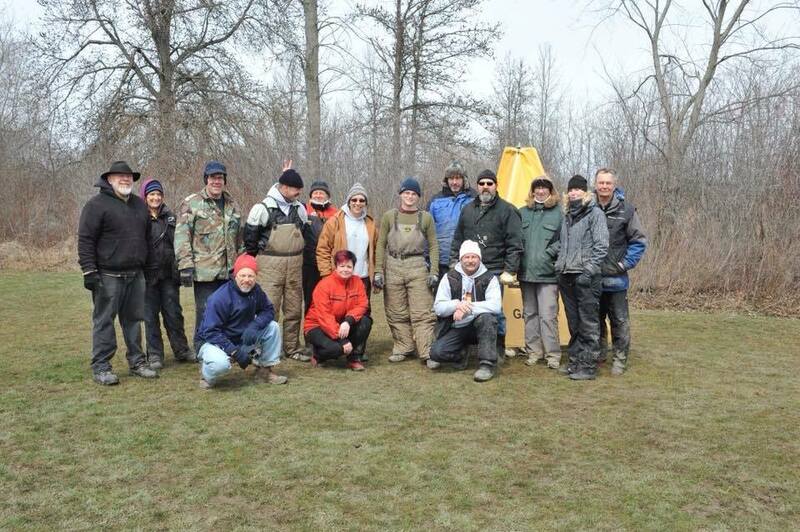 A lot of members of the club worked together as Team in harmony and inspired. 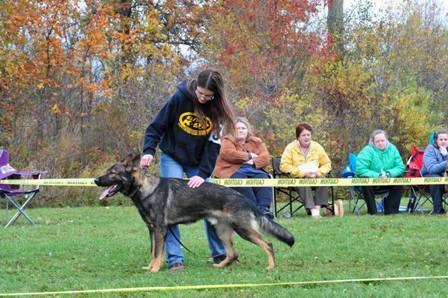 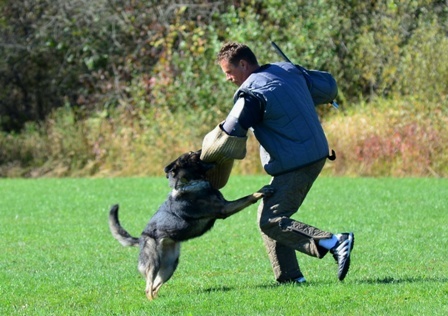 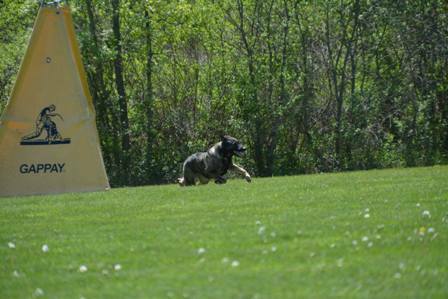 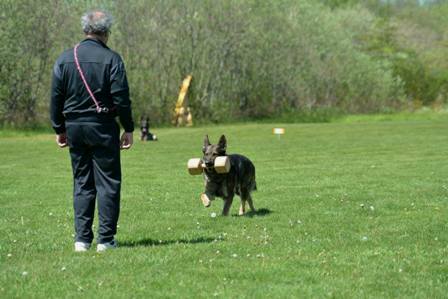 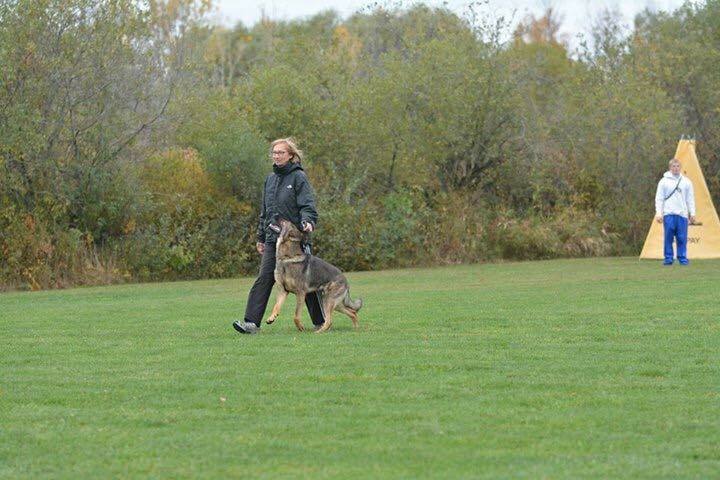 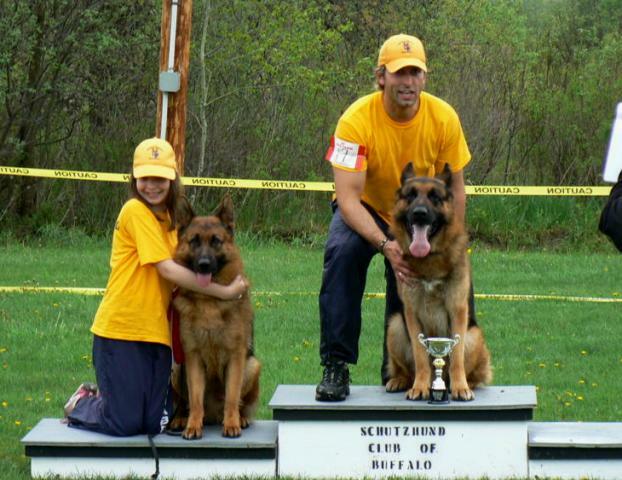 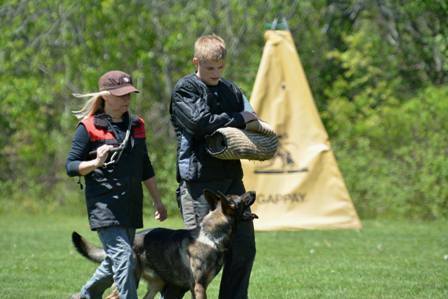 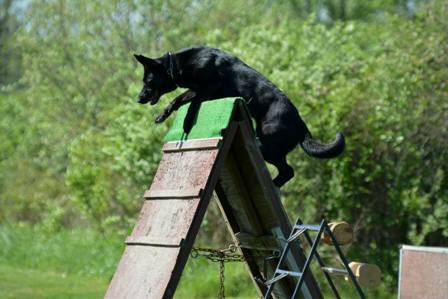 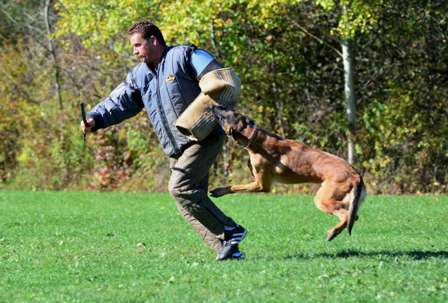 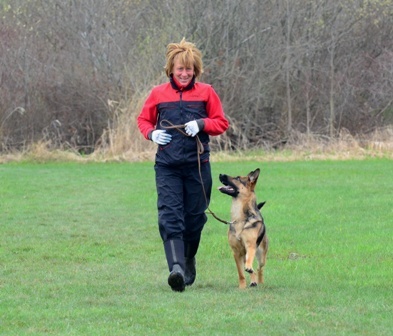 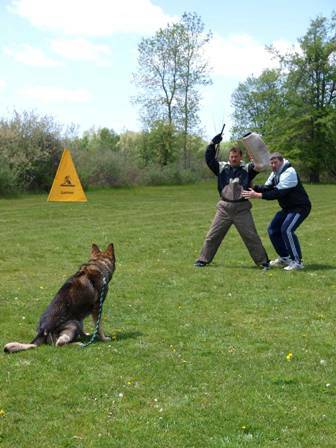 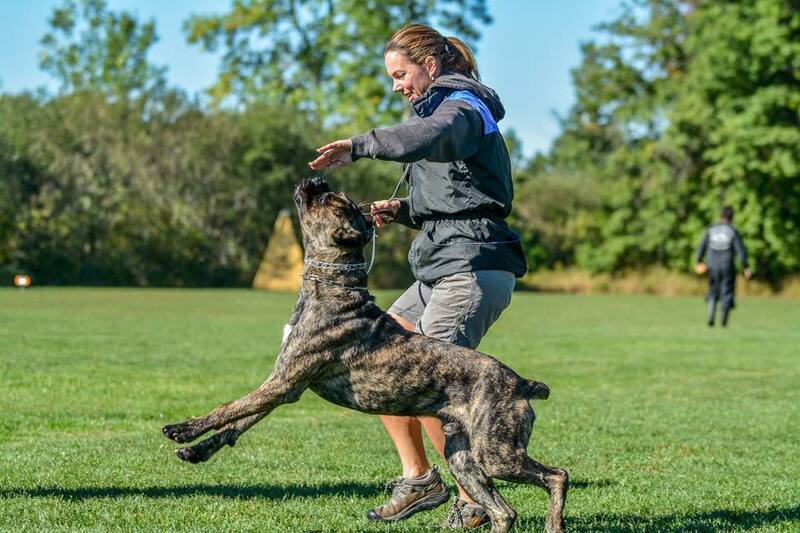 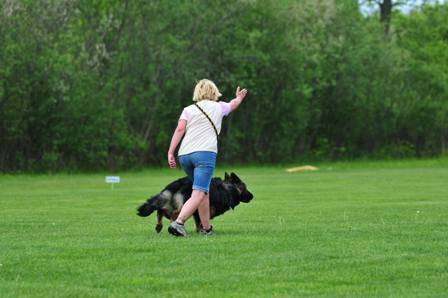 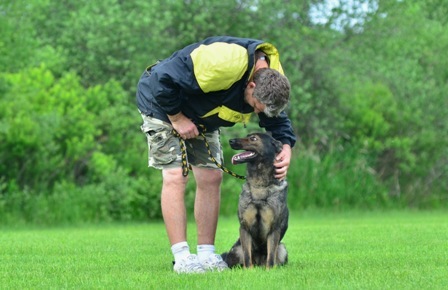 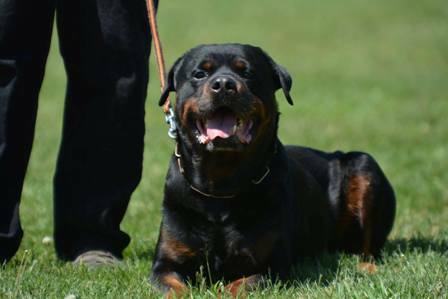 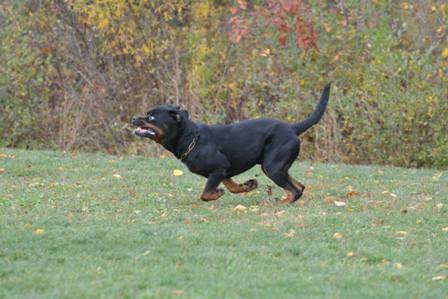 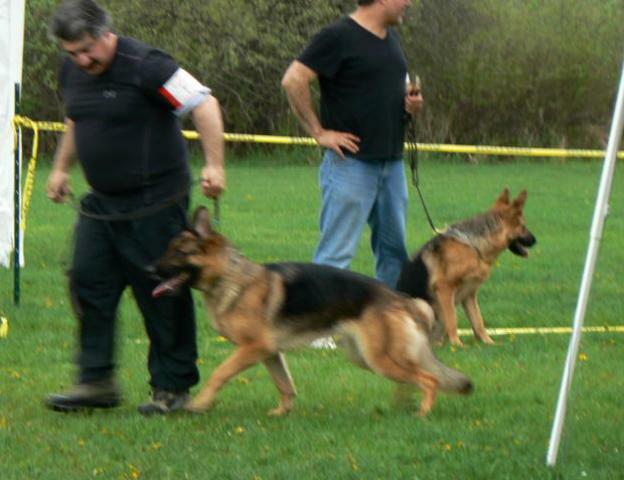 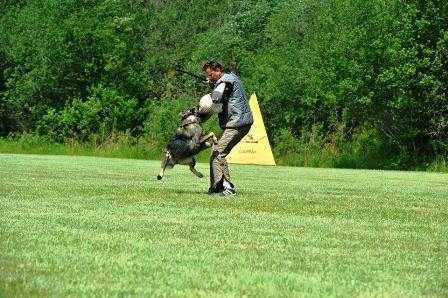 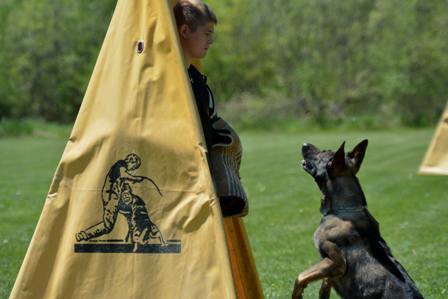 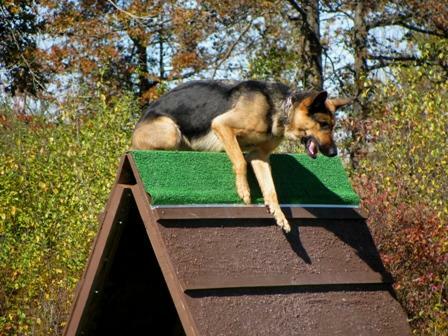 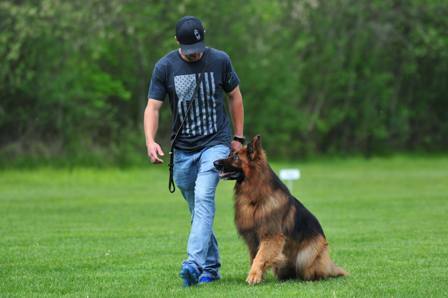 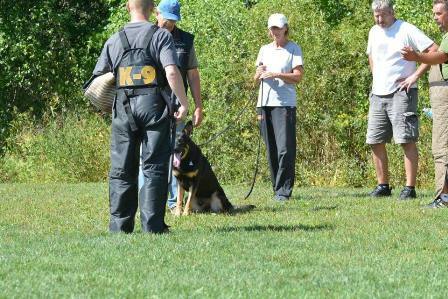 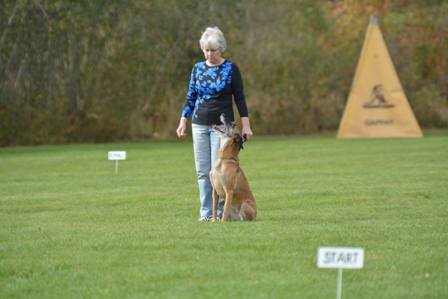 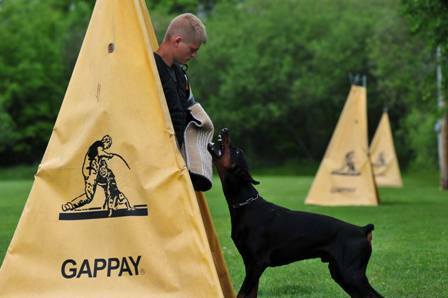 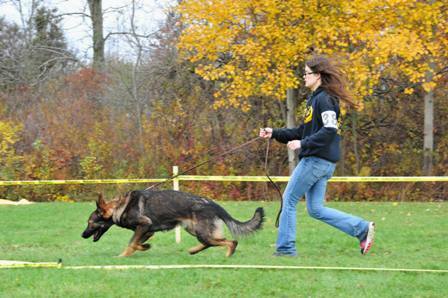 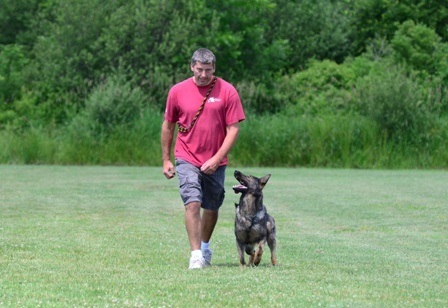 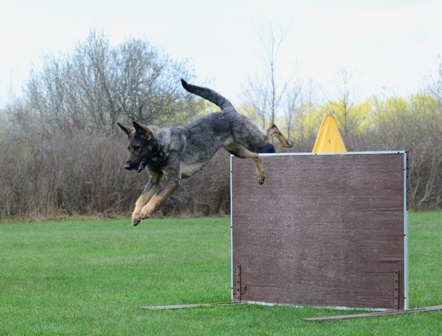 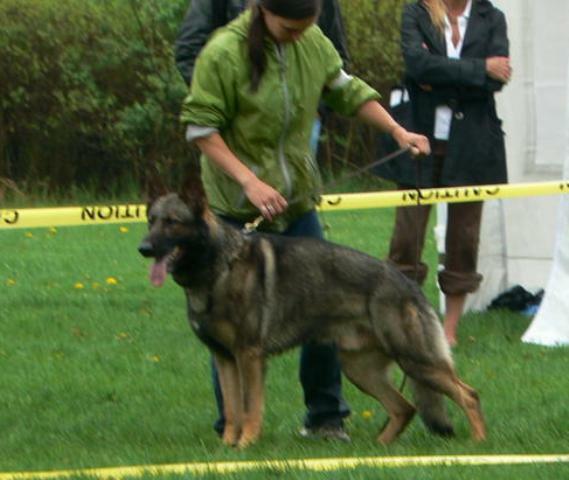 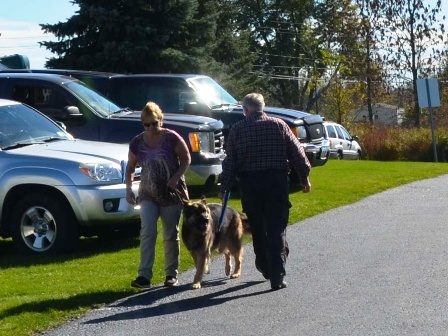 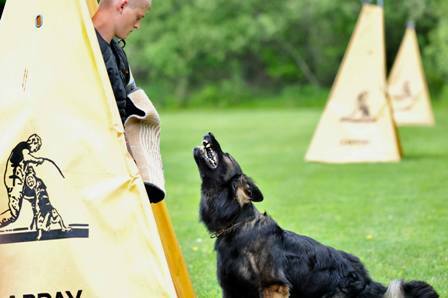 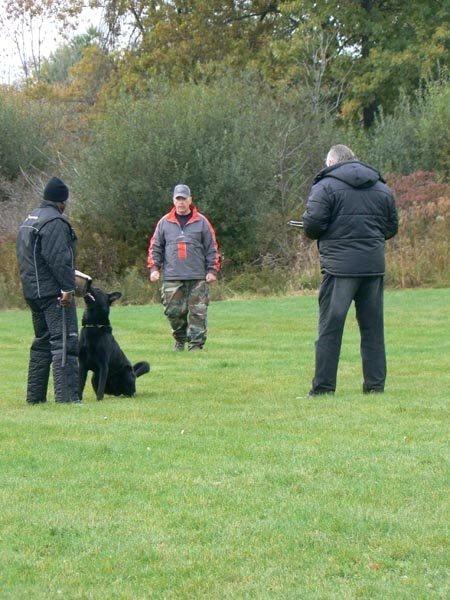 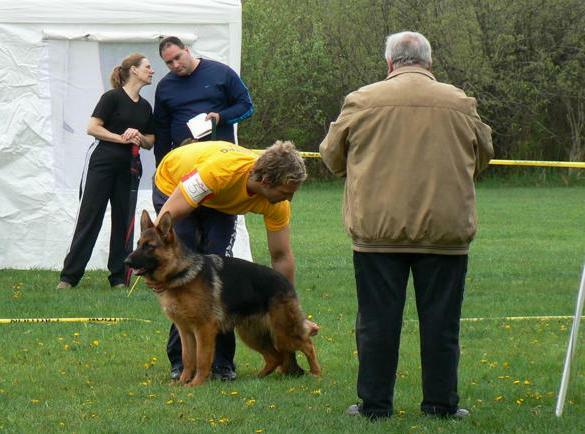 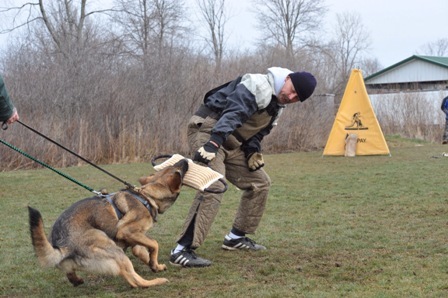 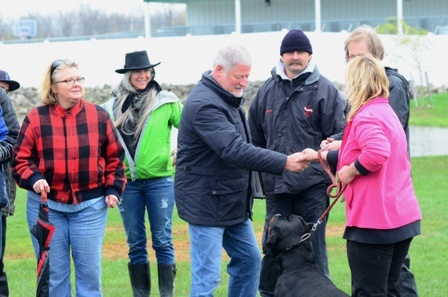 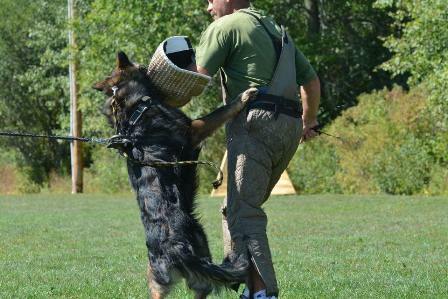 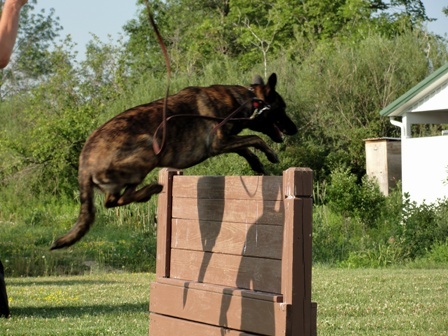 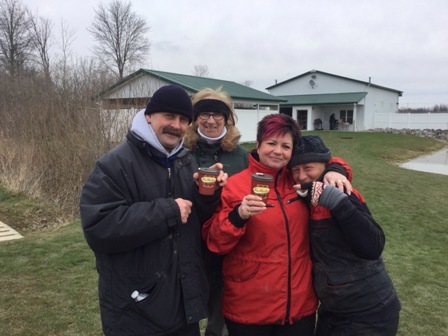 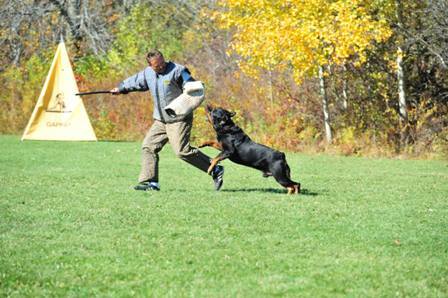 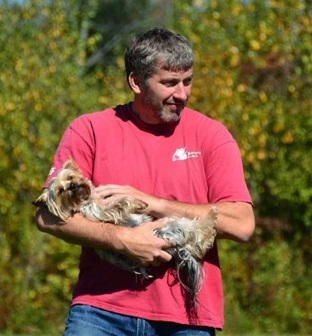 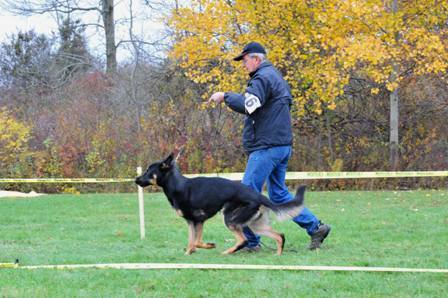 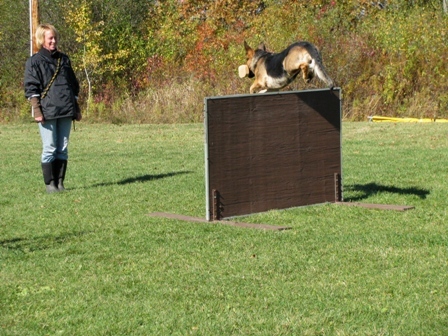 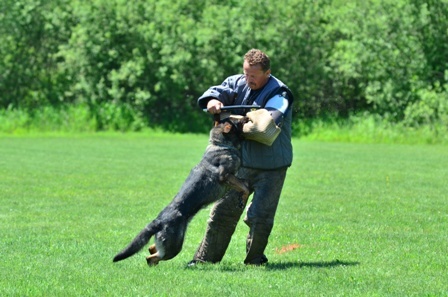 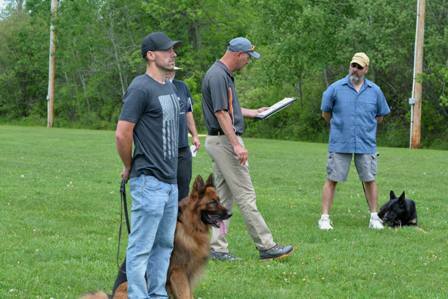 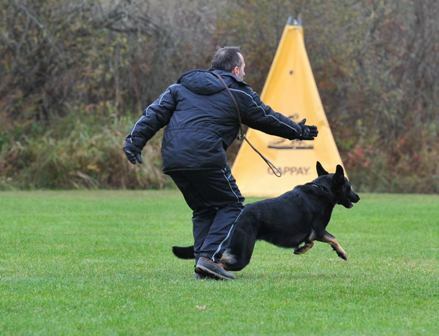 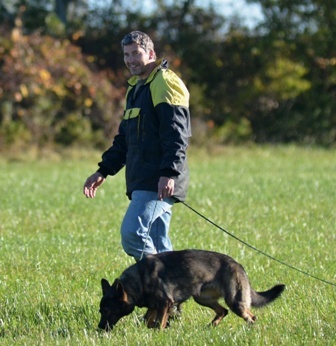 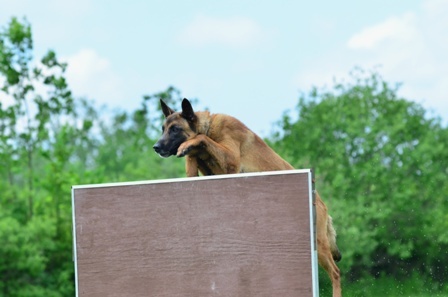 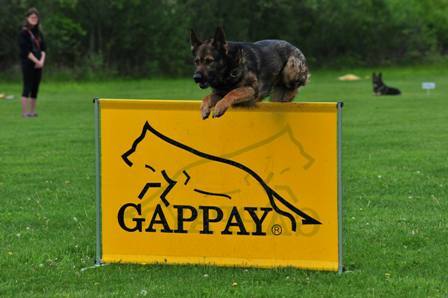 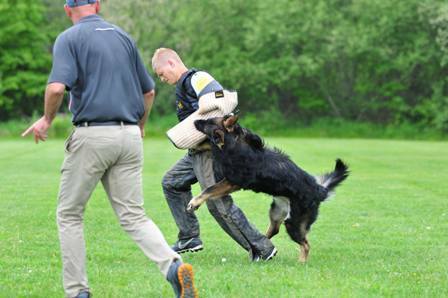 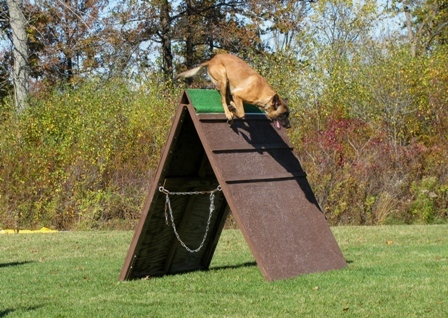 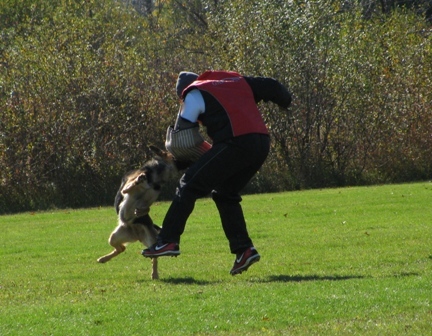 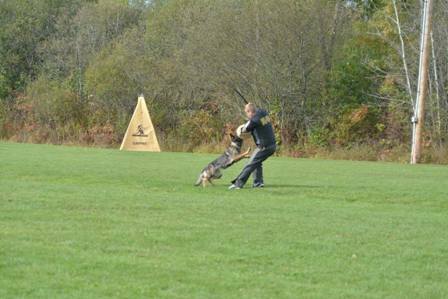 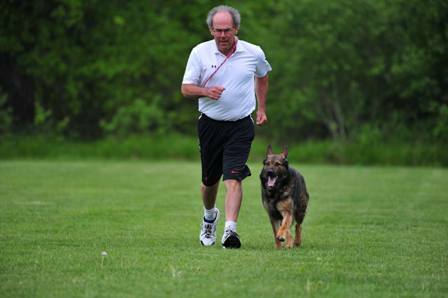 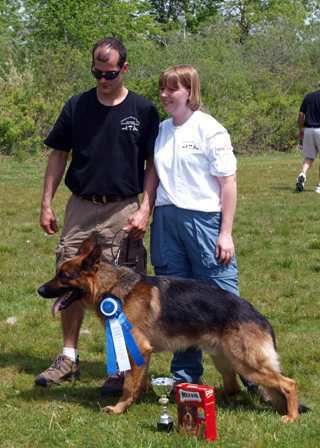 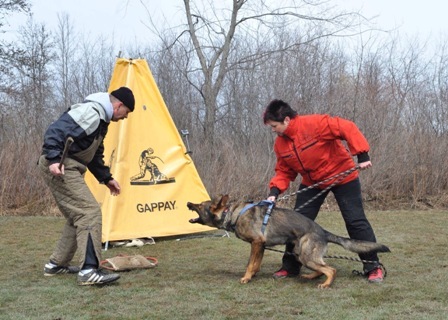 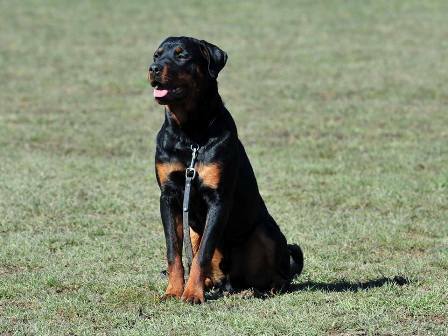 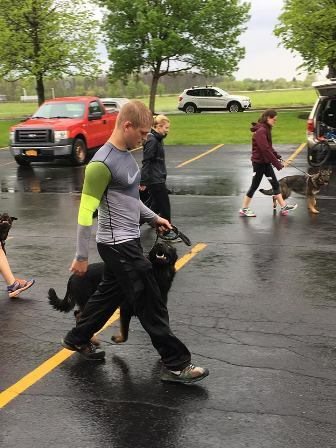 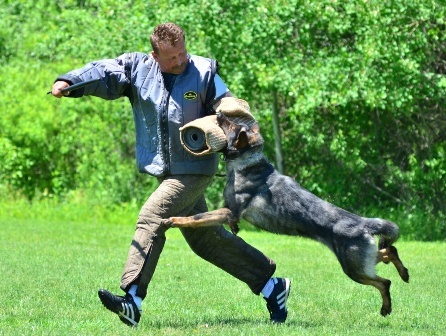 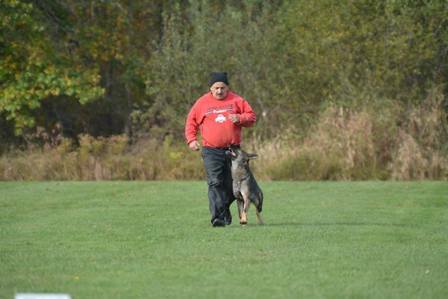 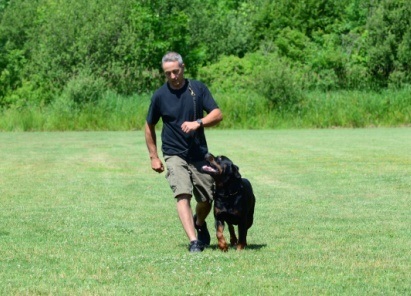 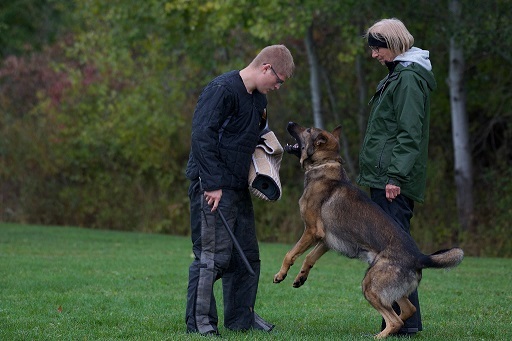 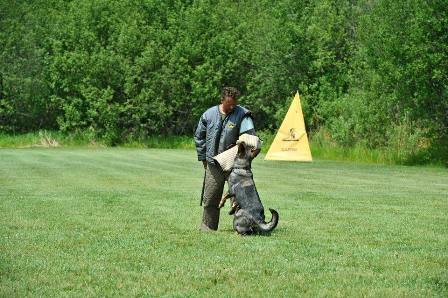 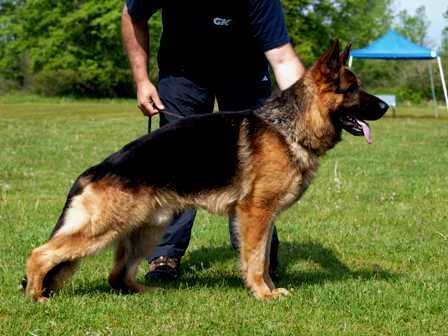 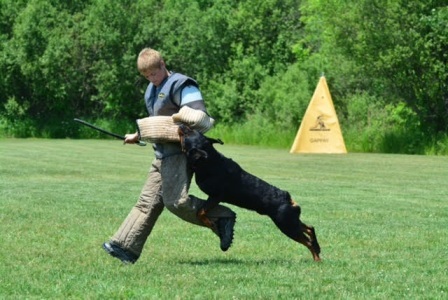 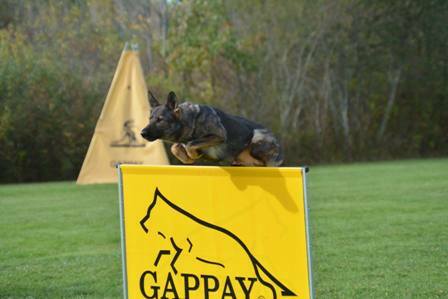 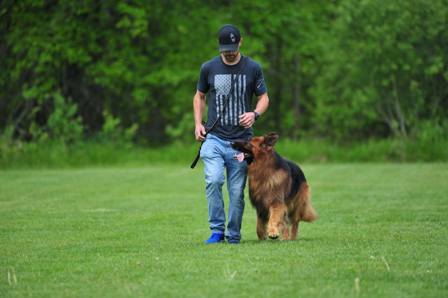 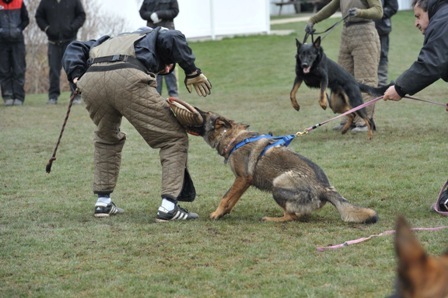 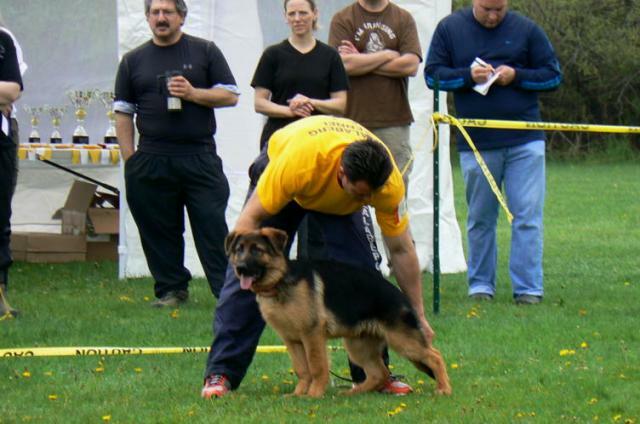 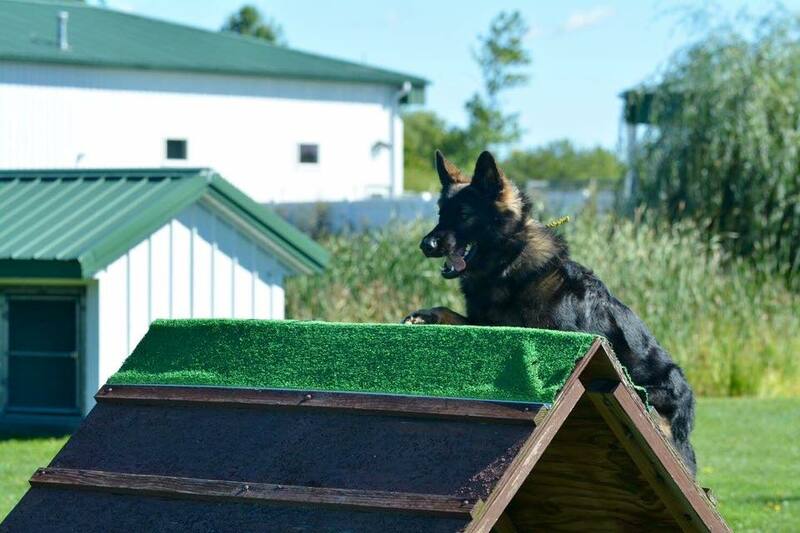 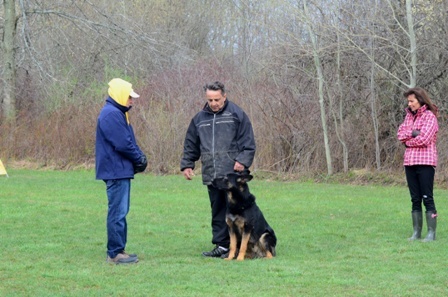 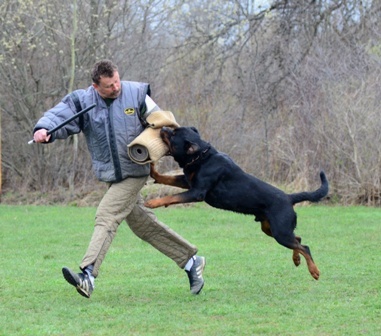 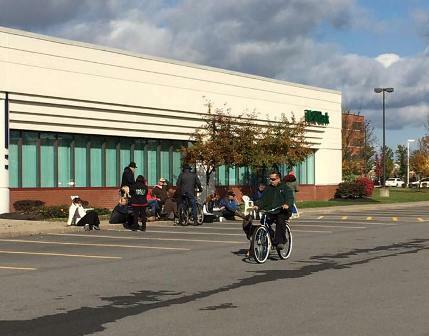 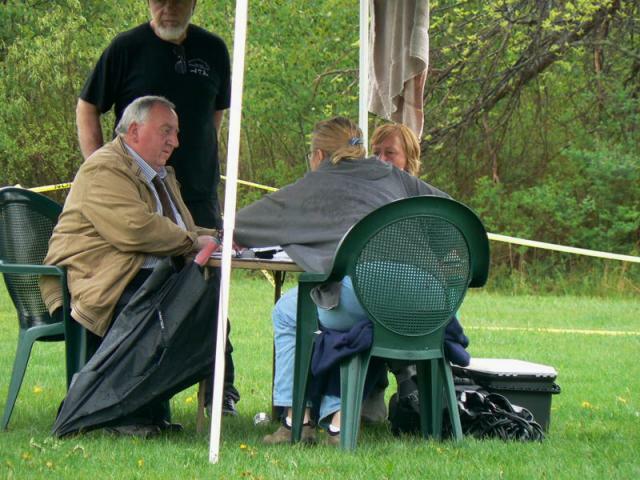 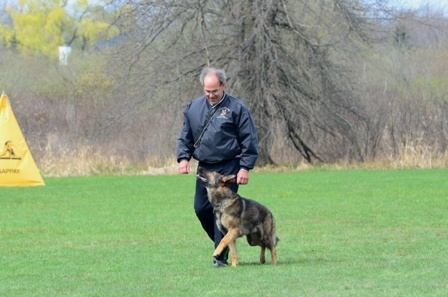 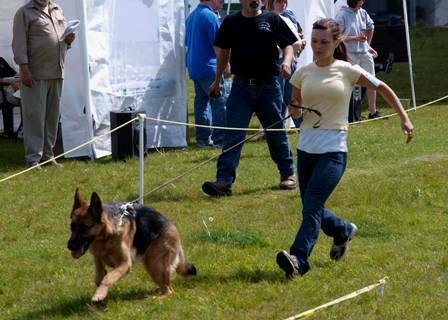 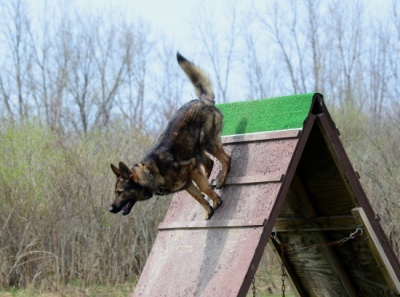 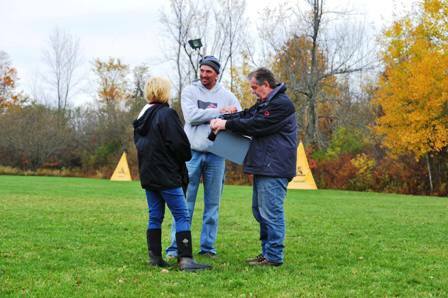 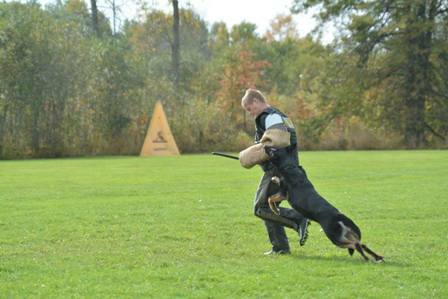 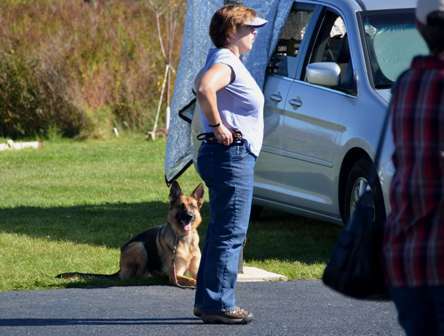 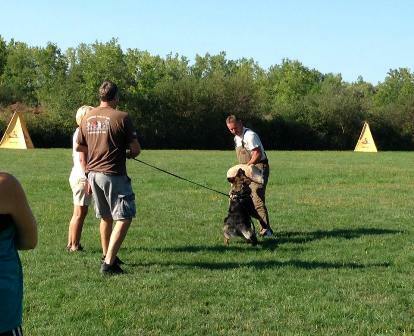 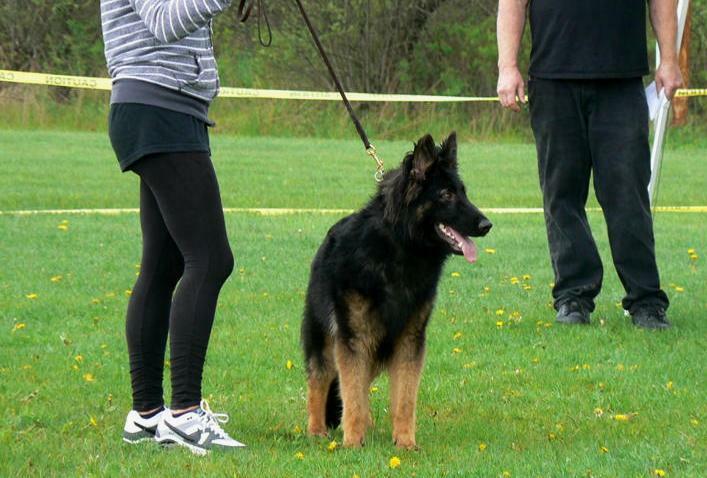 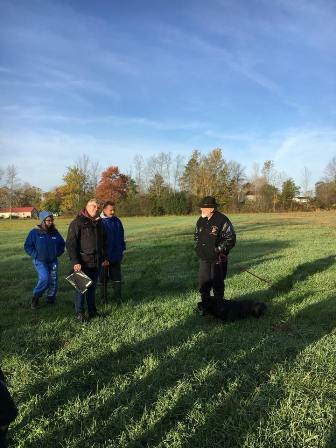 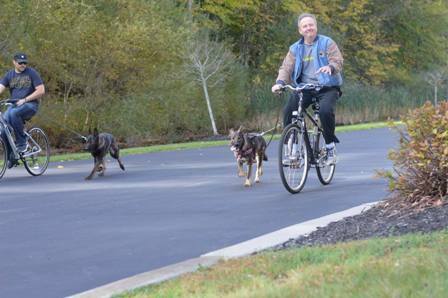 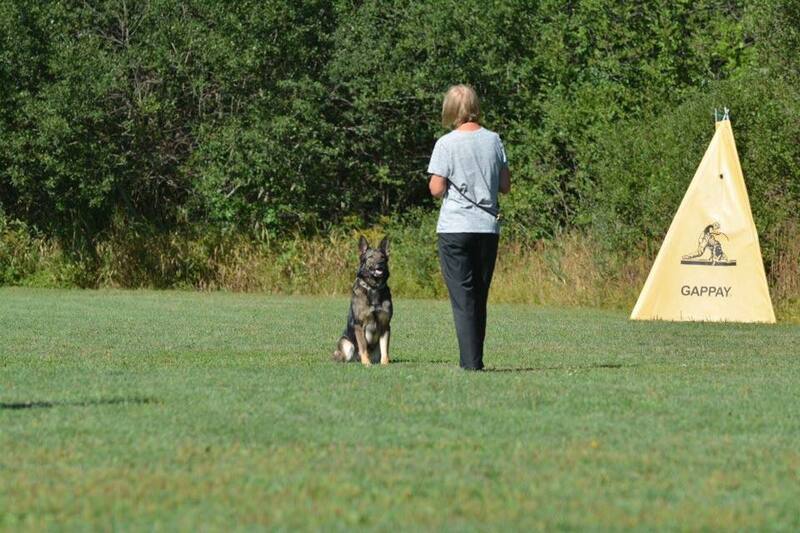 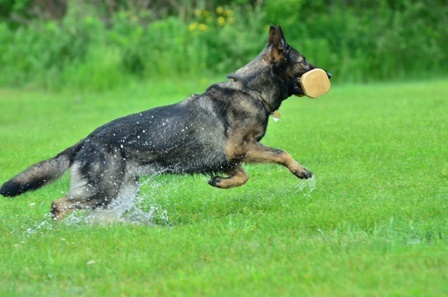 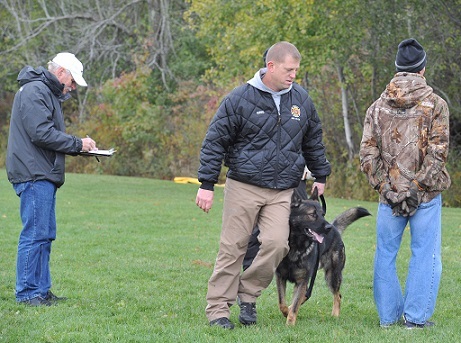 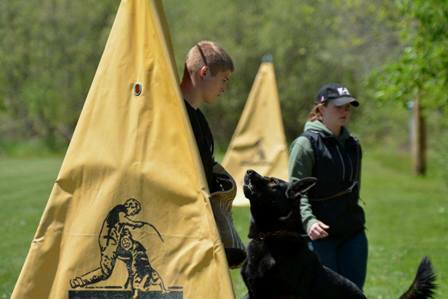 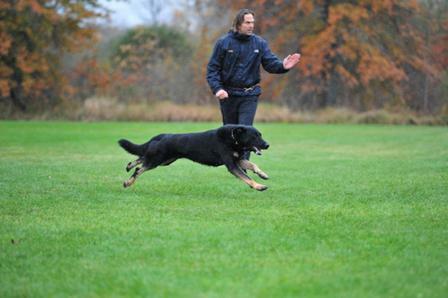 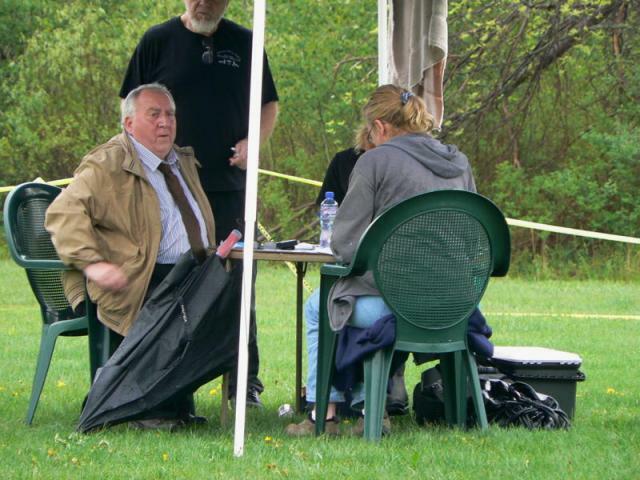 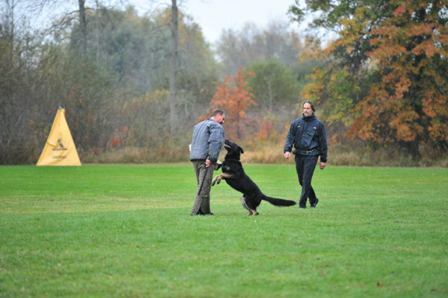 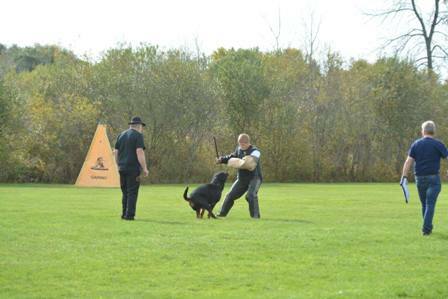 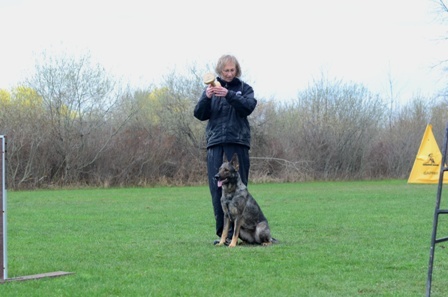 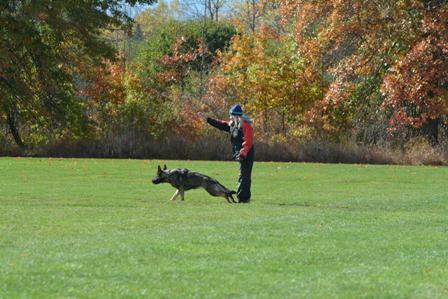 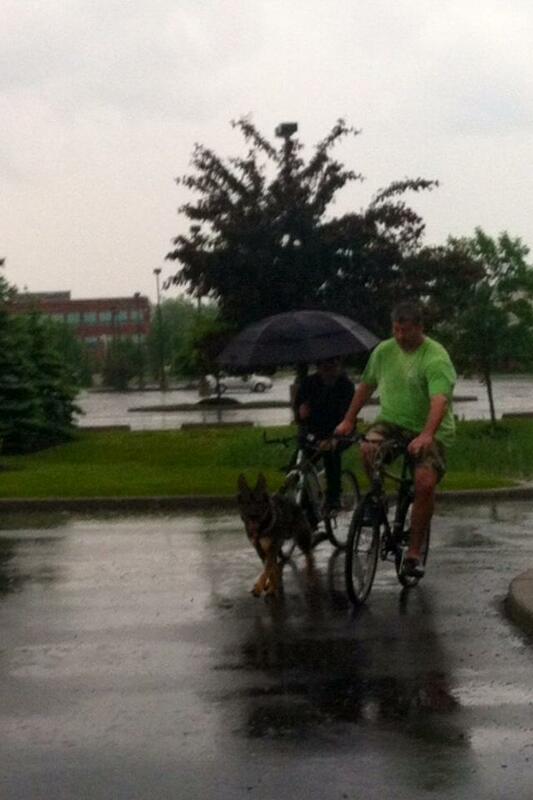 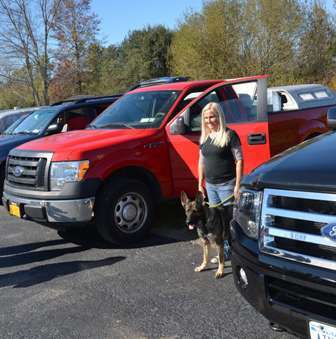 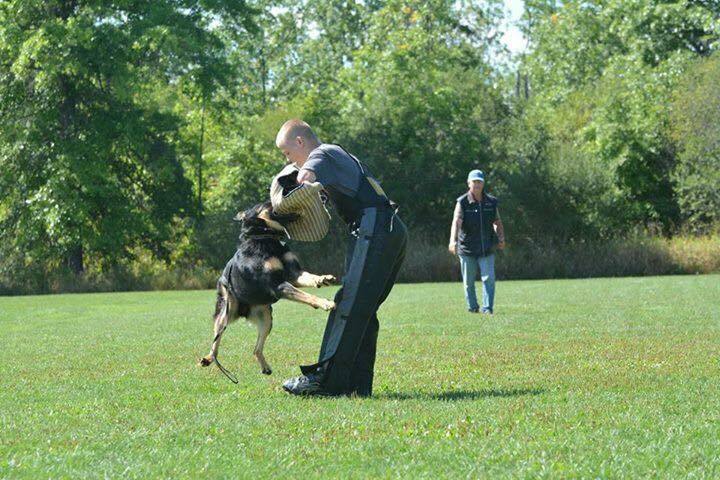 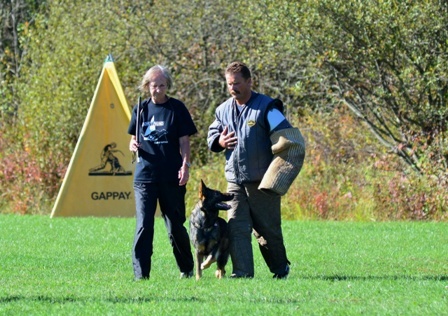 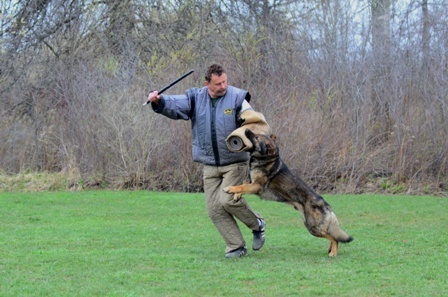 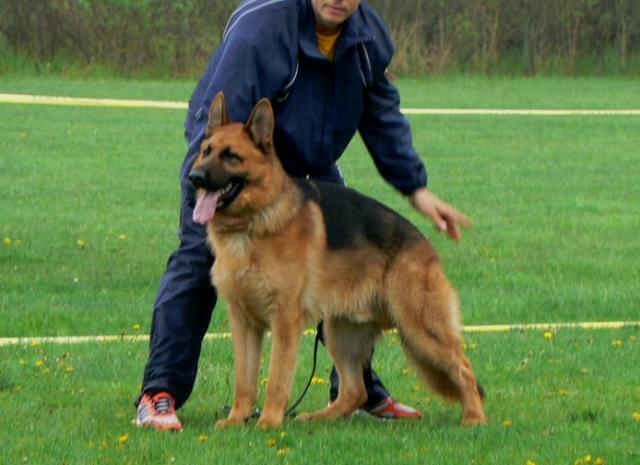 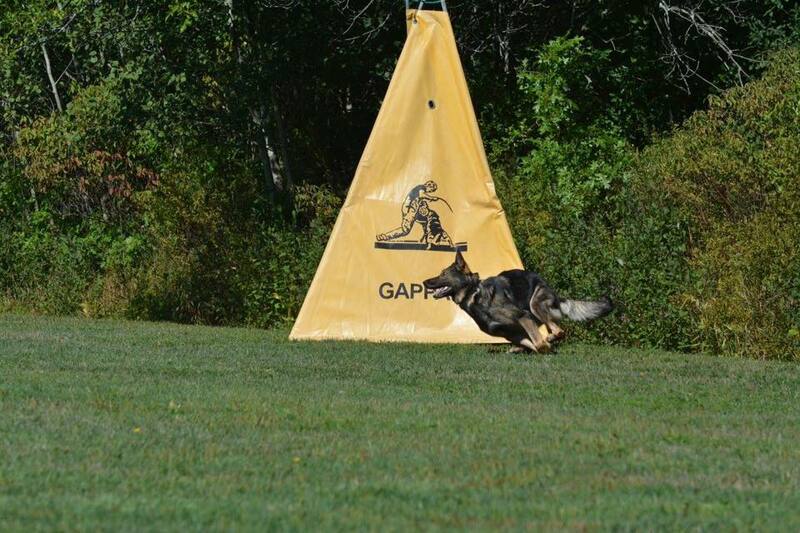 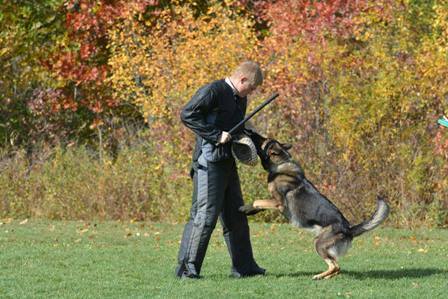 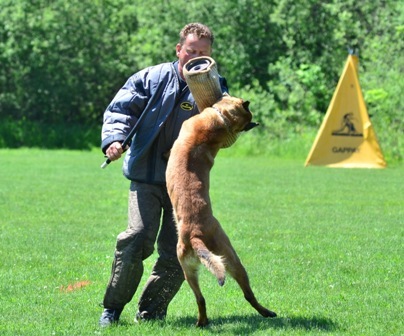 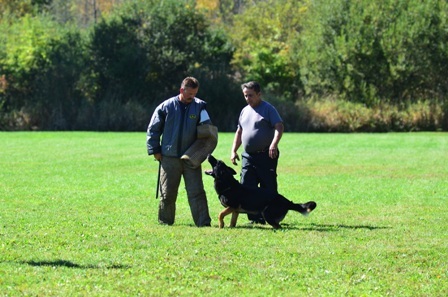 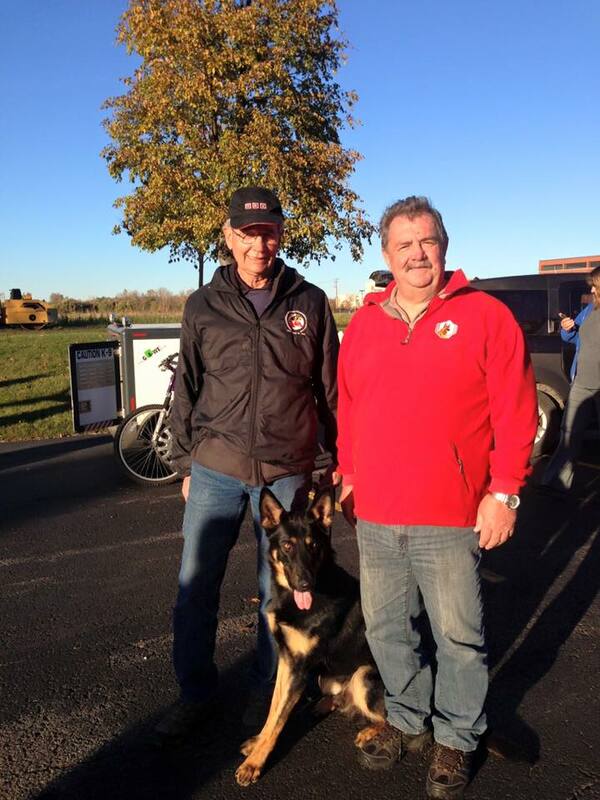 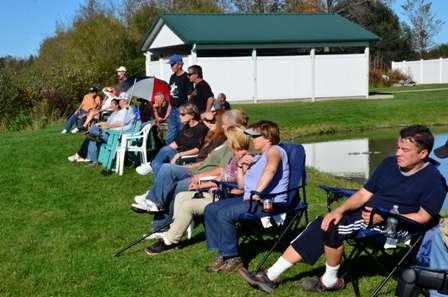 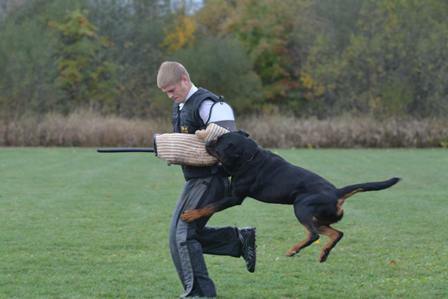 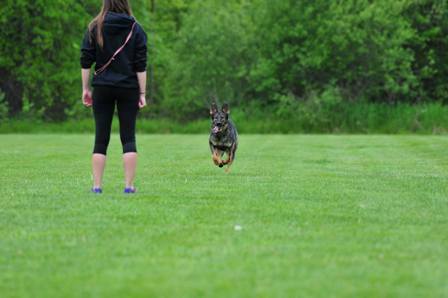 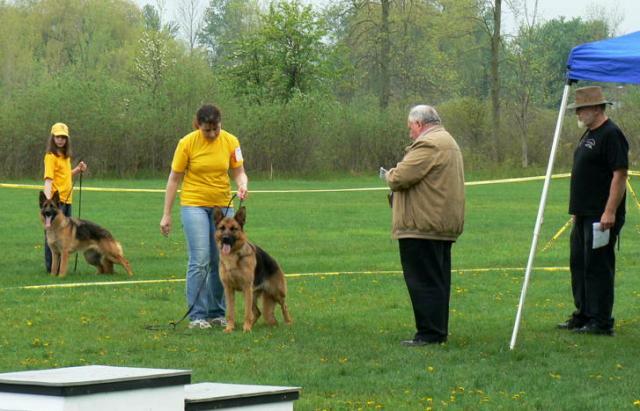 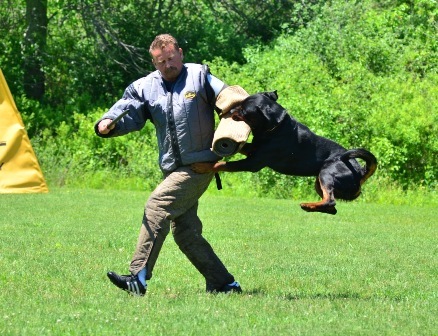 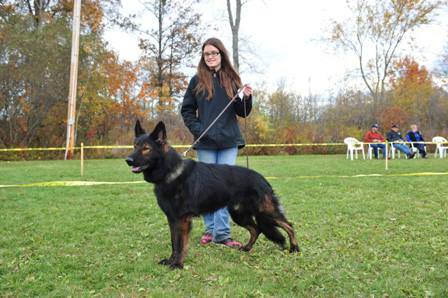 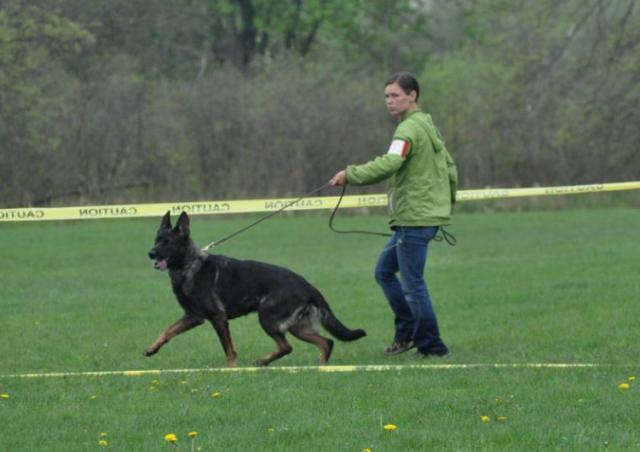 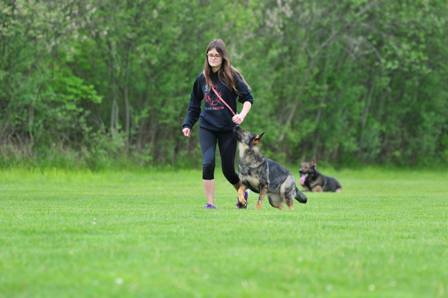 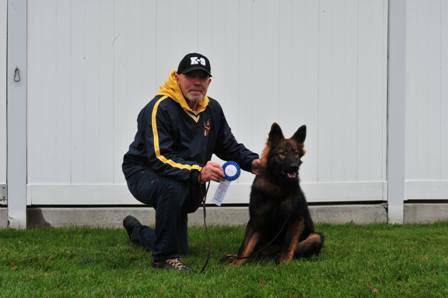 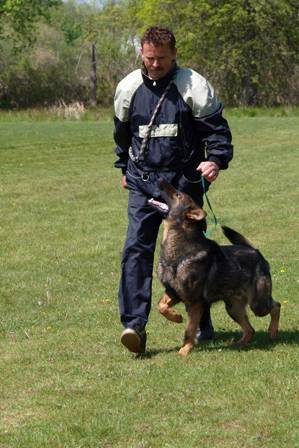 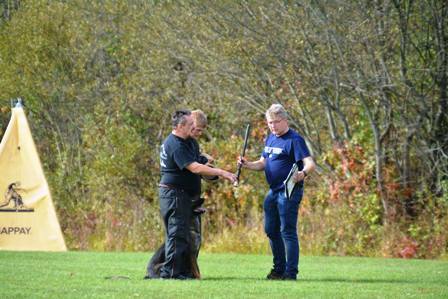 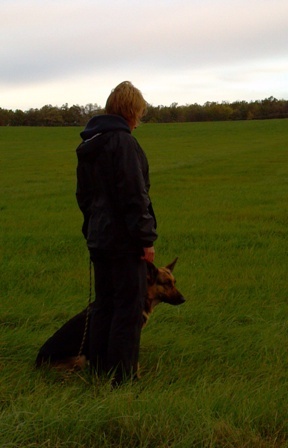 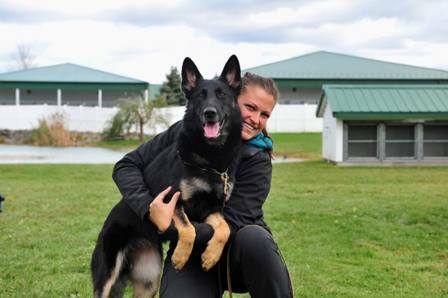 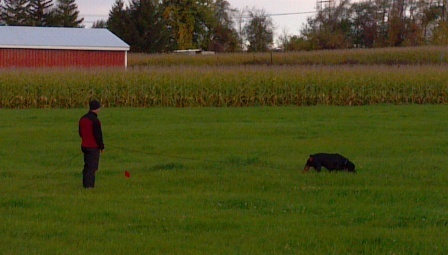 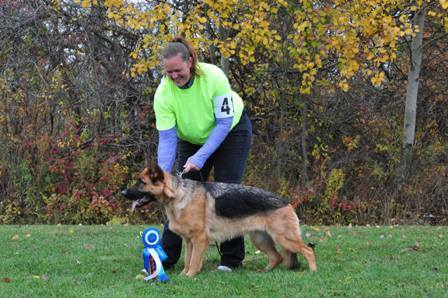 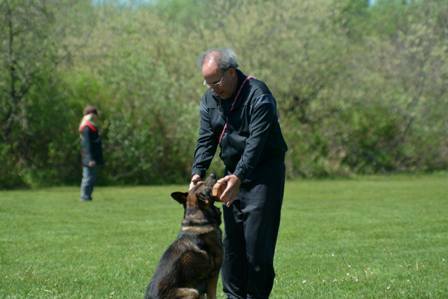 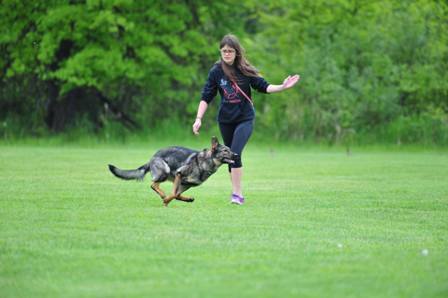 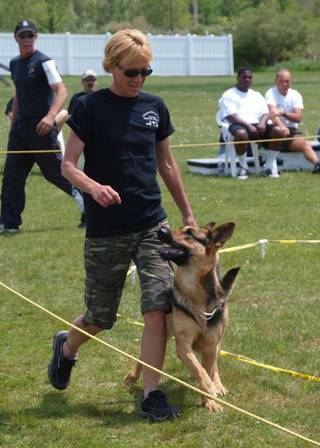 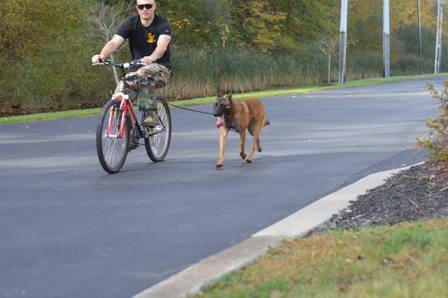 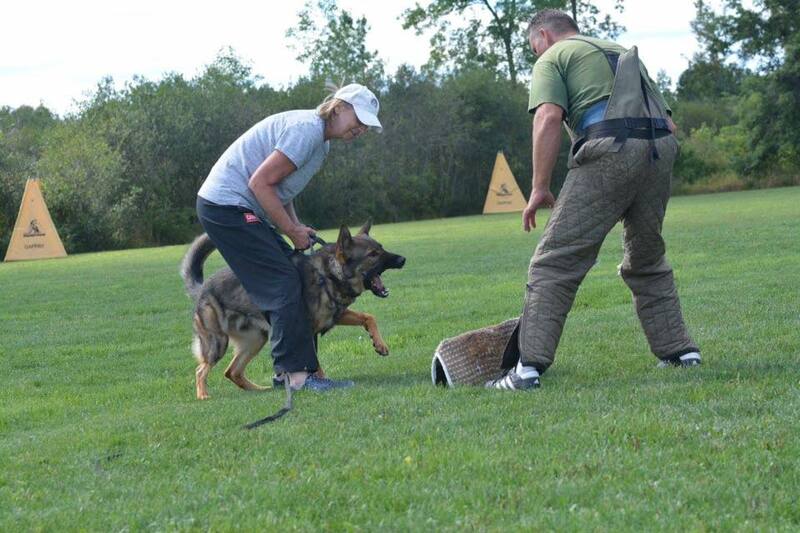 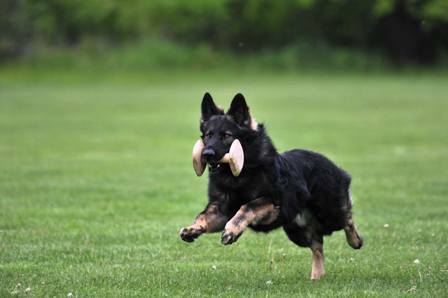 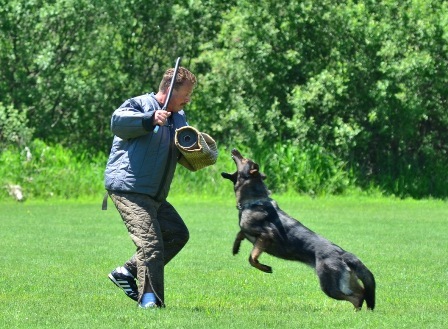 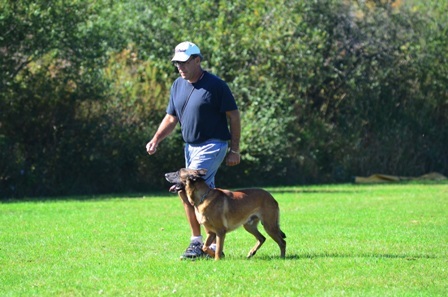 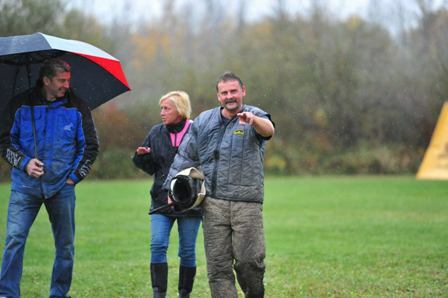 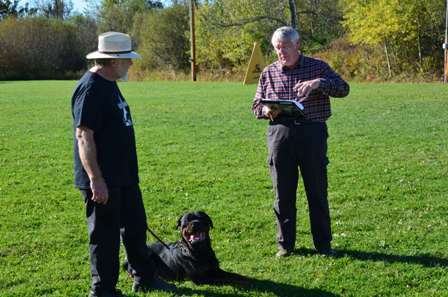 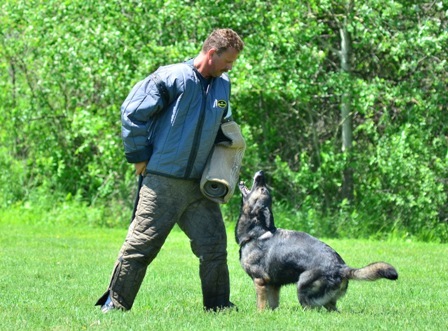 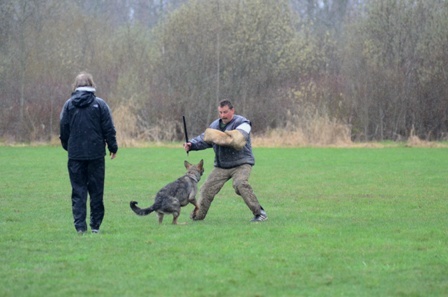 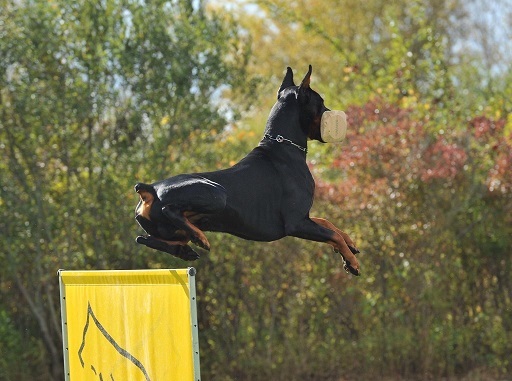 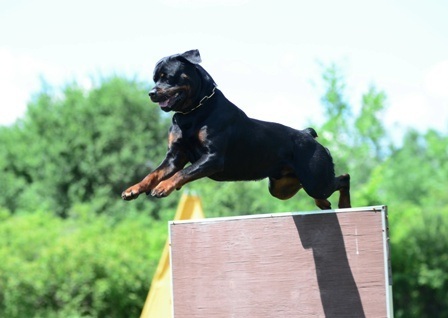 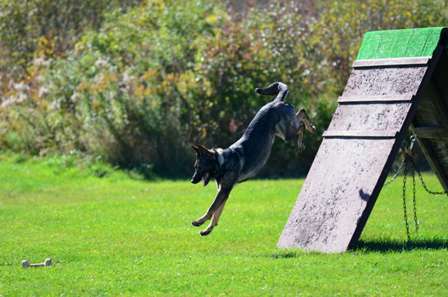 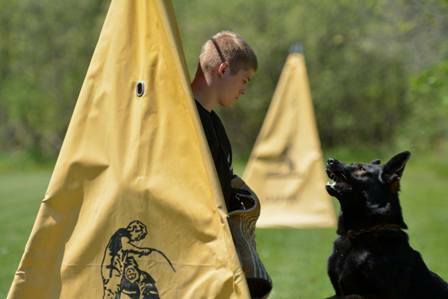 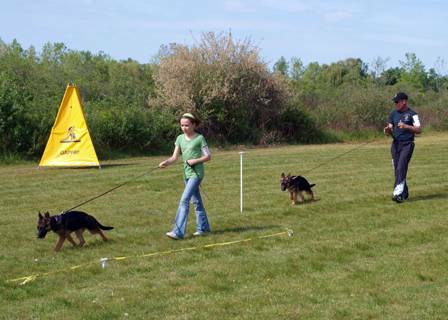 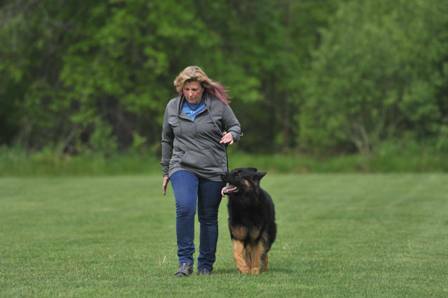 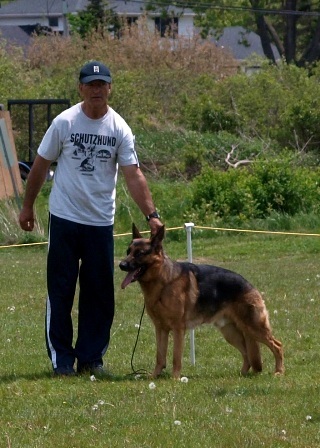 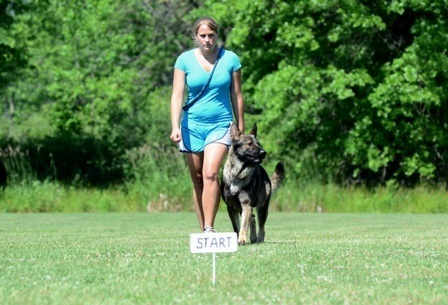 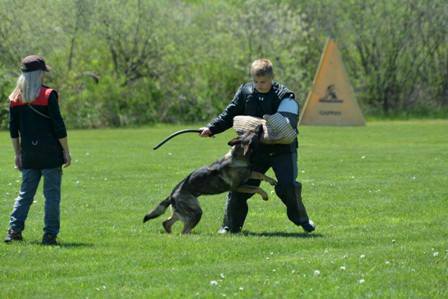 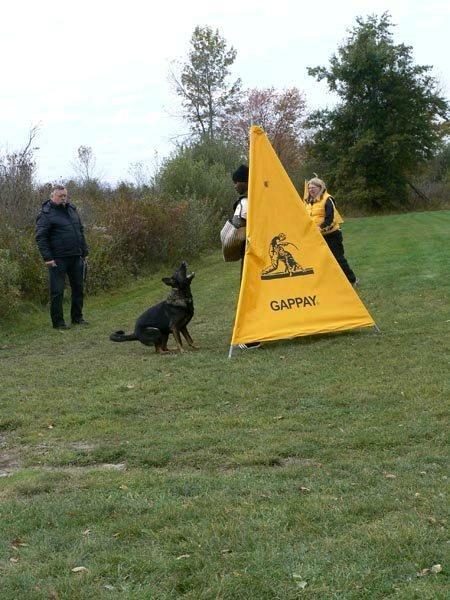 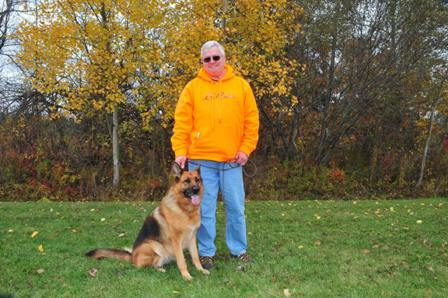 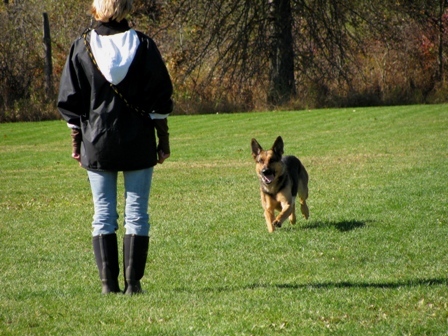 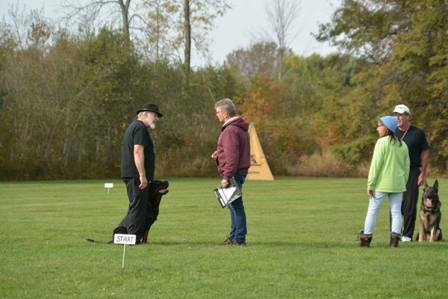 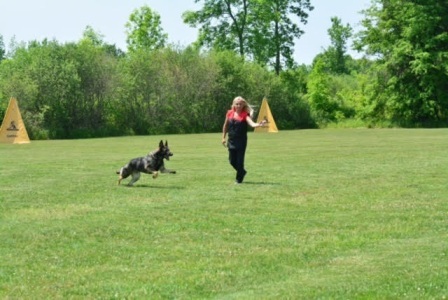 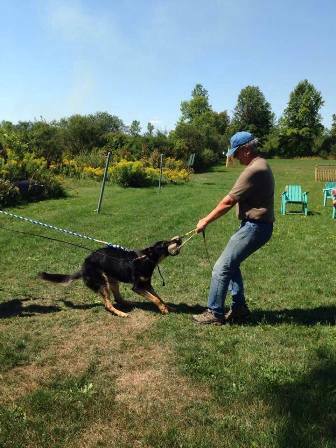 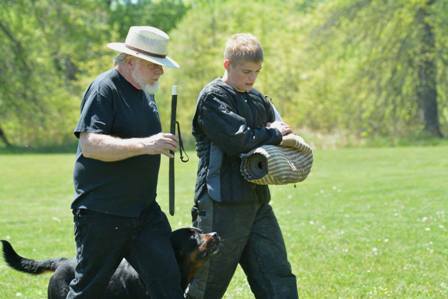 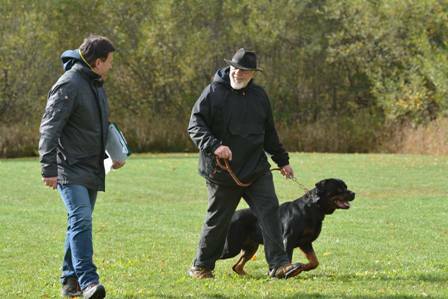 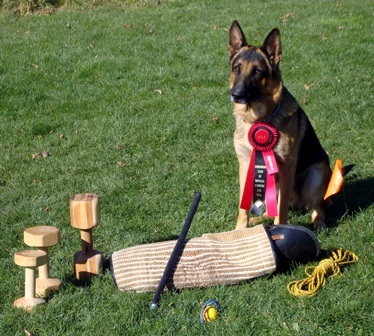 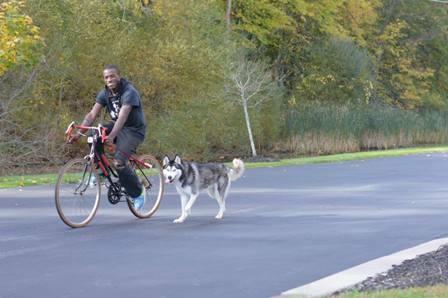 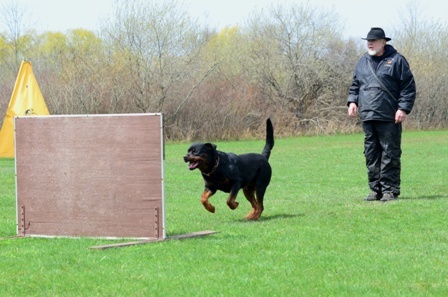 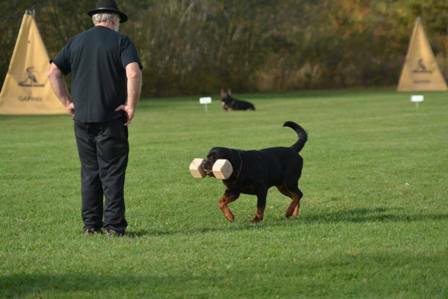 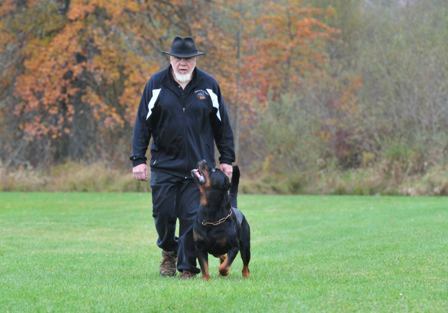 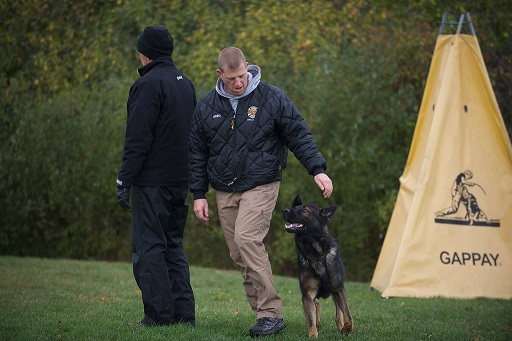 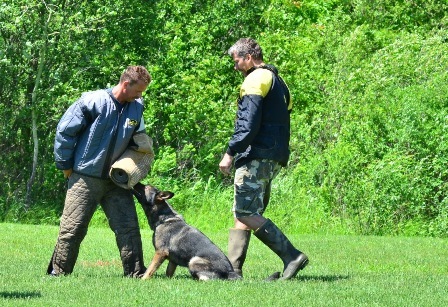 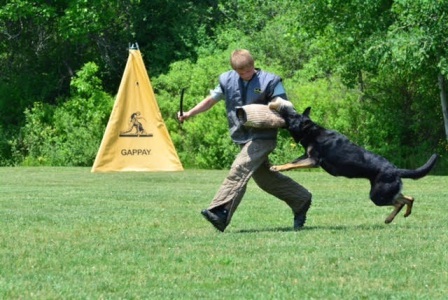 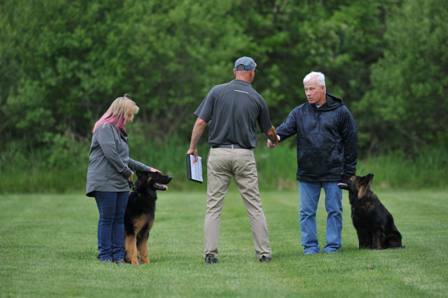 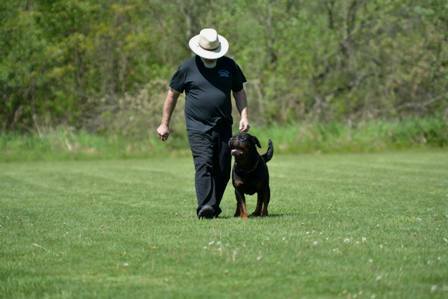 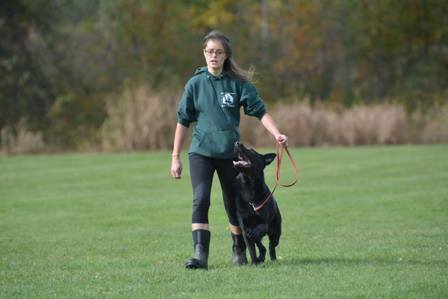 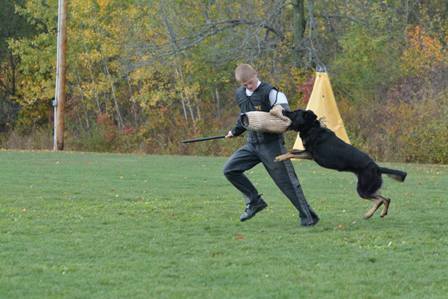 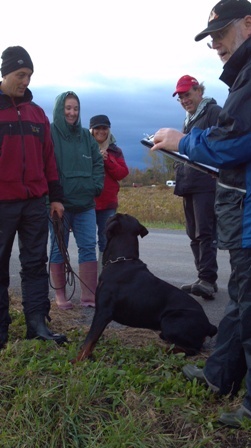 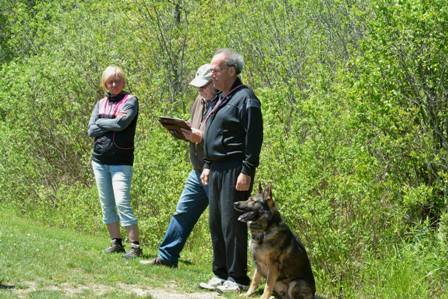 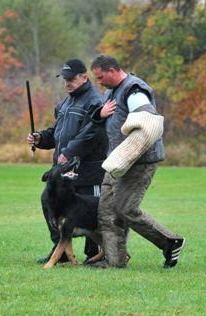 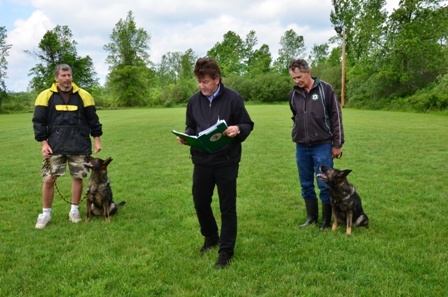 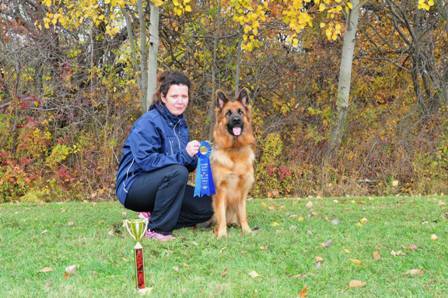 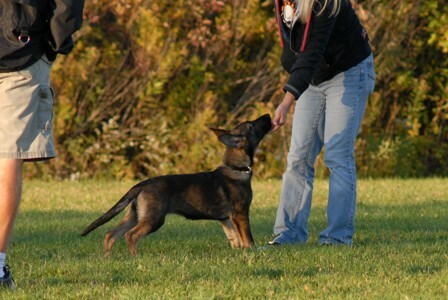 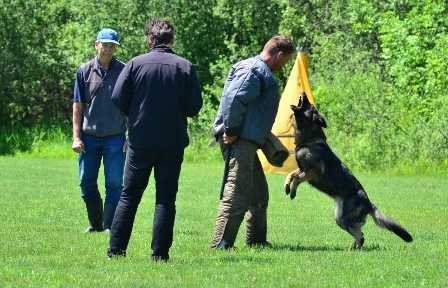 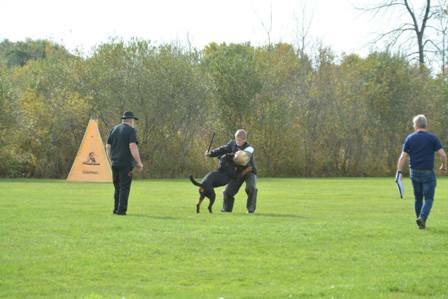 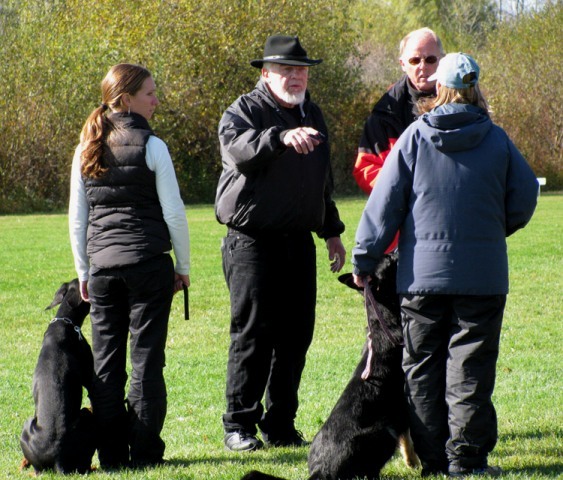 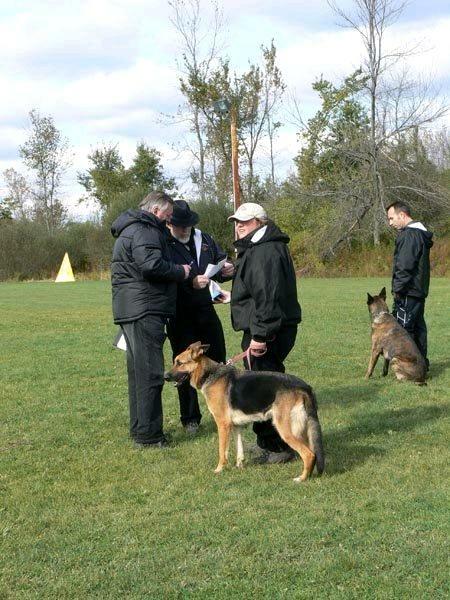 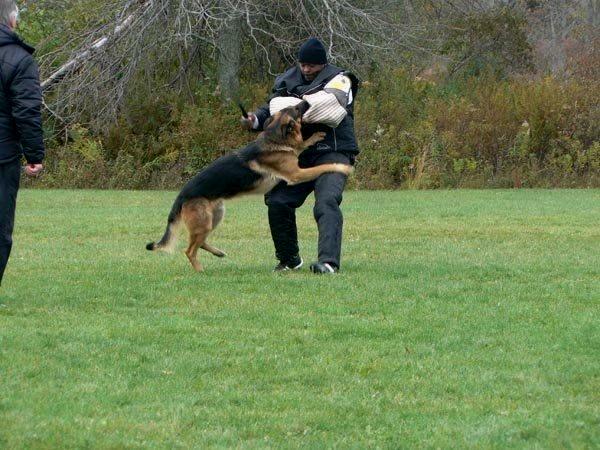 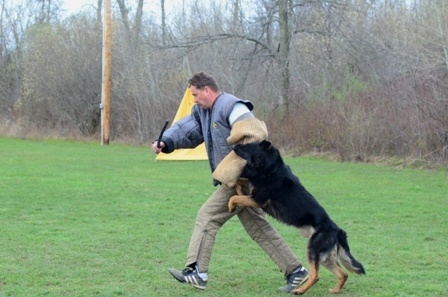 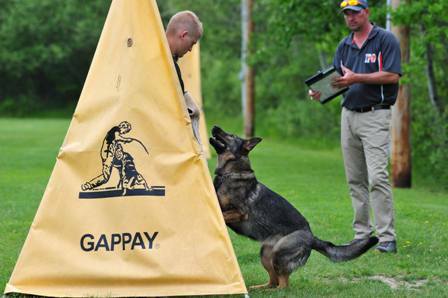 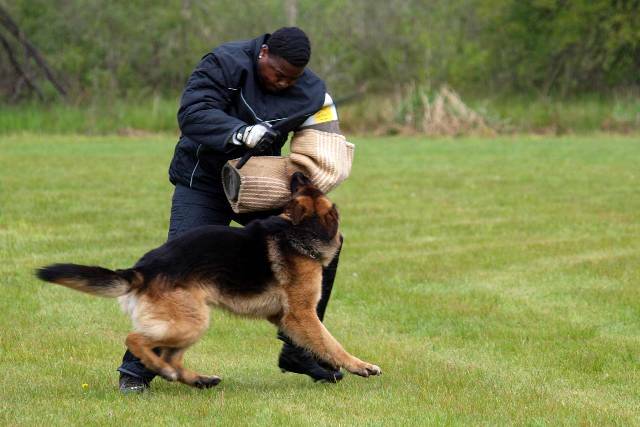 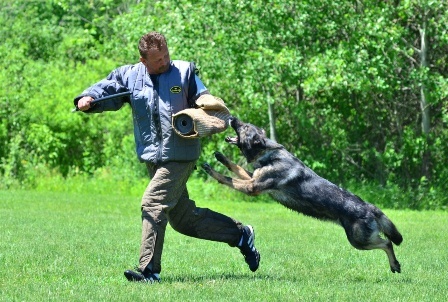 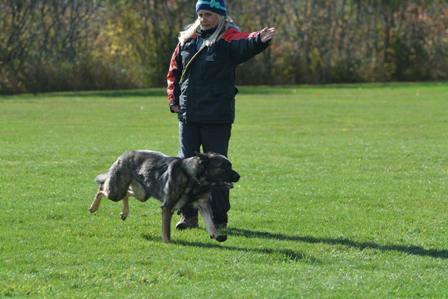 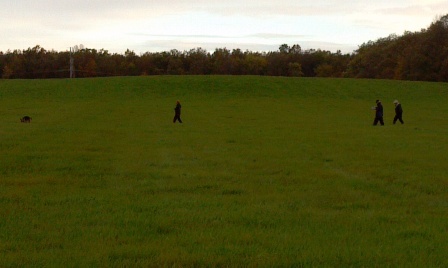 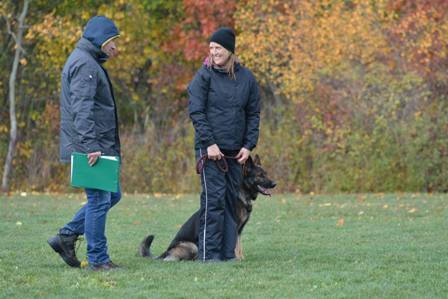 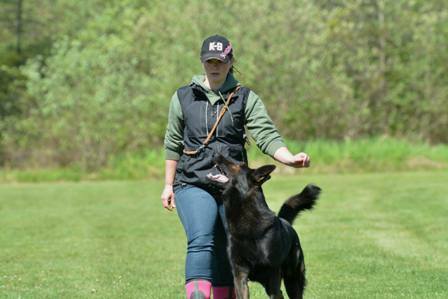 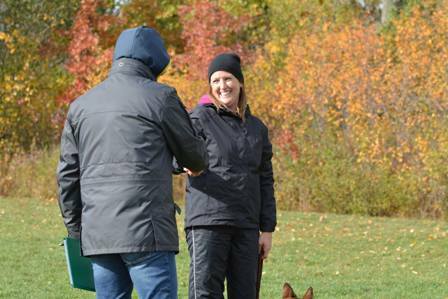 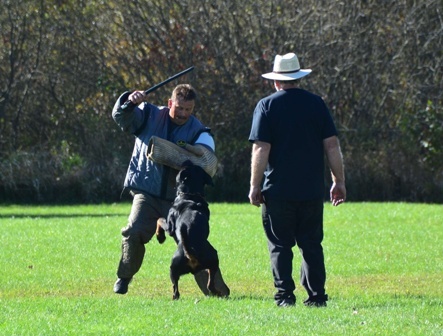 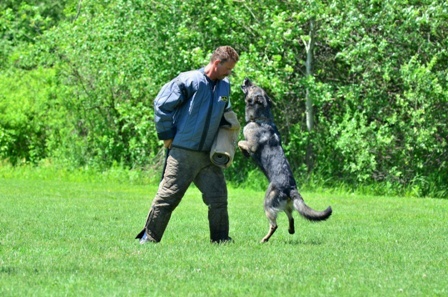 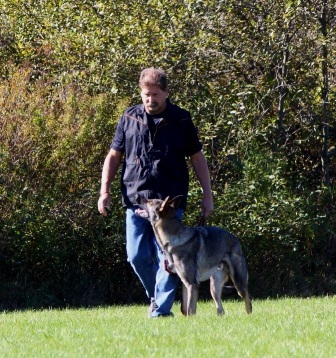 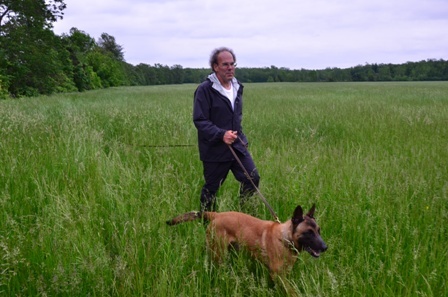 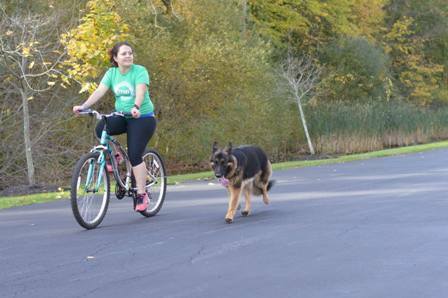 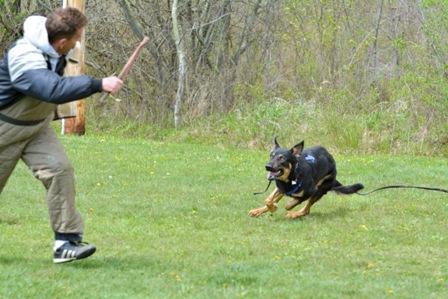 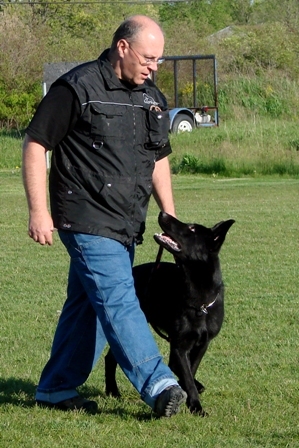 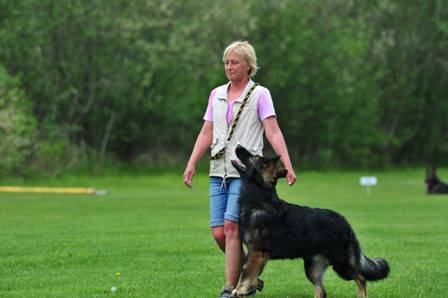 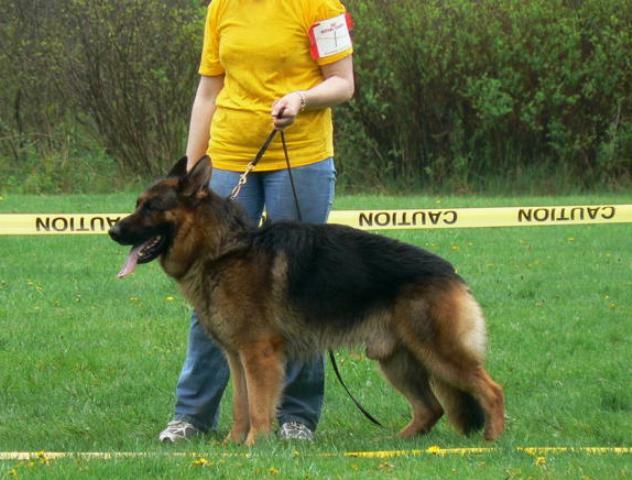 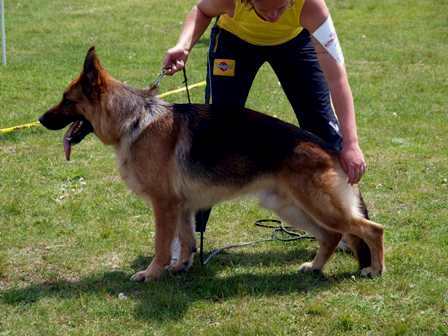 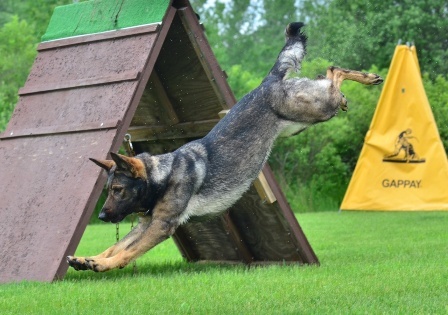 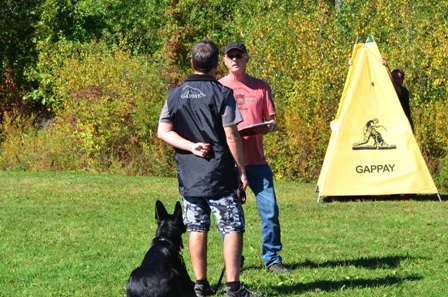 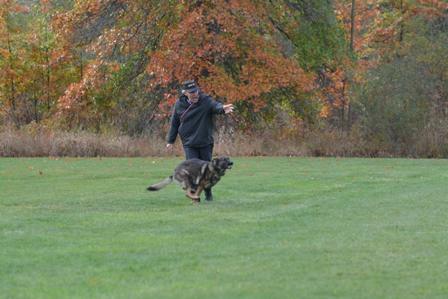 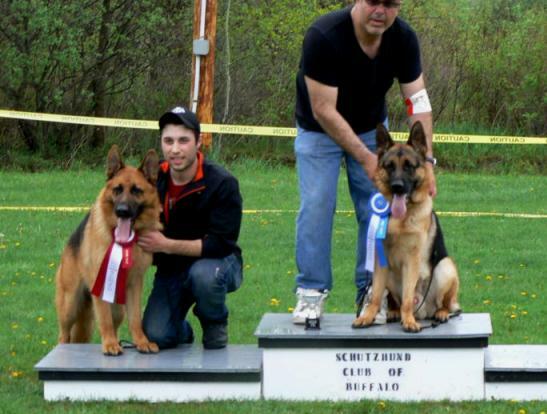 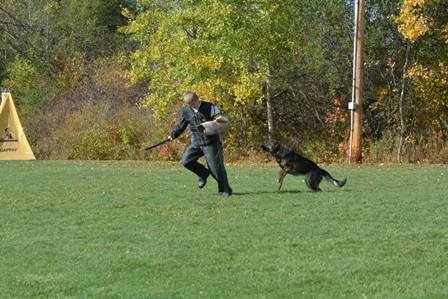 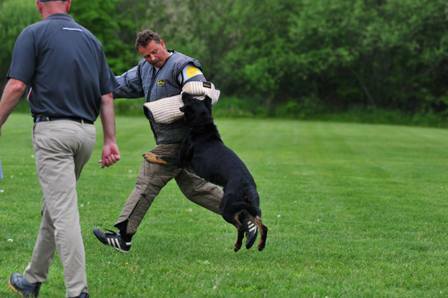 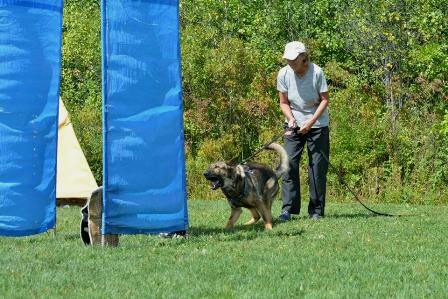 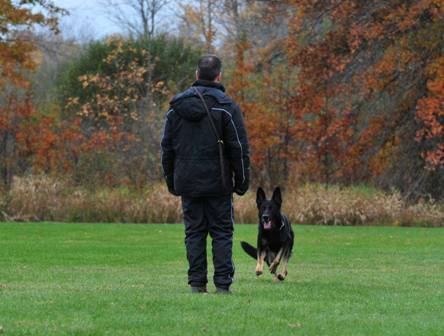 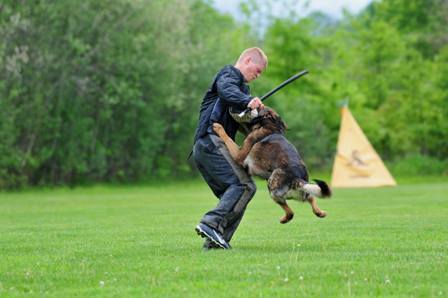 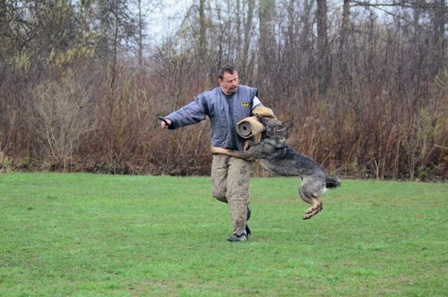 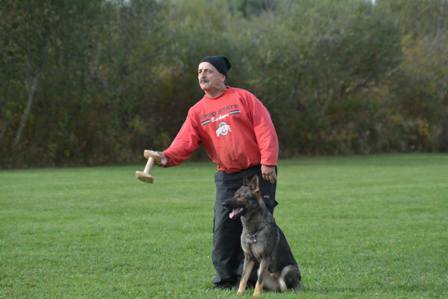 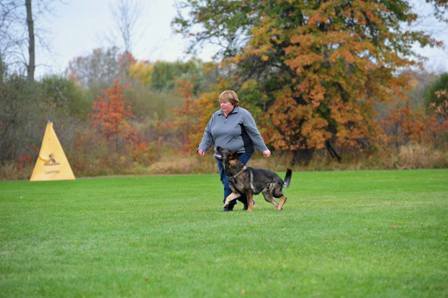 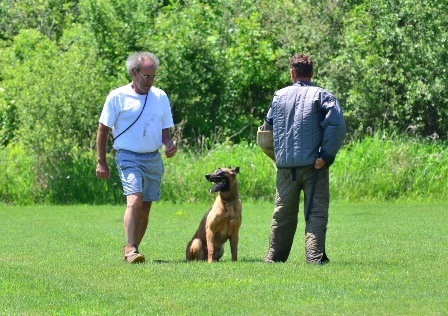 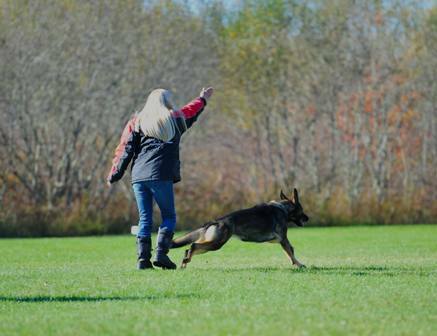 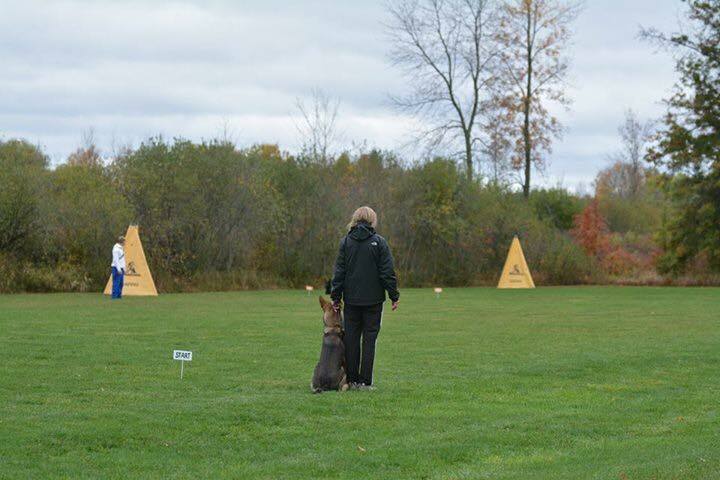 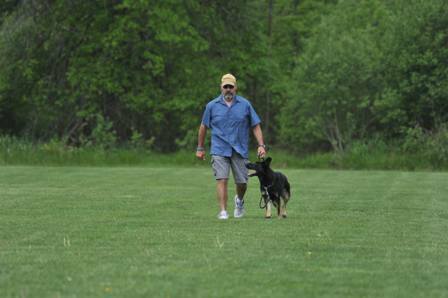 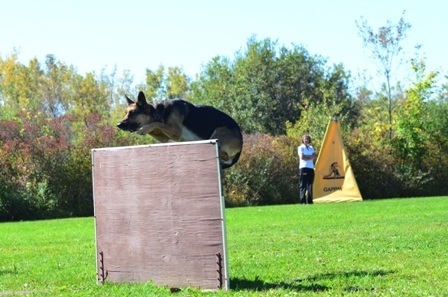 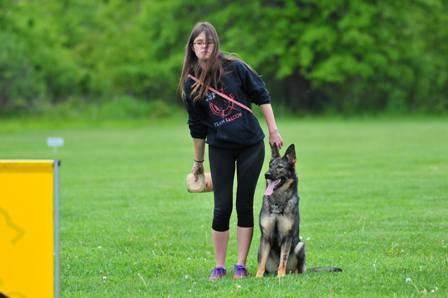 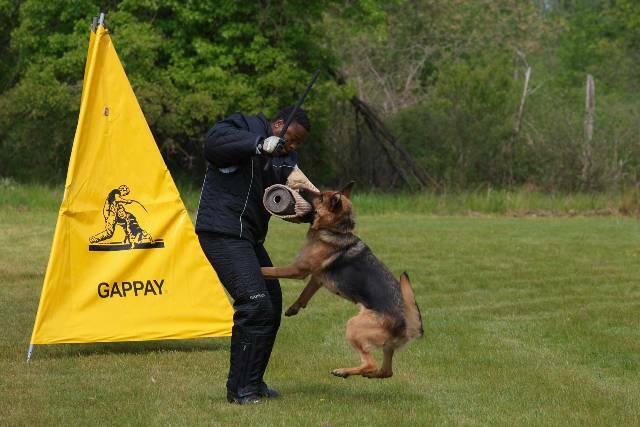 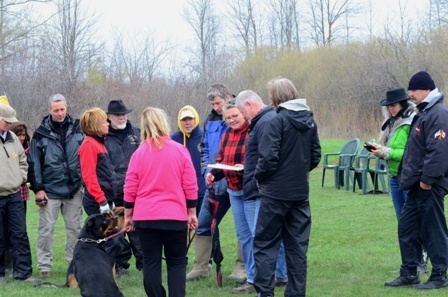 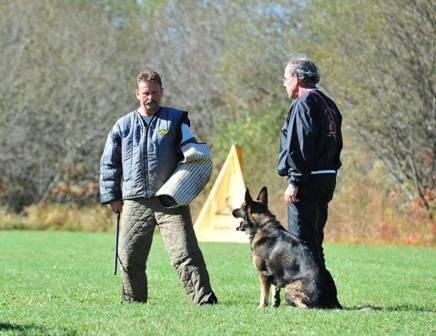 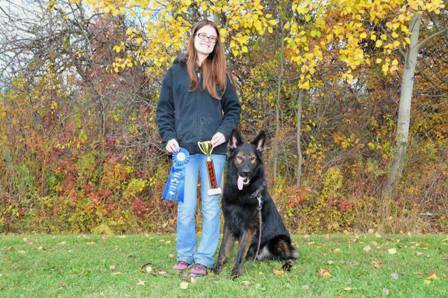 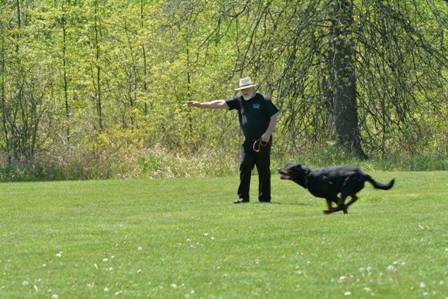 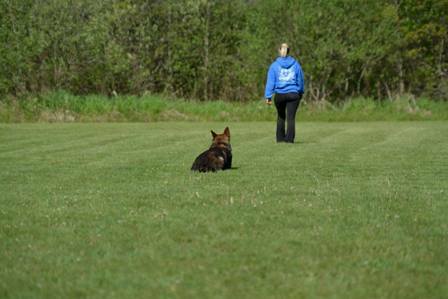 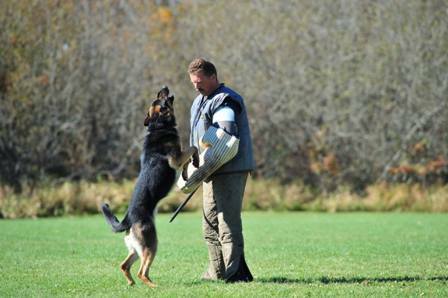 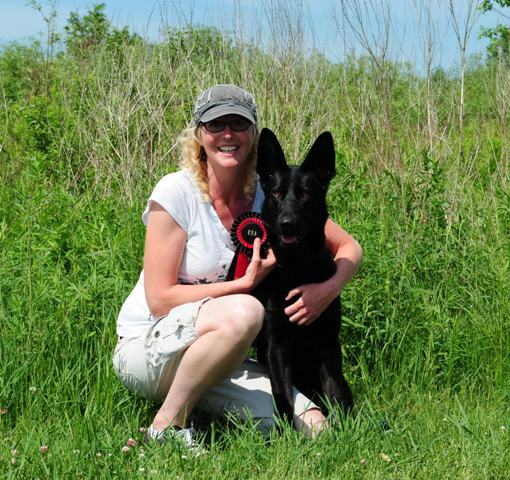 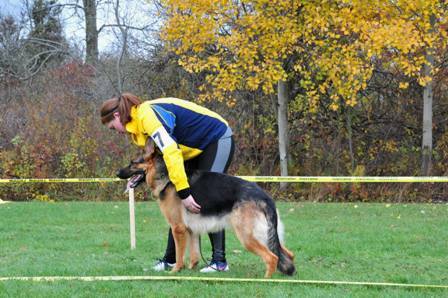 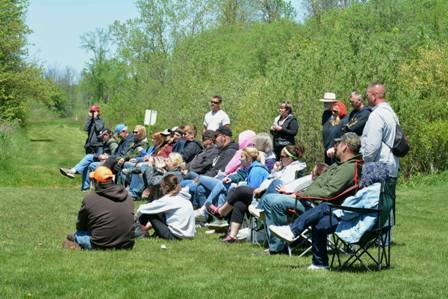 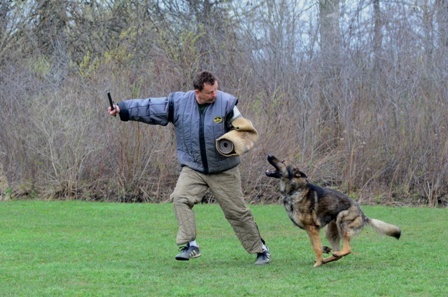 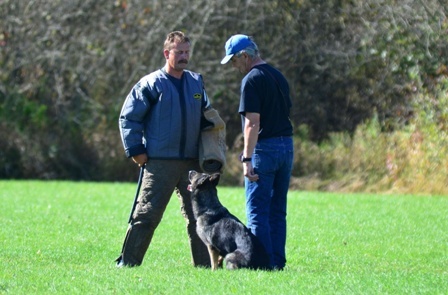 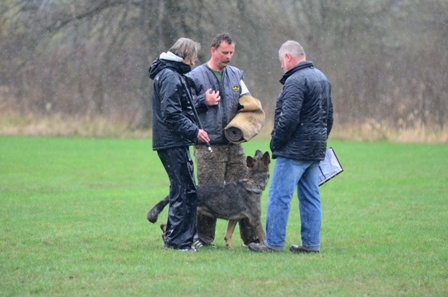 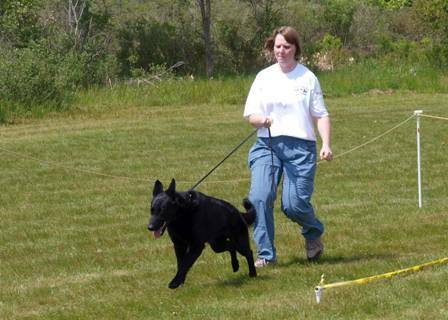 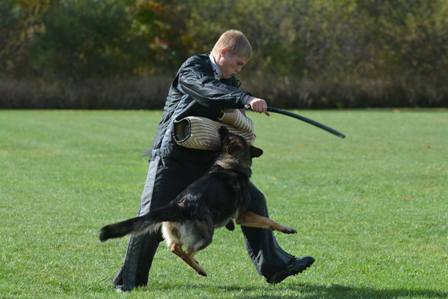 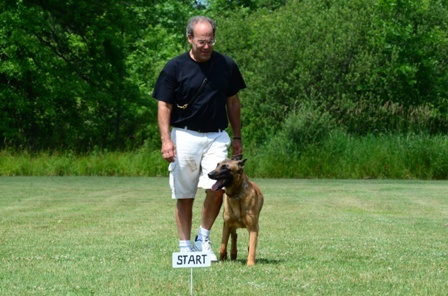 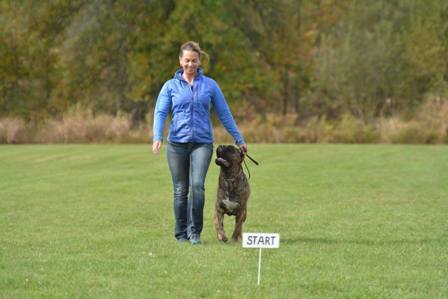 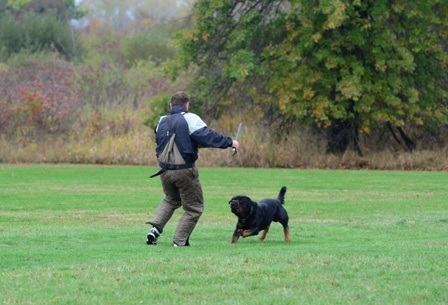 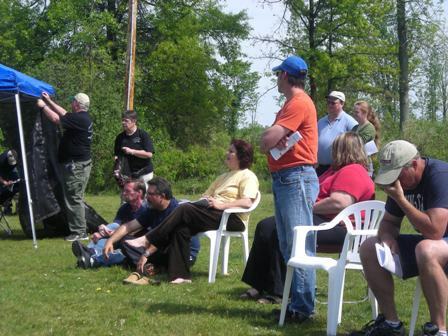 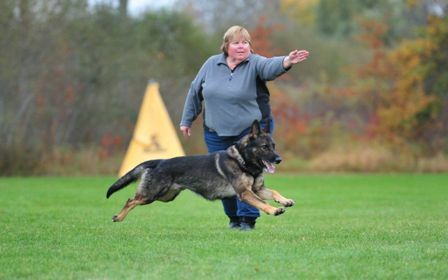 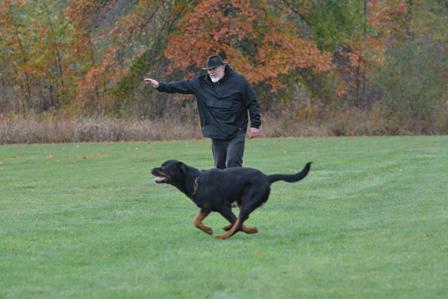 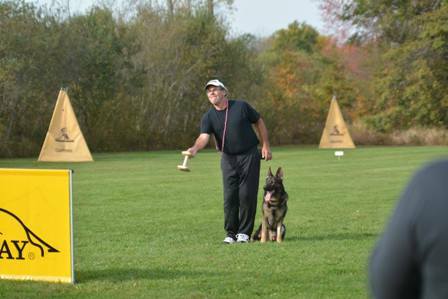 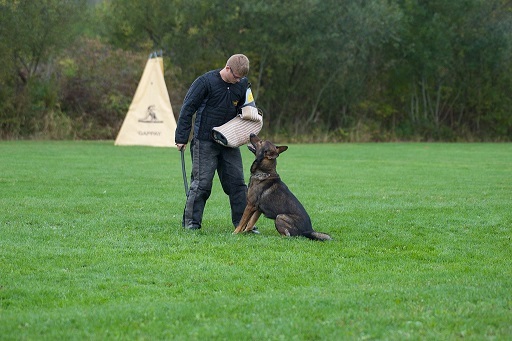 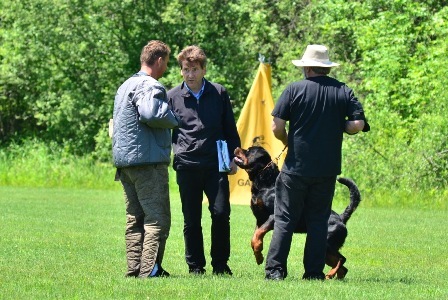 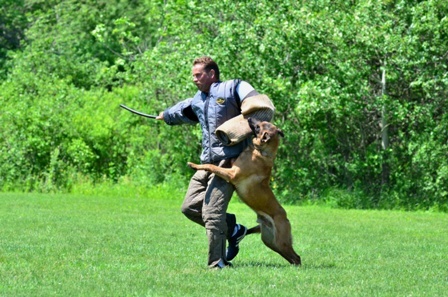 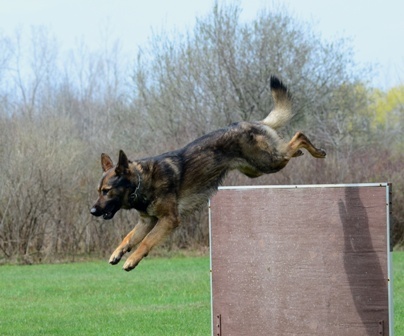 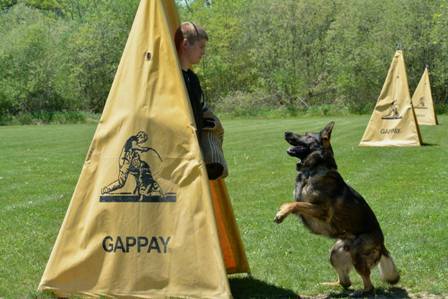 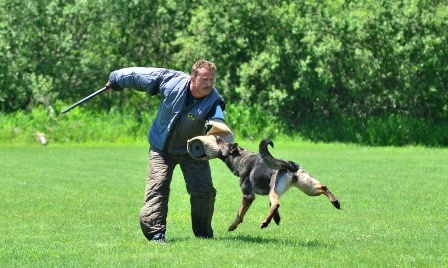 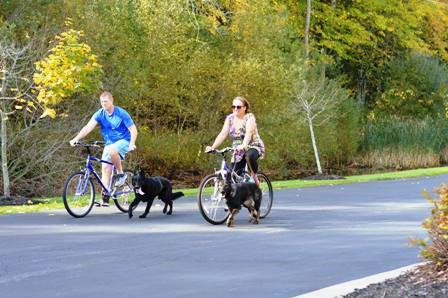 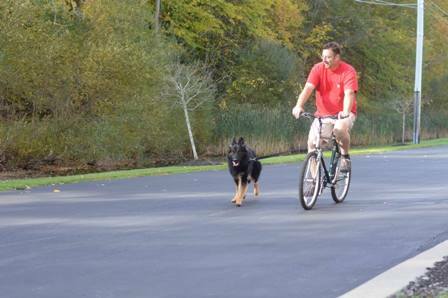 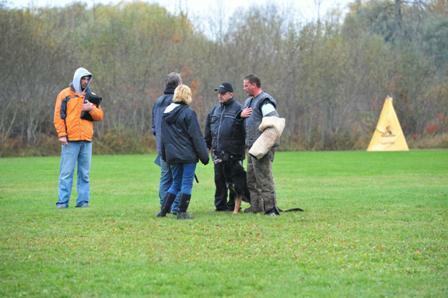 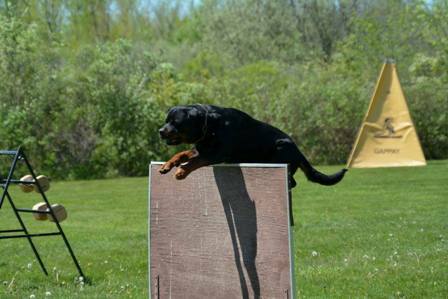 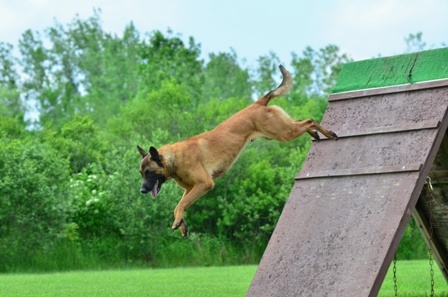 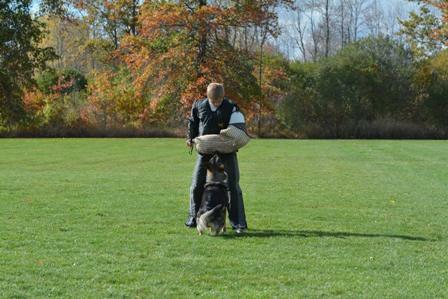 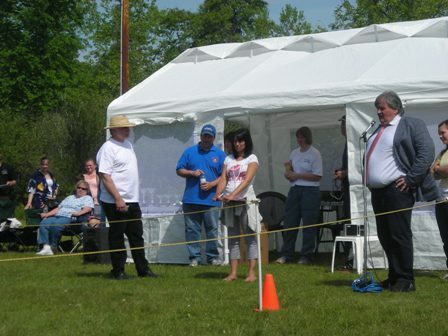 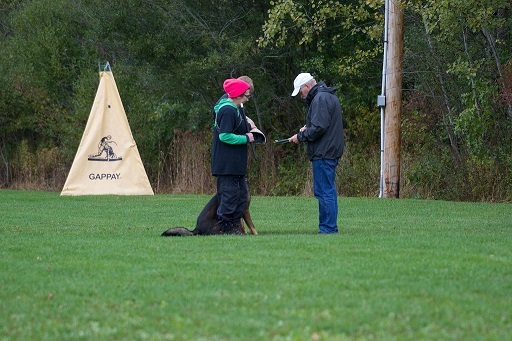 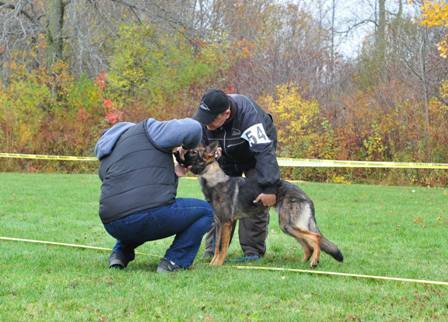 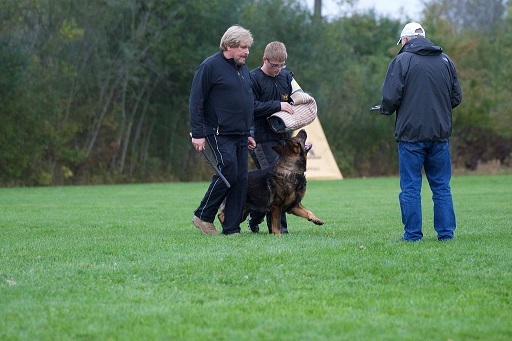 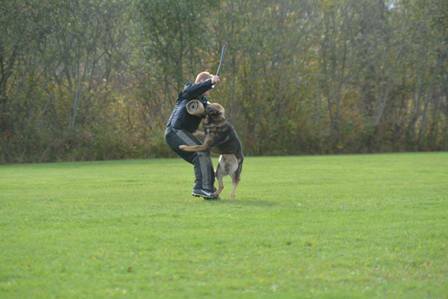 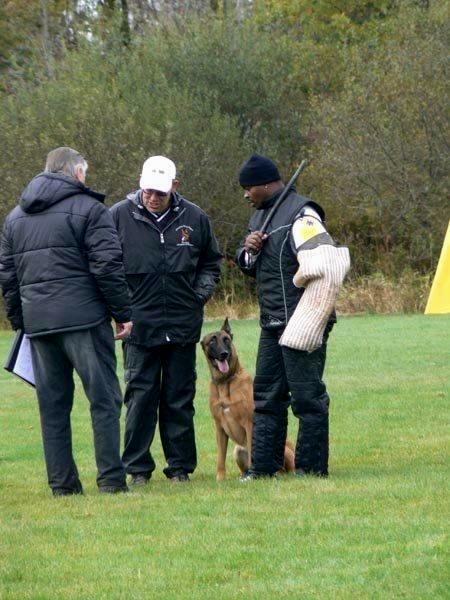 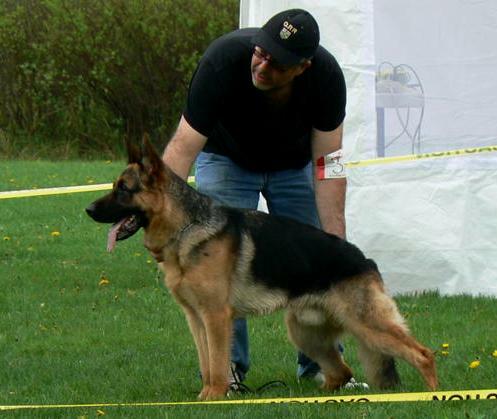 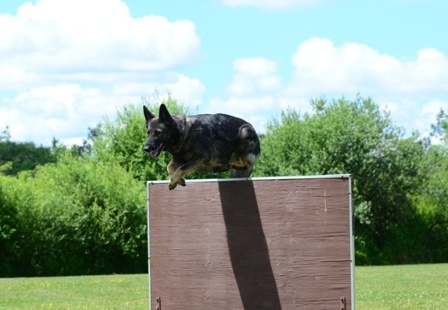 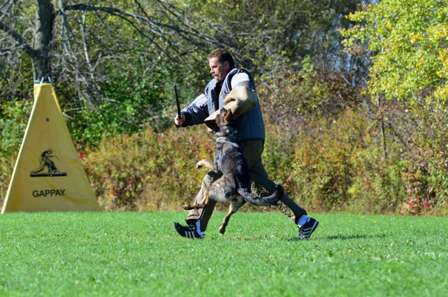 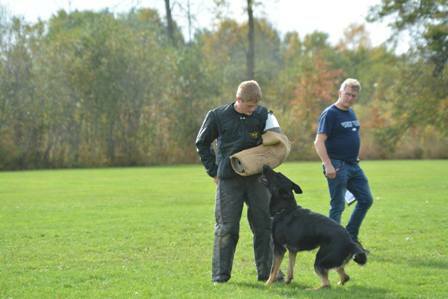 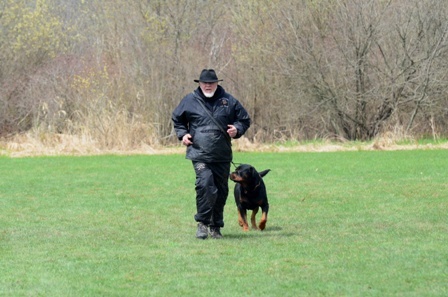 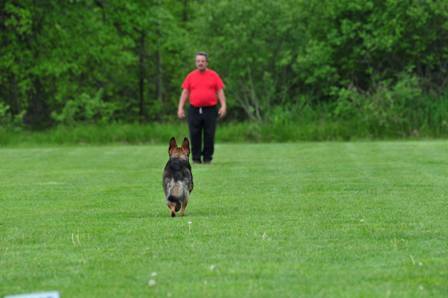 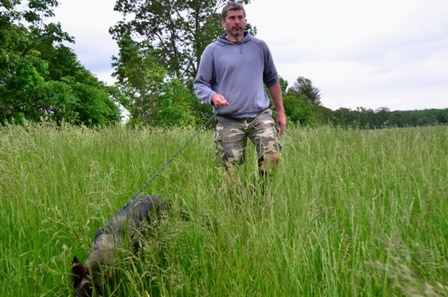 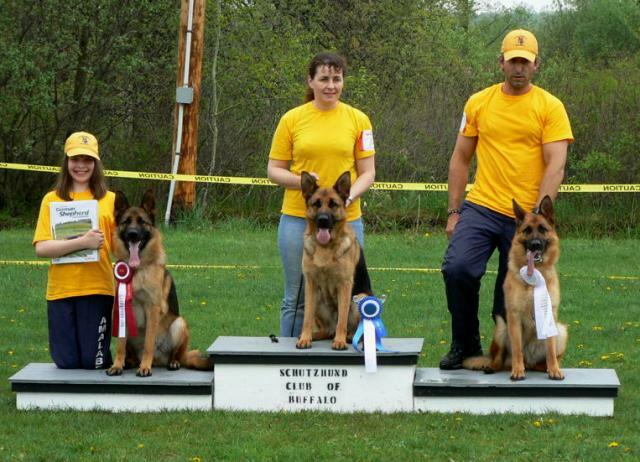 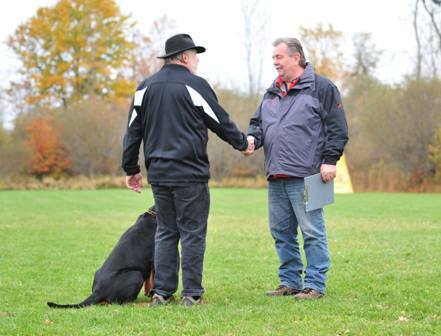 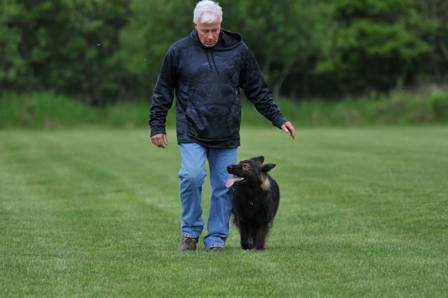 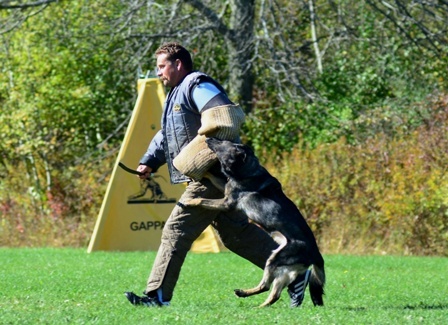 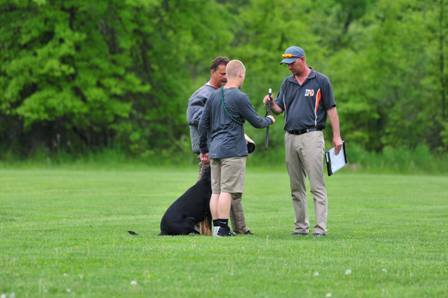 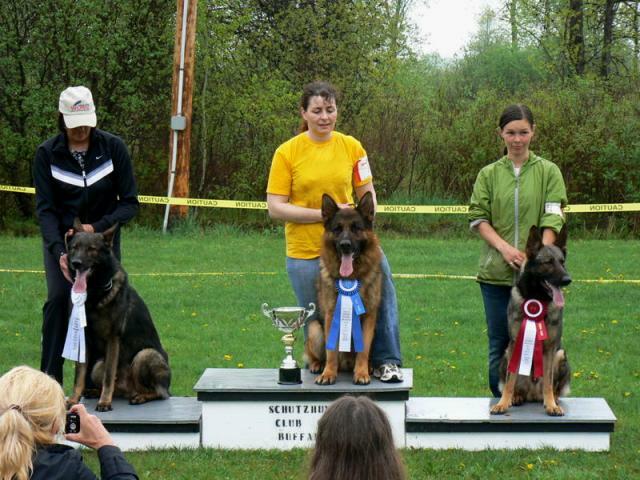 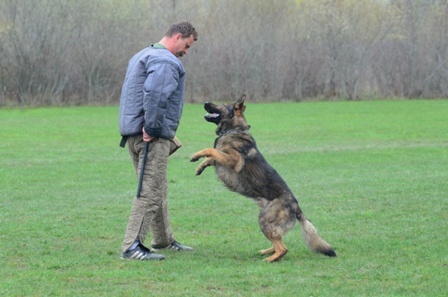 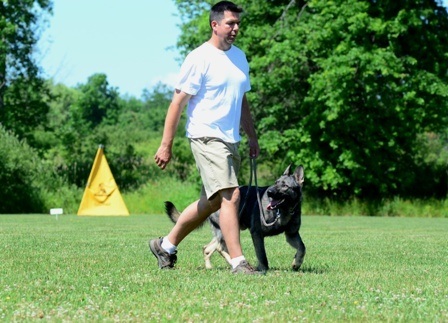 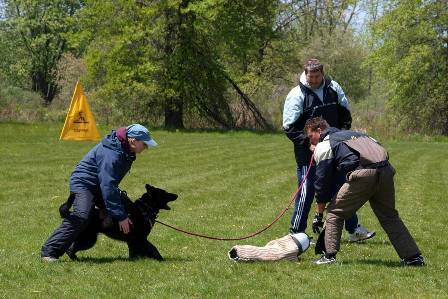 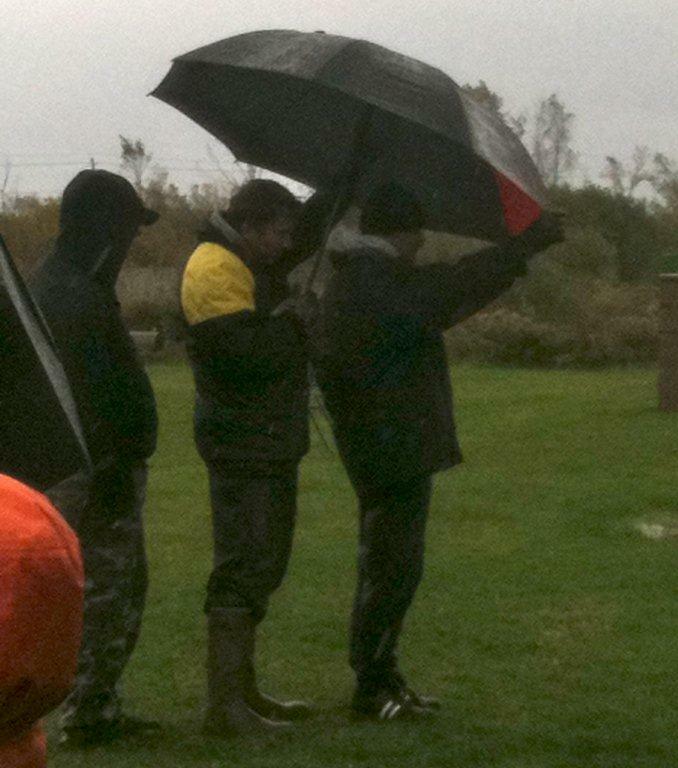 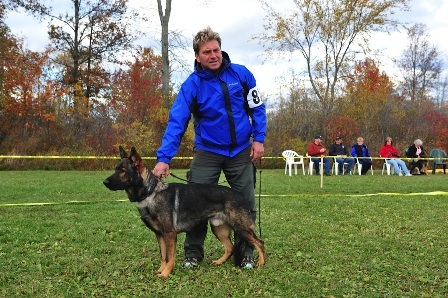 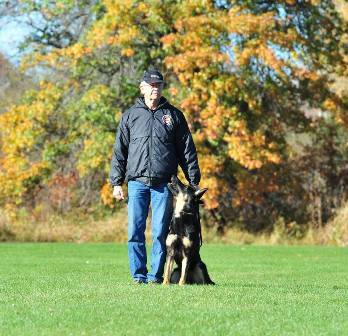 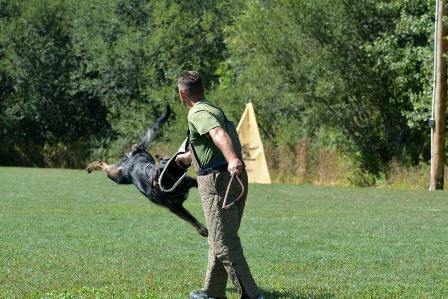 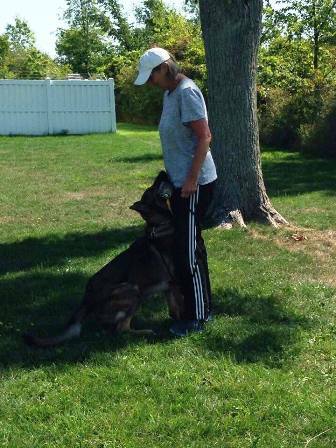 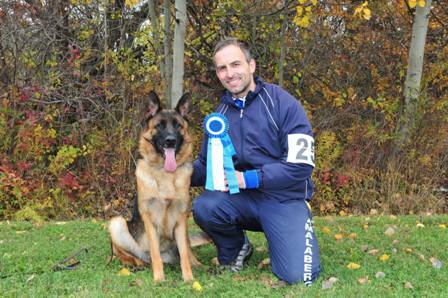 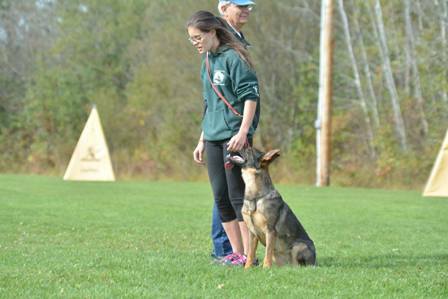 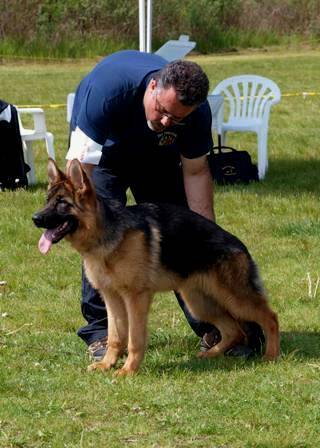 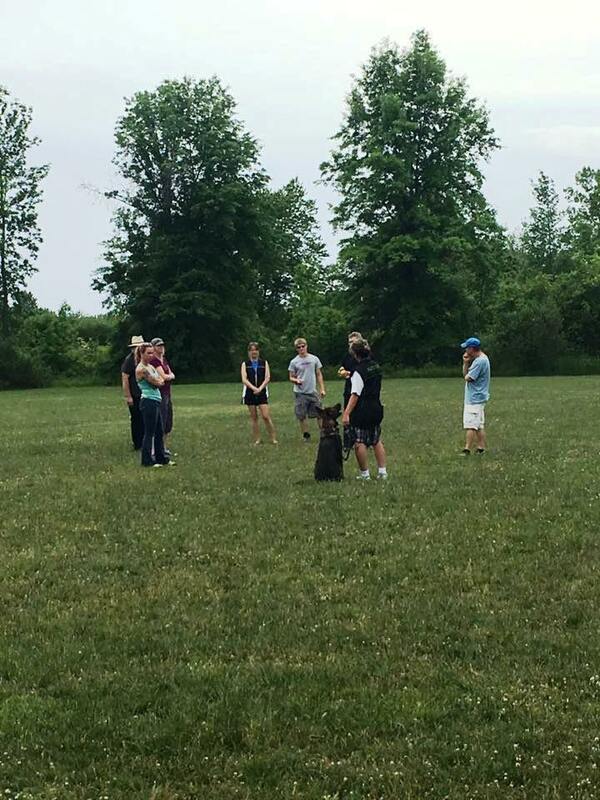 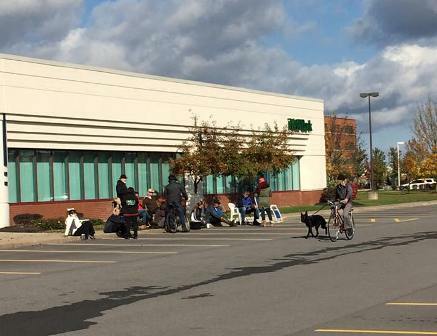 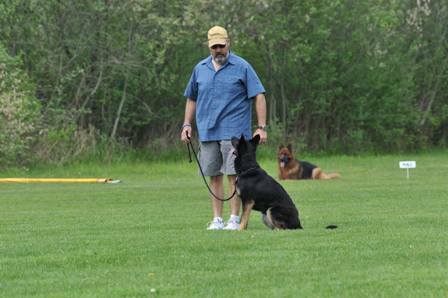 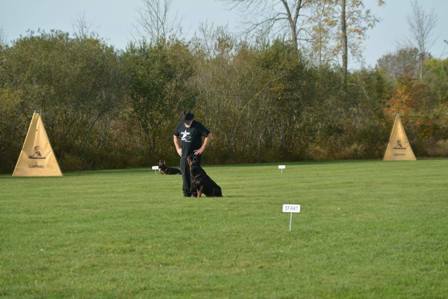 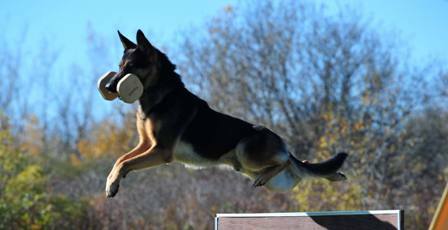 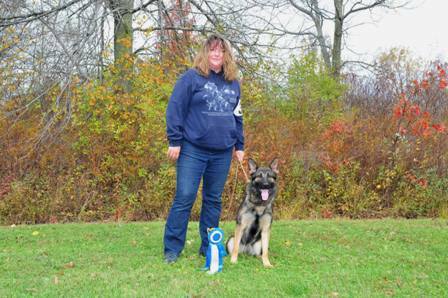 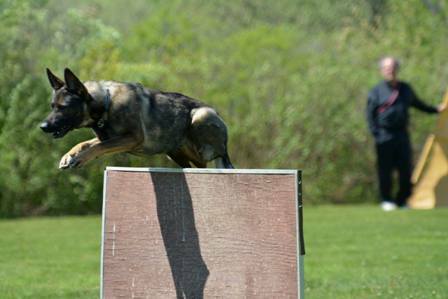 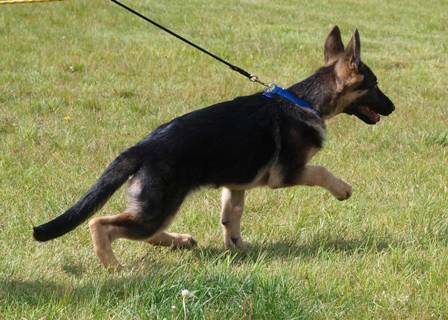 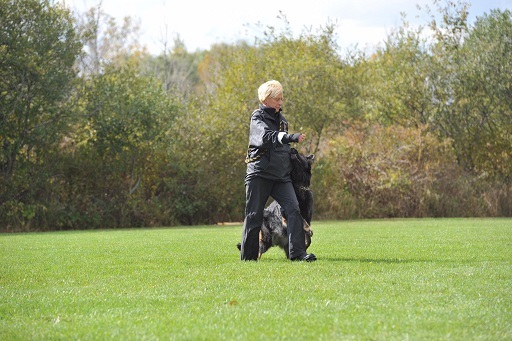 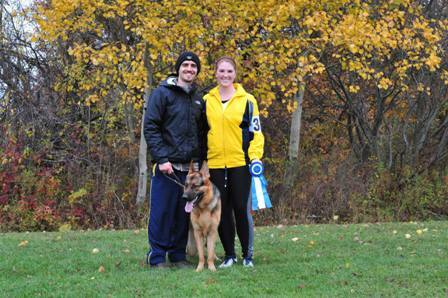 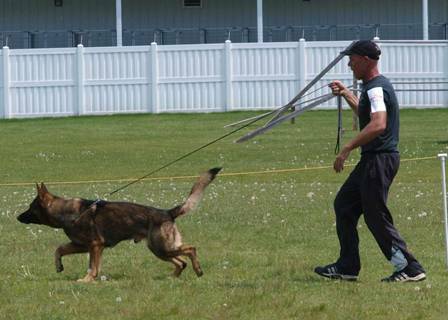 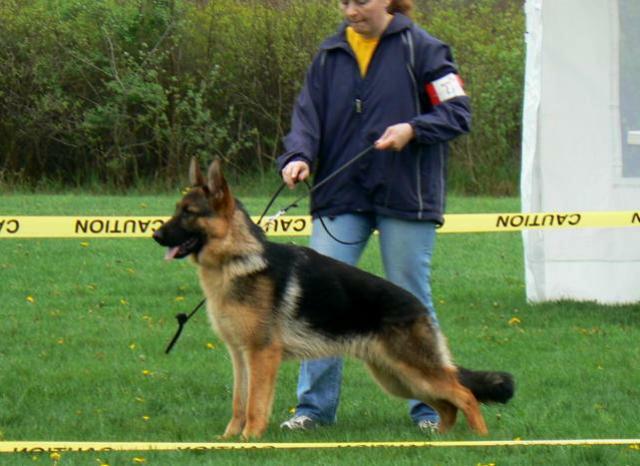 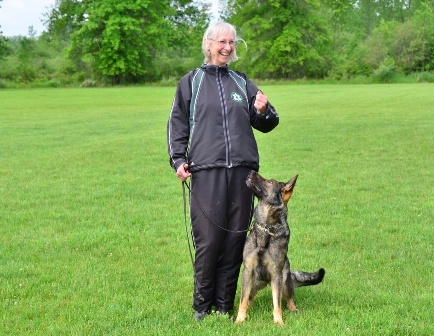 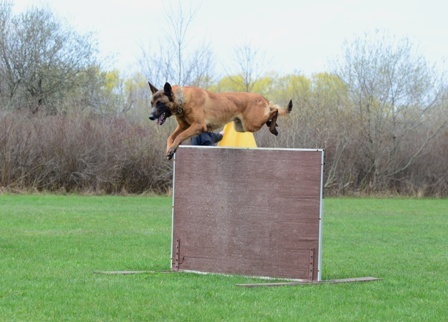 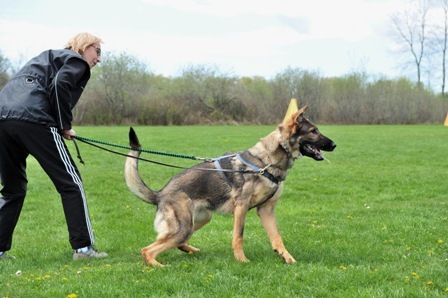 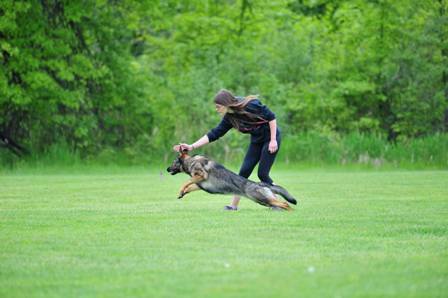 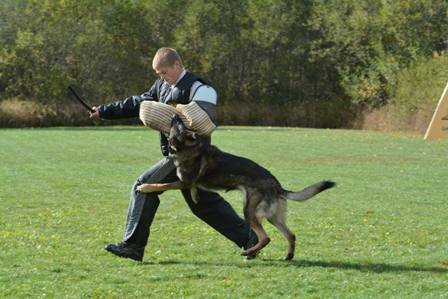 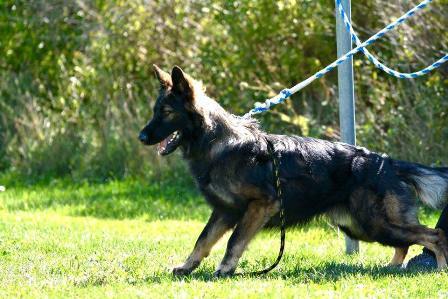 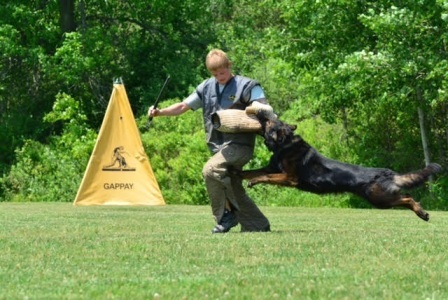 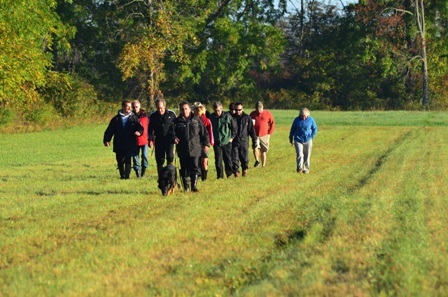 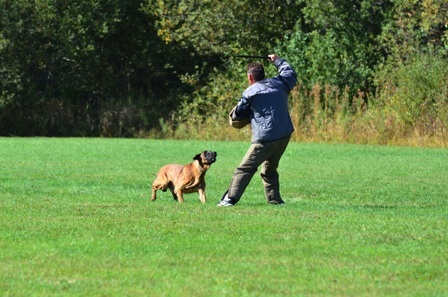 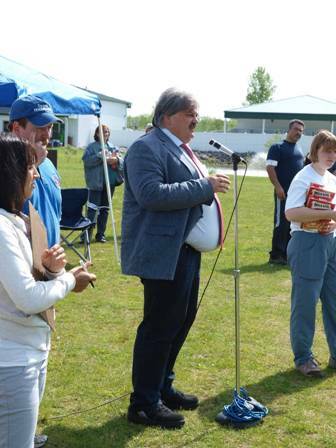 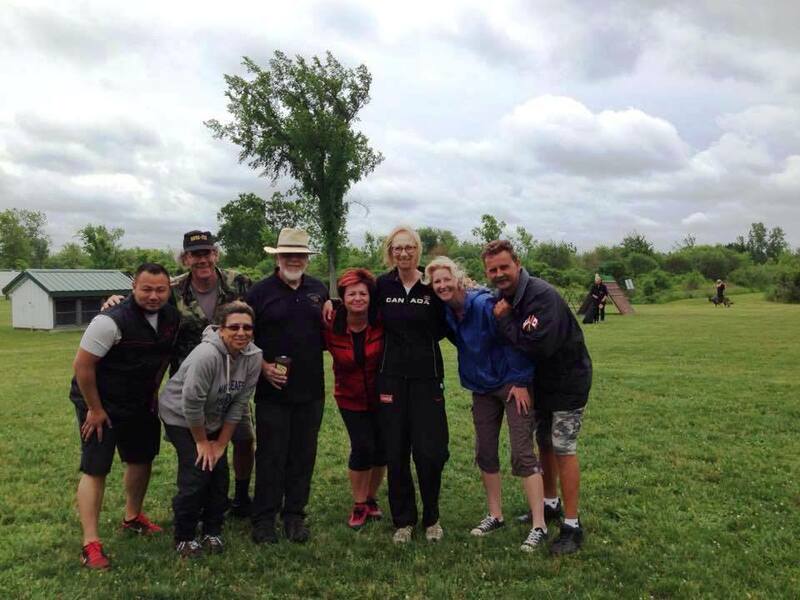 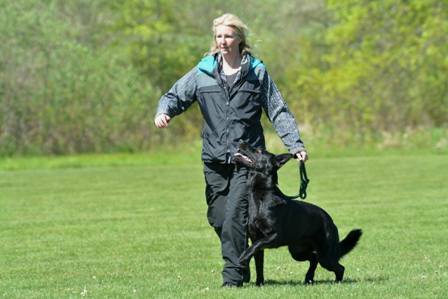 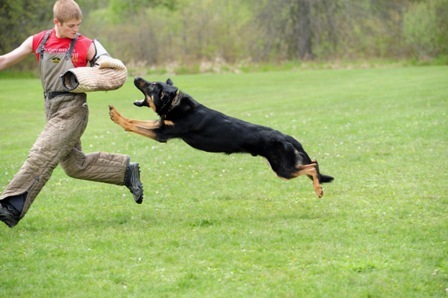 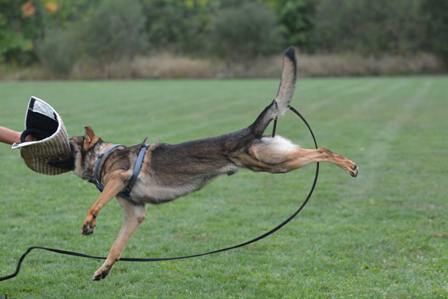 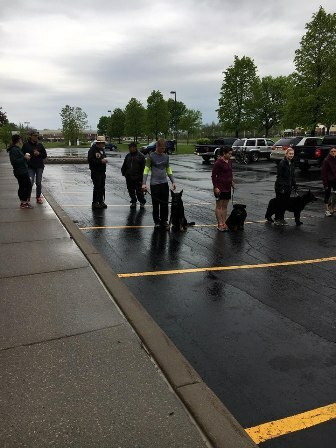 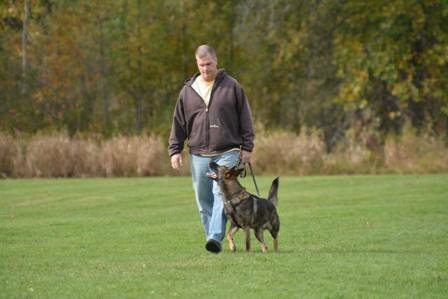 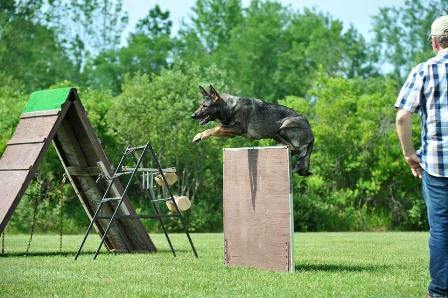 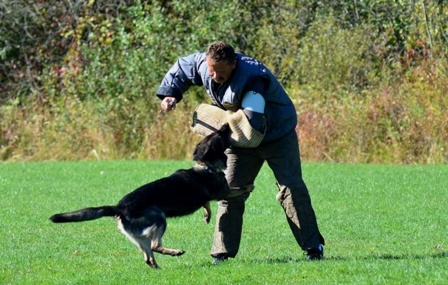 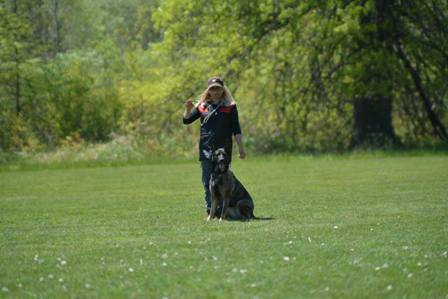 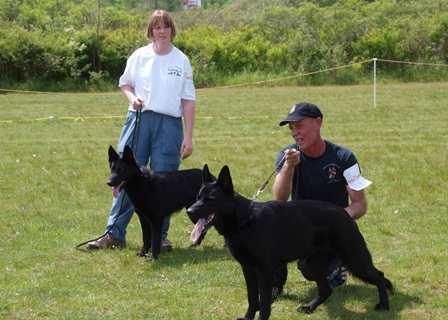 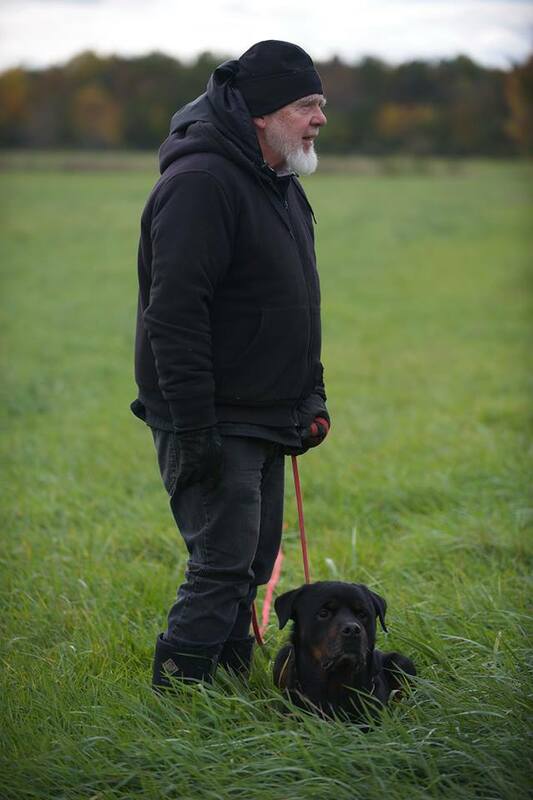 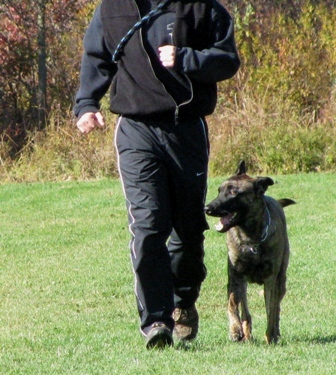 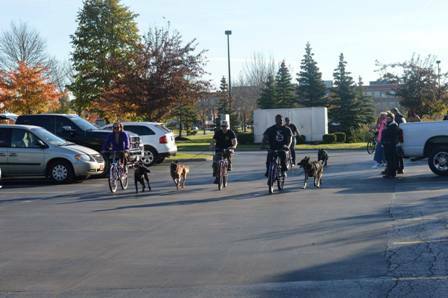 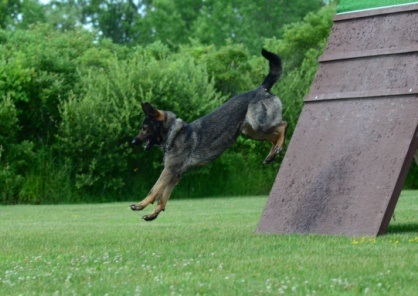 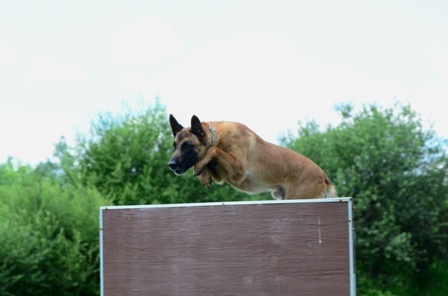 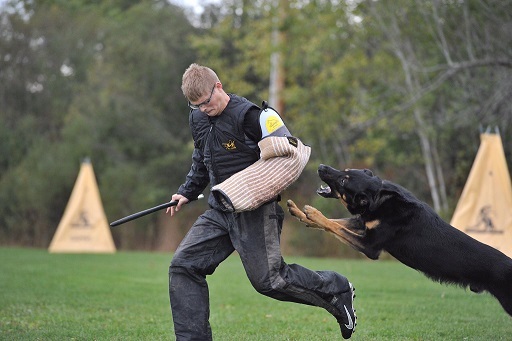 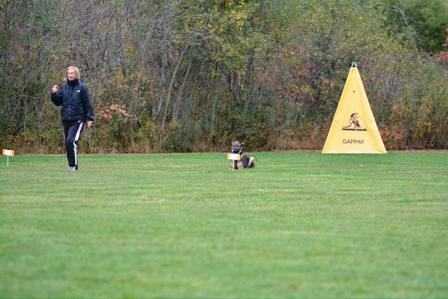 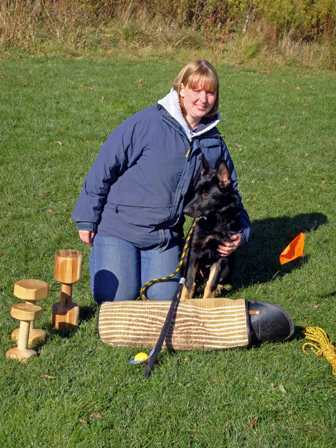 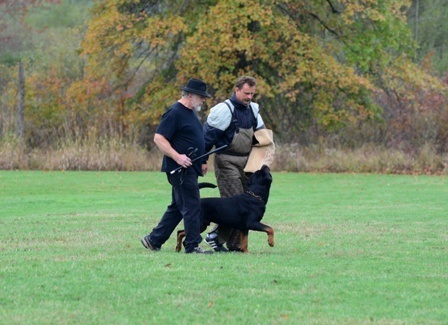 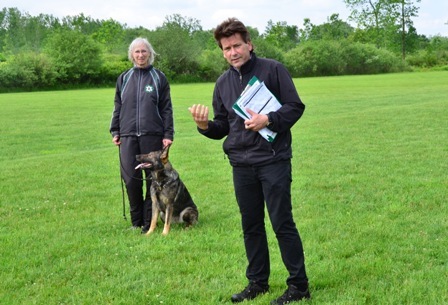 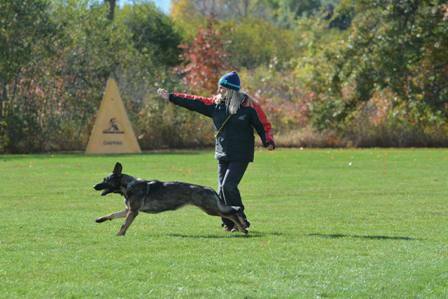 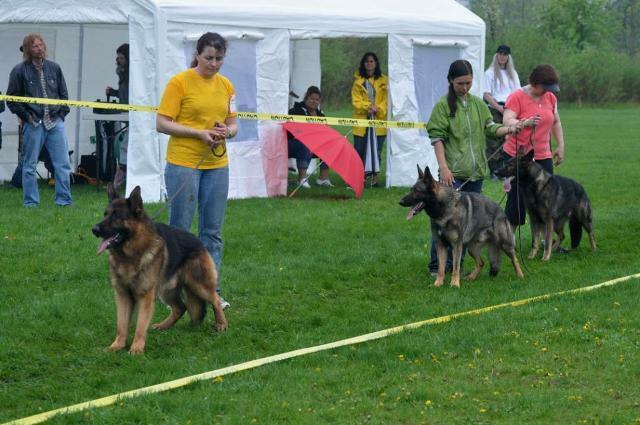 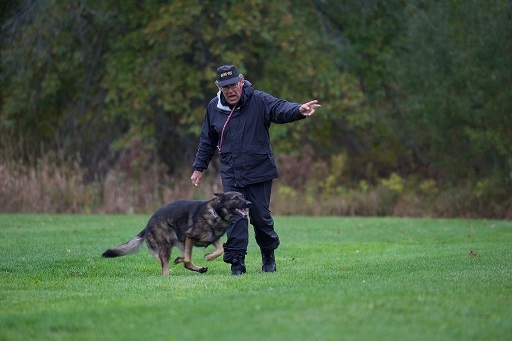 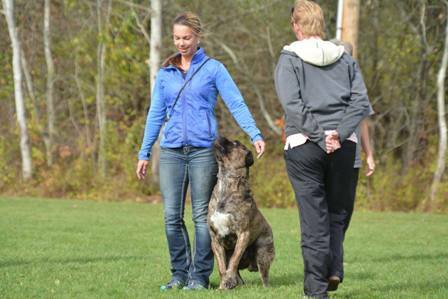 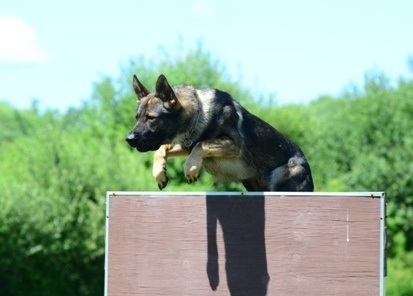 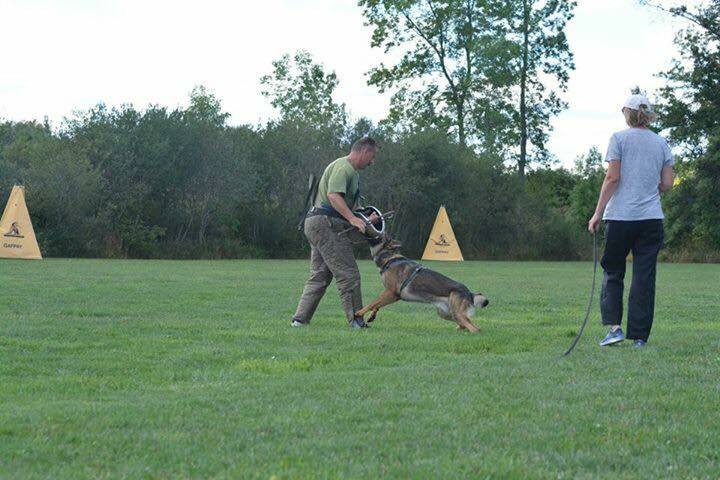 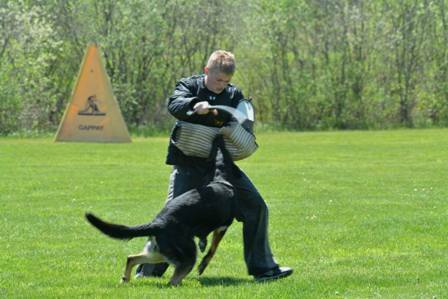 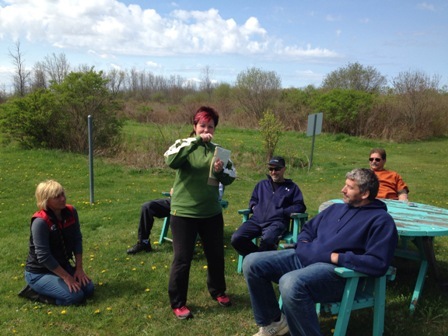 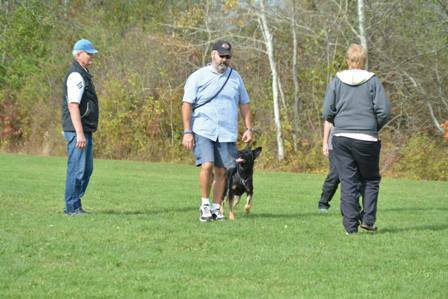 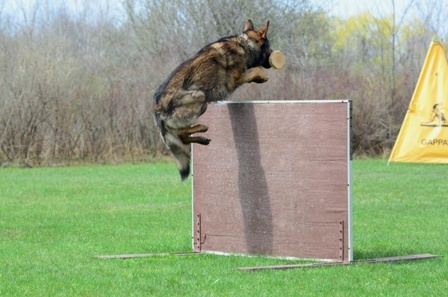 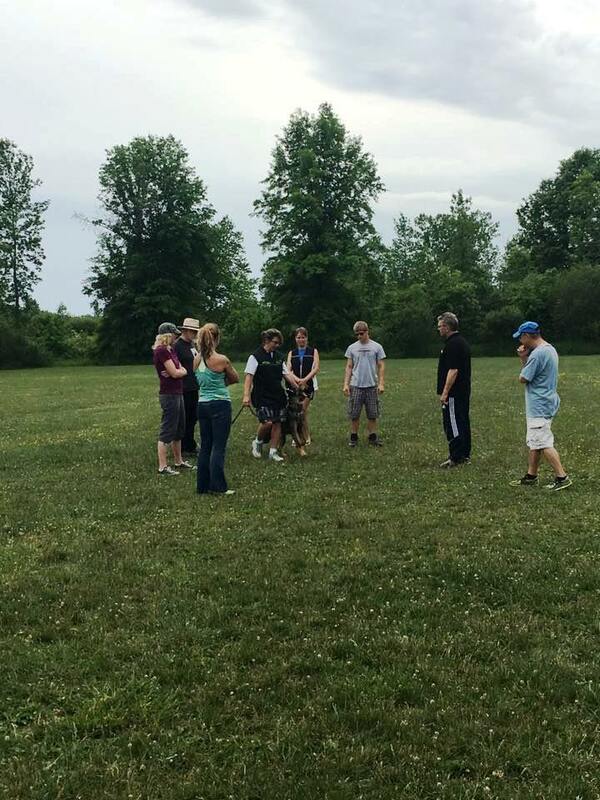 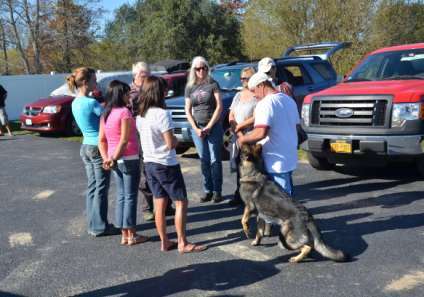 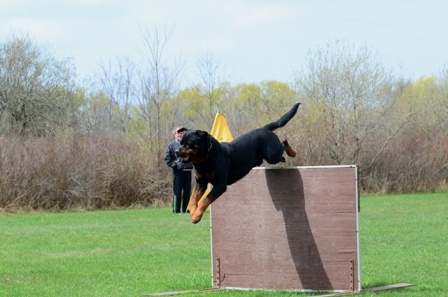 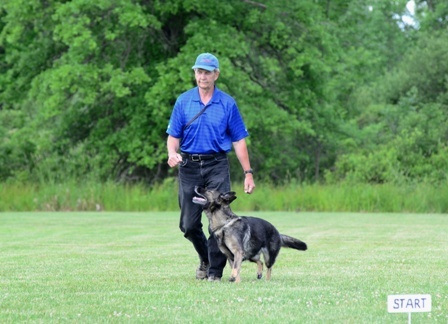 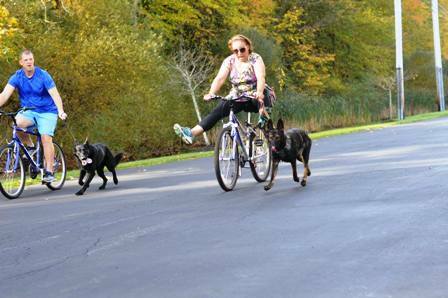 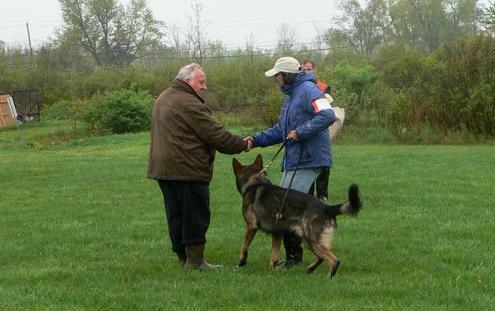 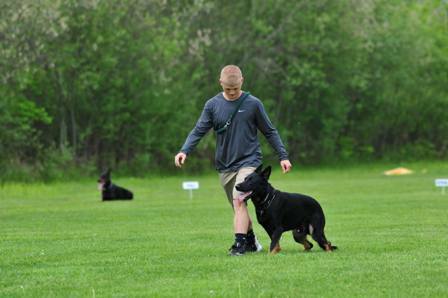 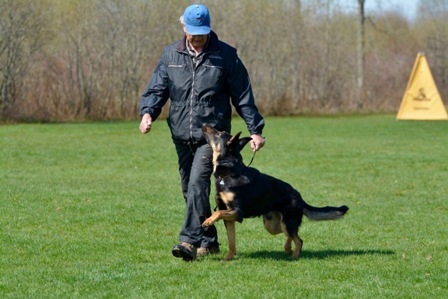 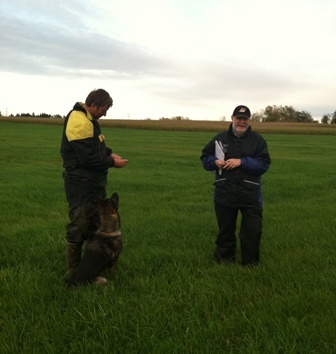 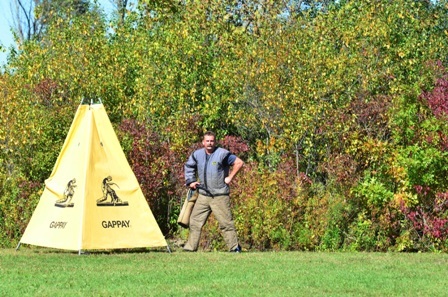 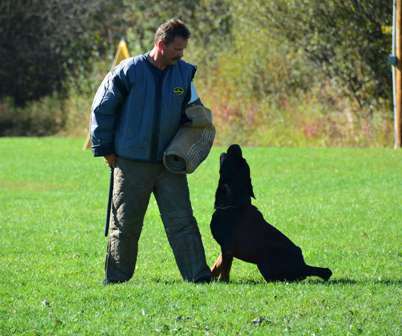 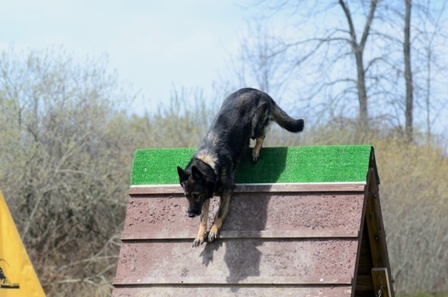 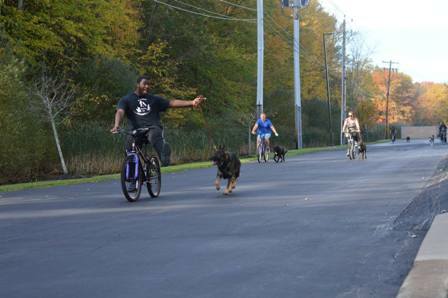 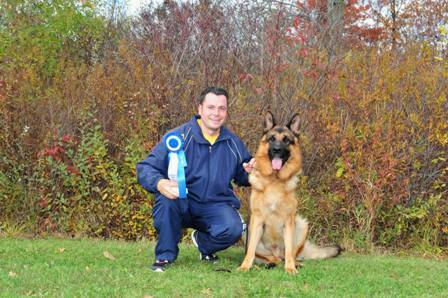 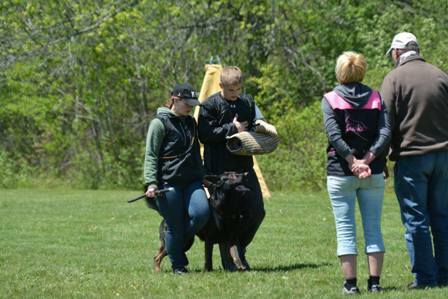 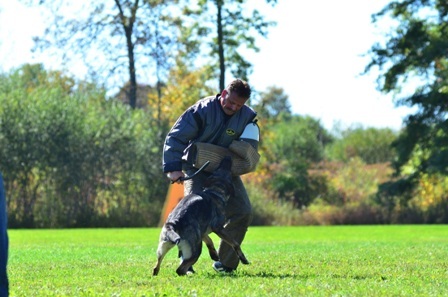 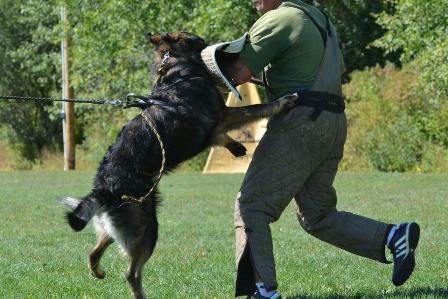 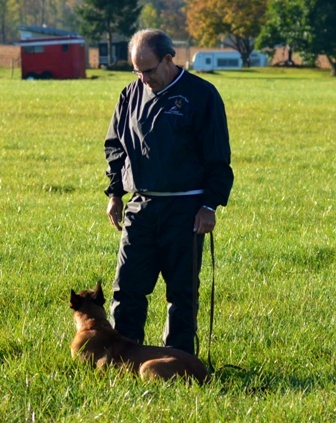 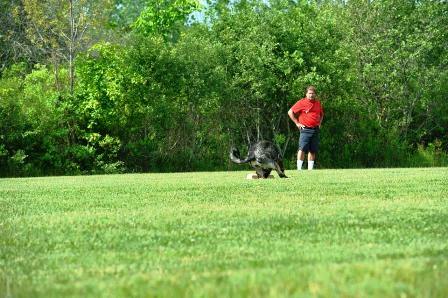 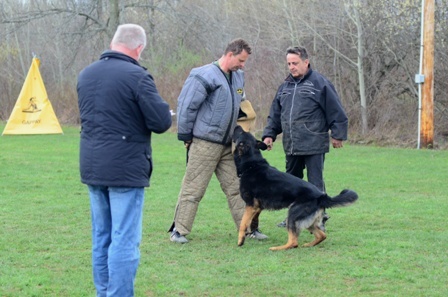 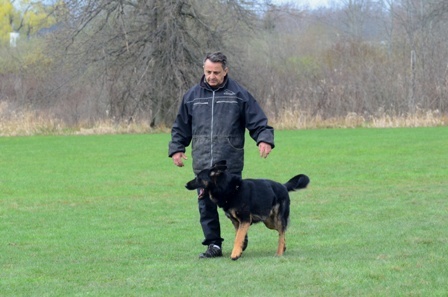 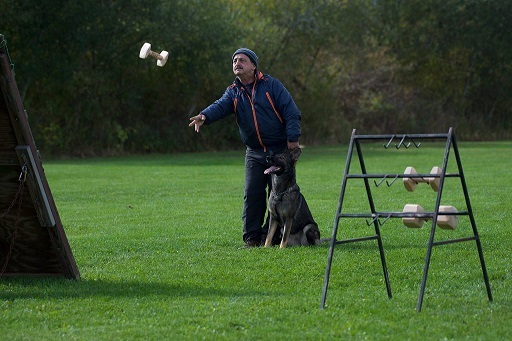 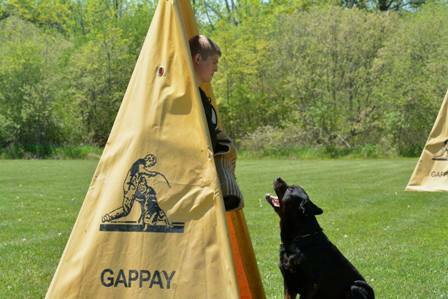 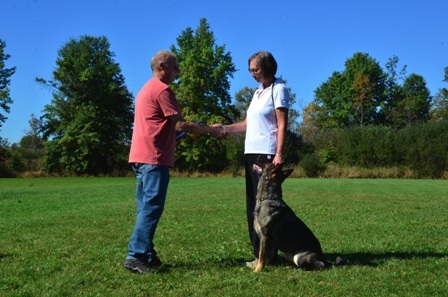 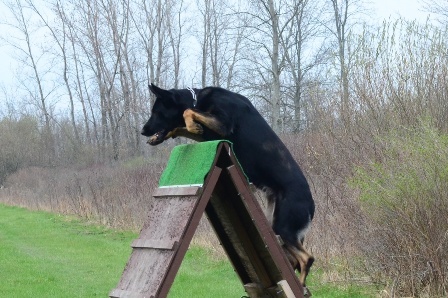 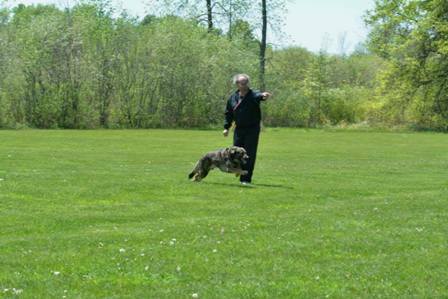 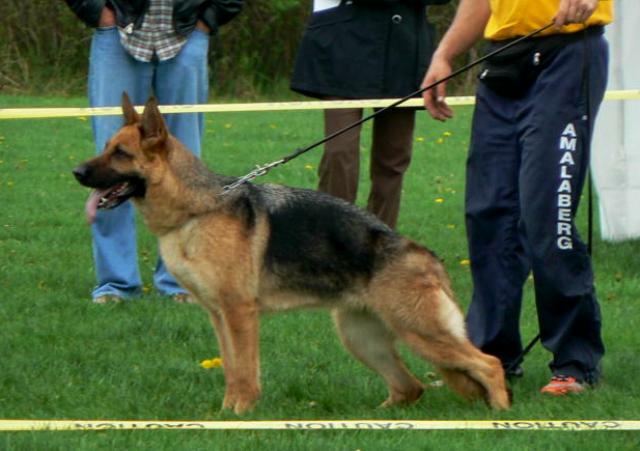 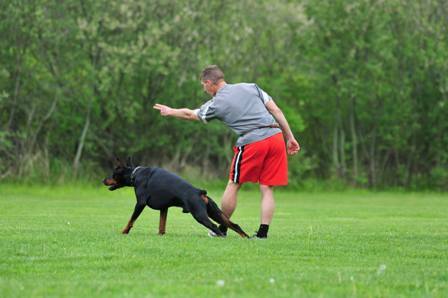 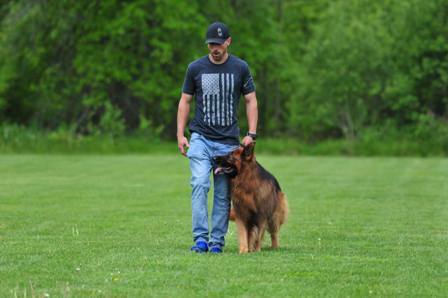 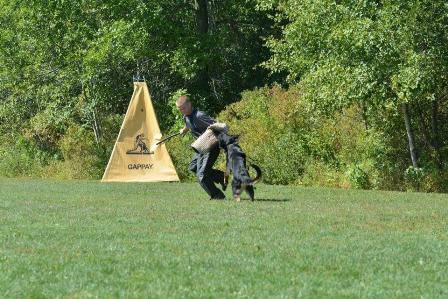 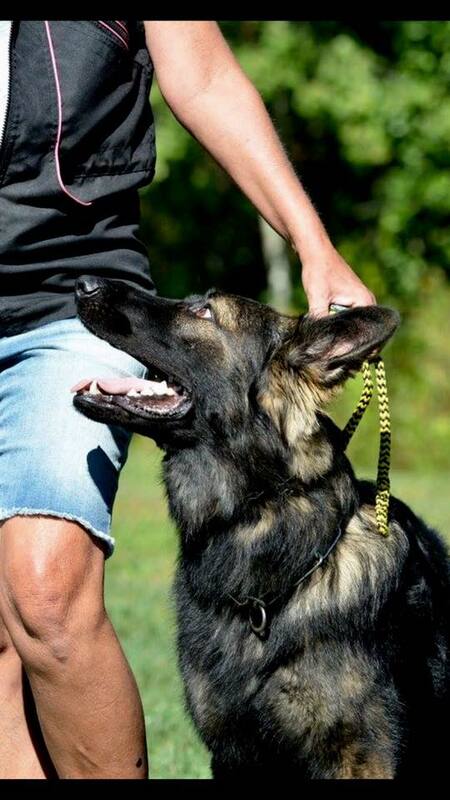 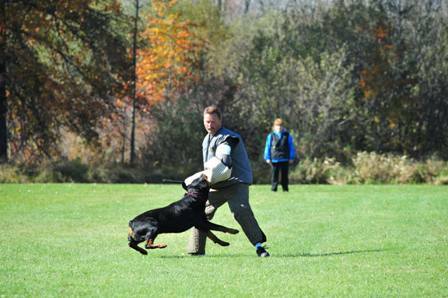 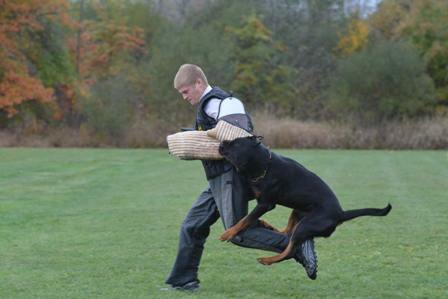 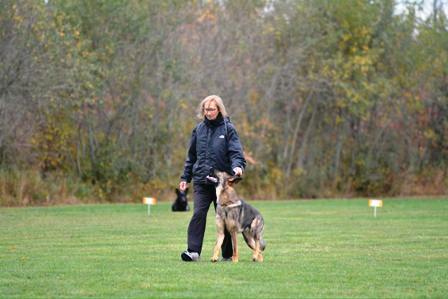 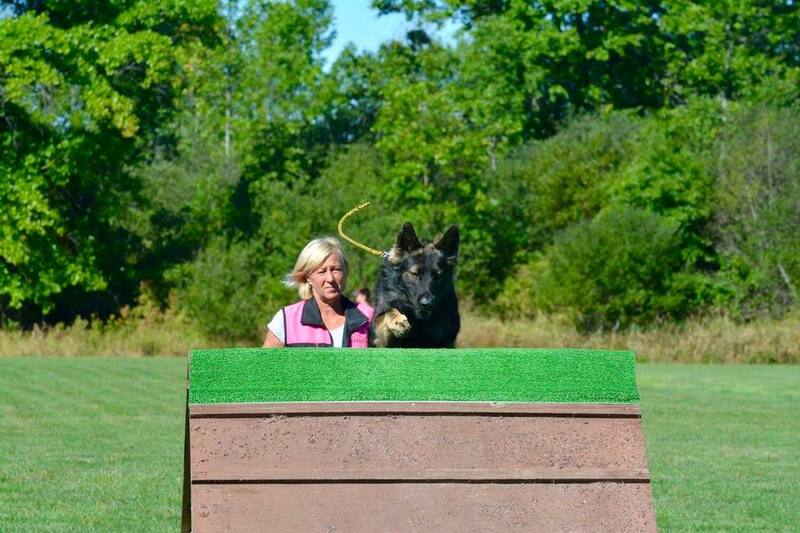 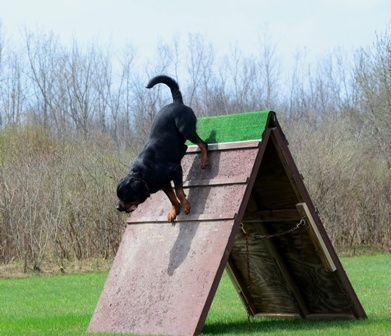 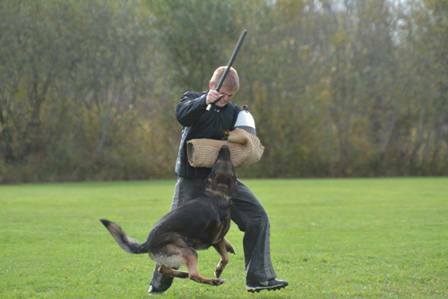 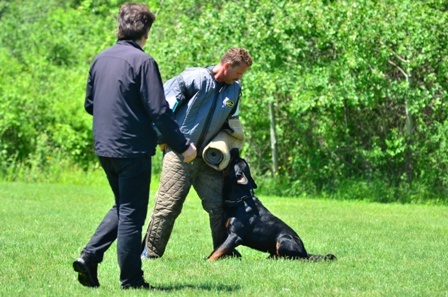 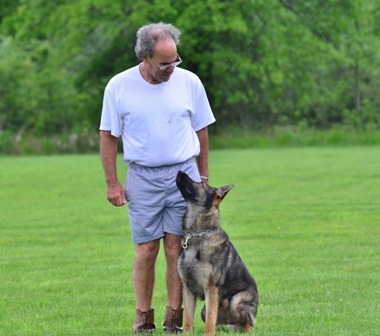 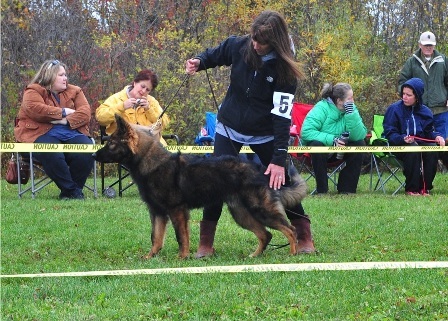 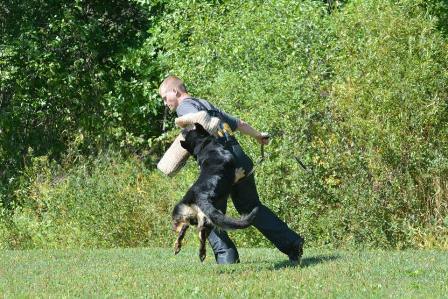 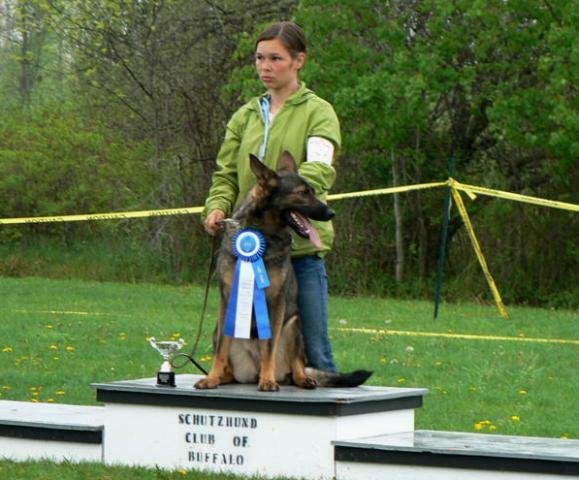 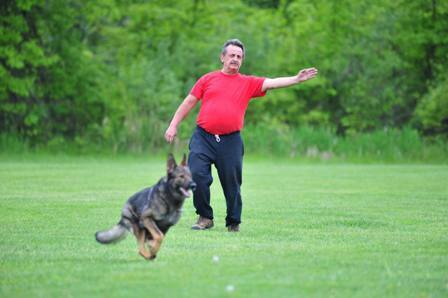 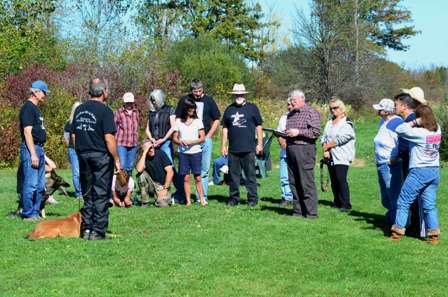 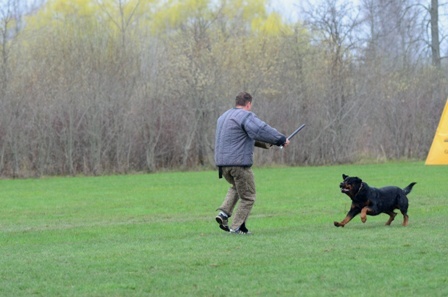 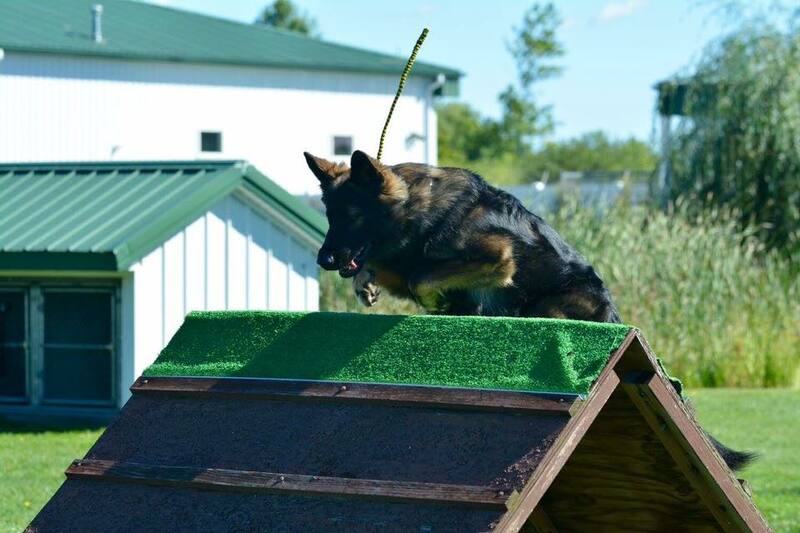 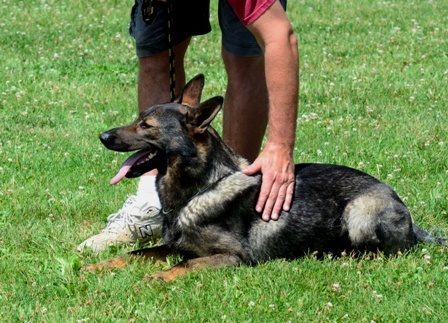 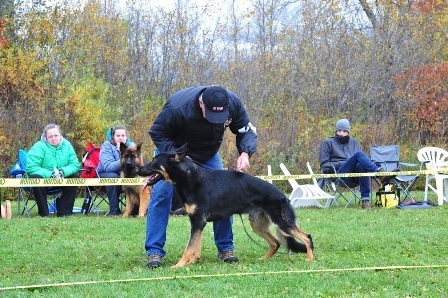 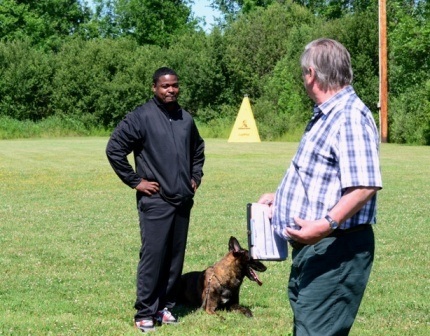 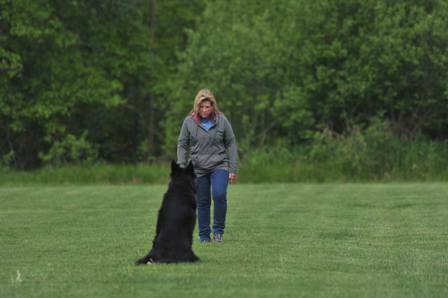 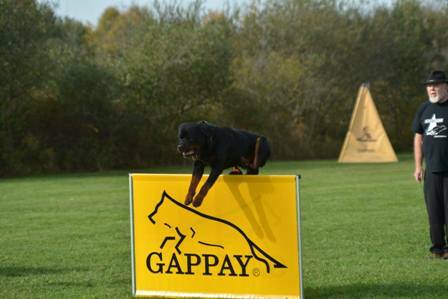 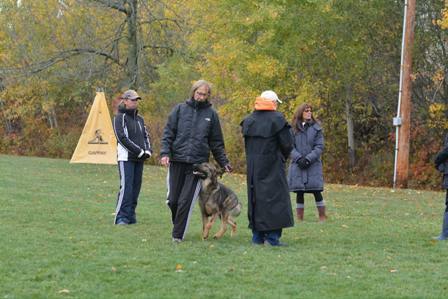 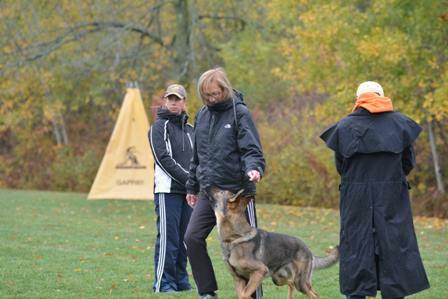 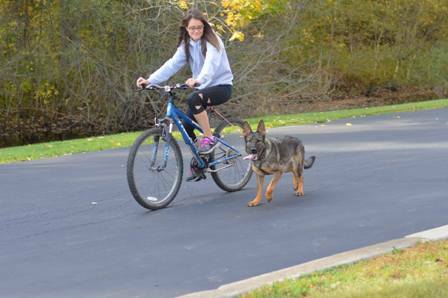 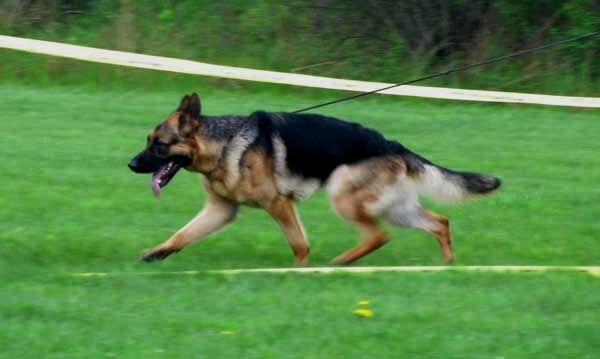 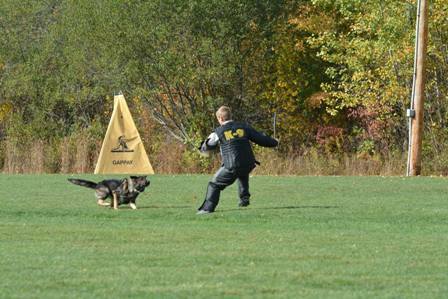 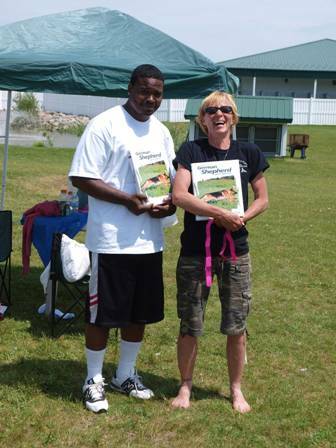 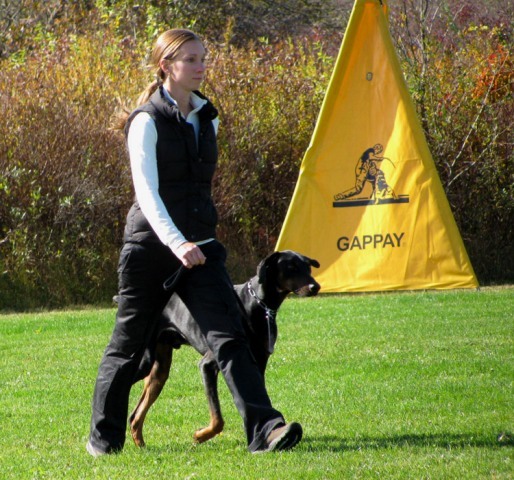 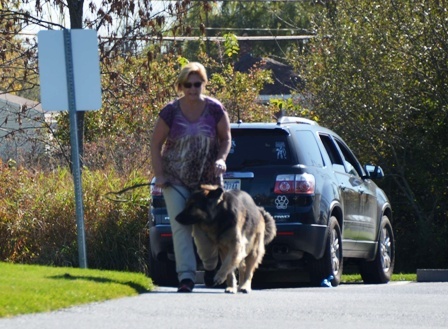 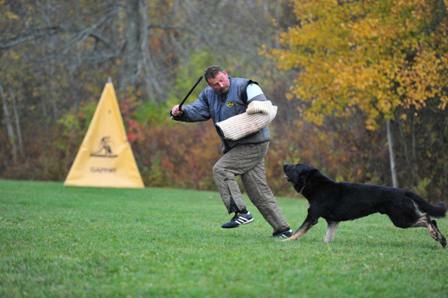 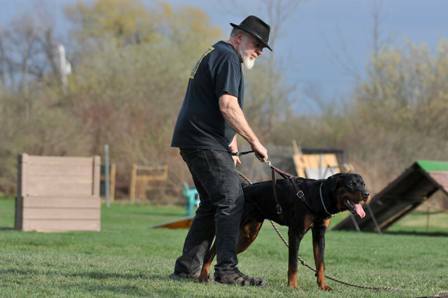 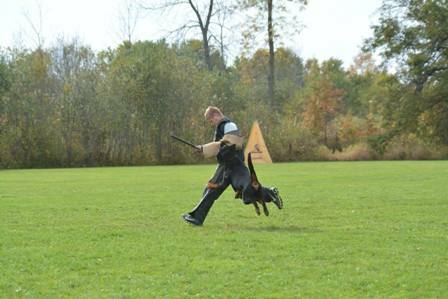 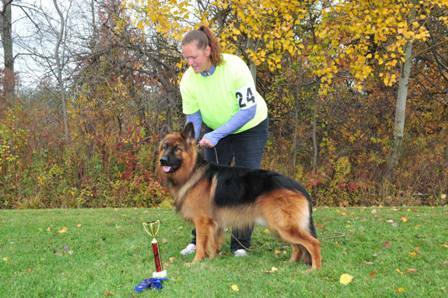 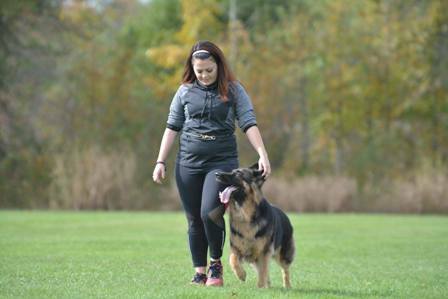 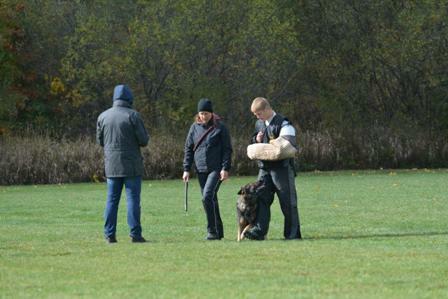 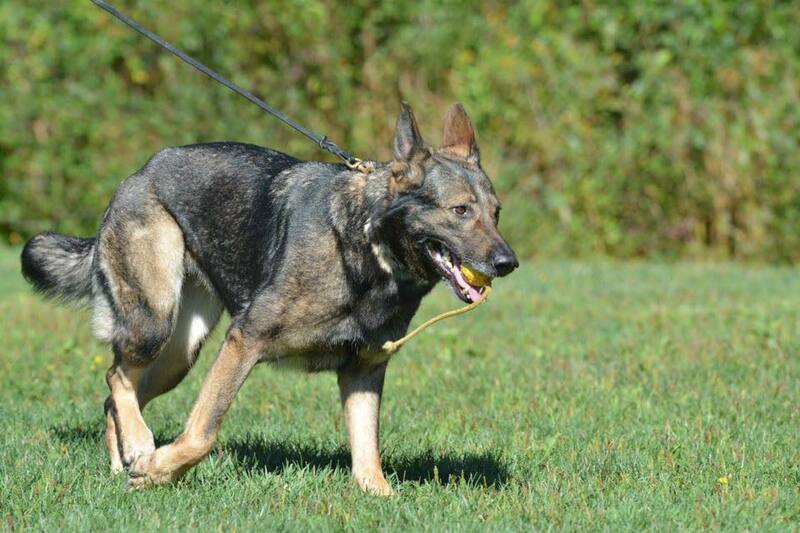 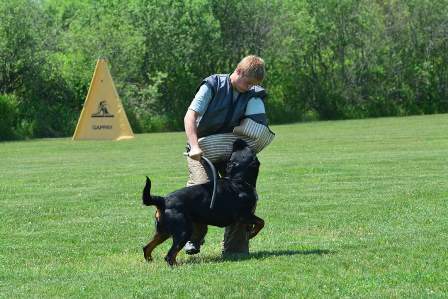 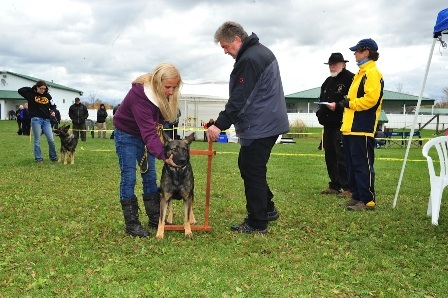 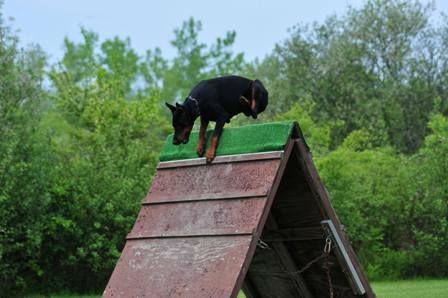 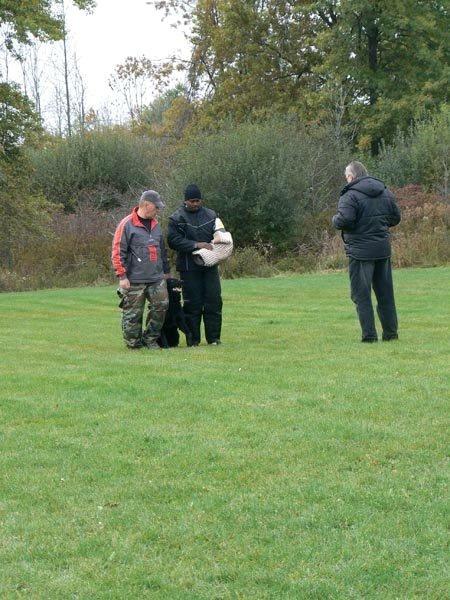 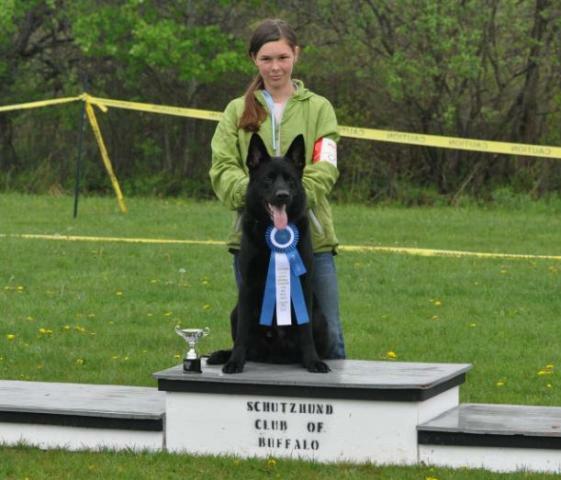 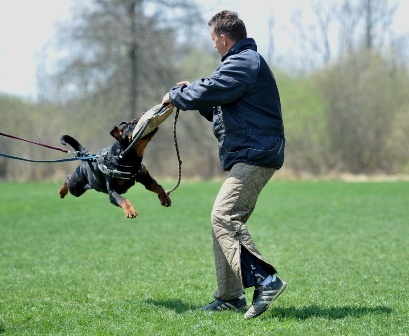 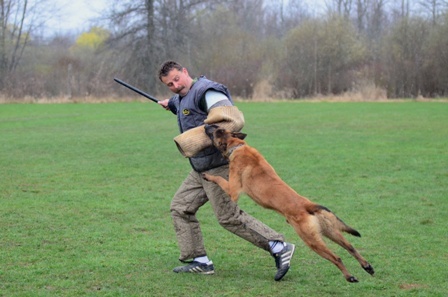 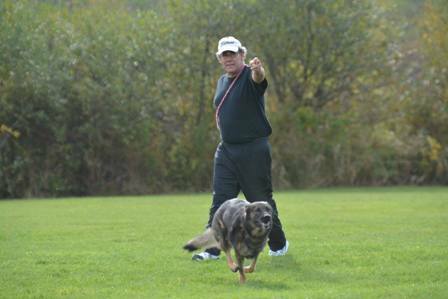 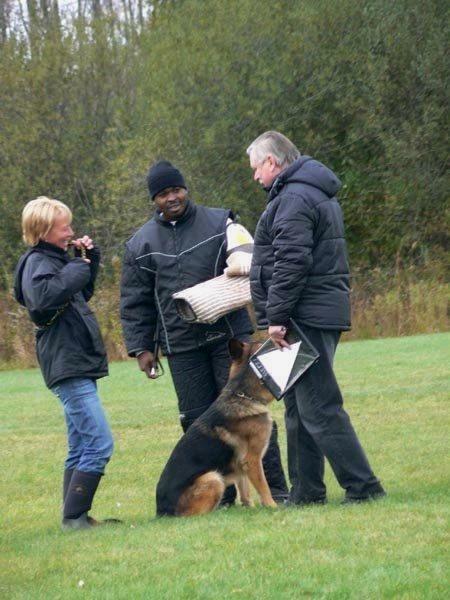 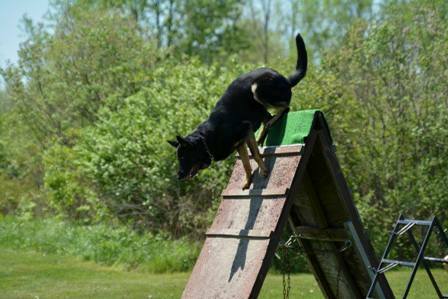 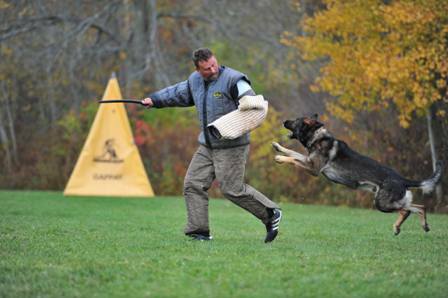 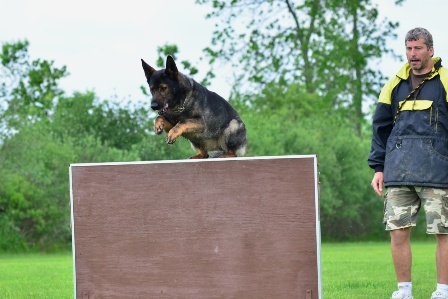 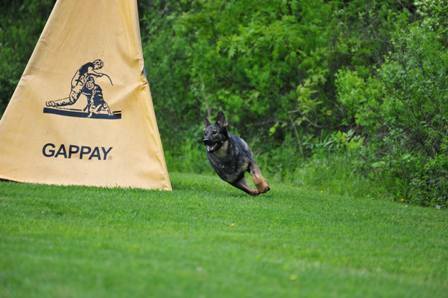 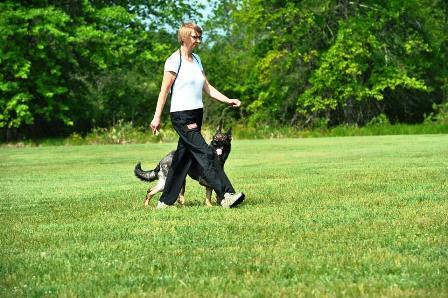 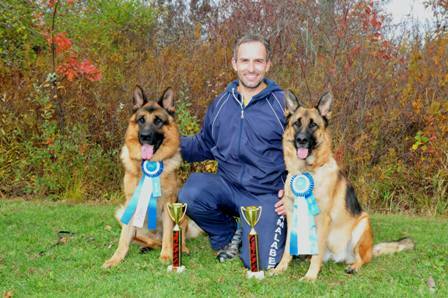 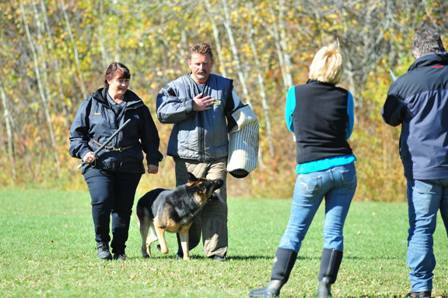 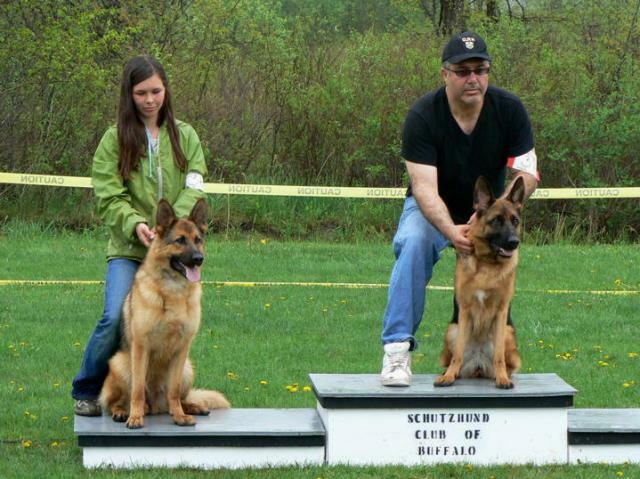 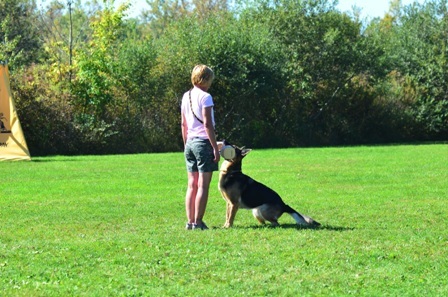 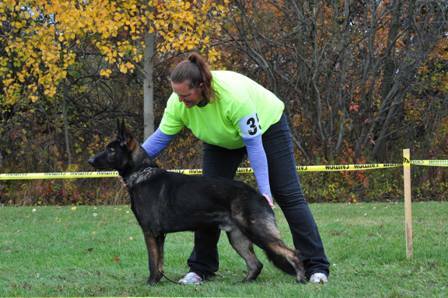 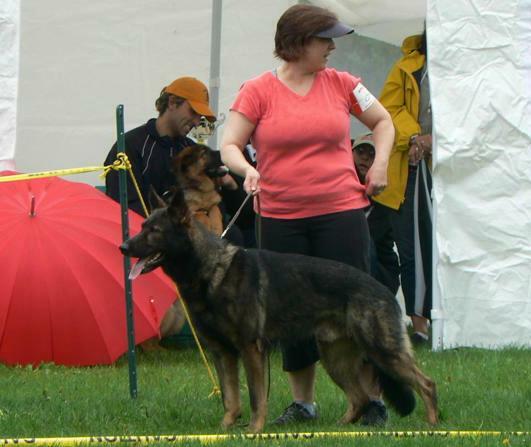 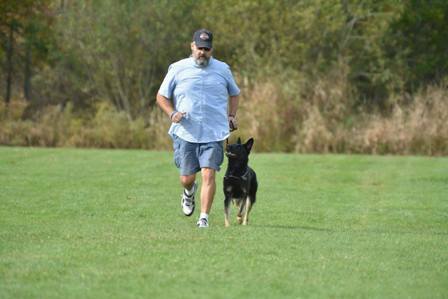 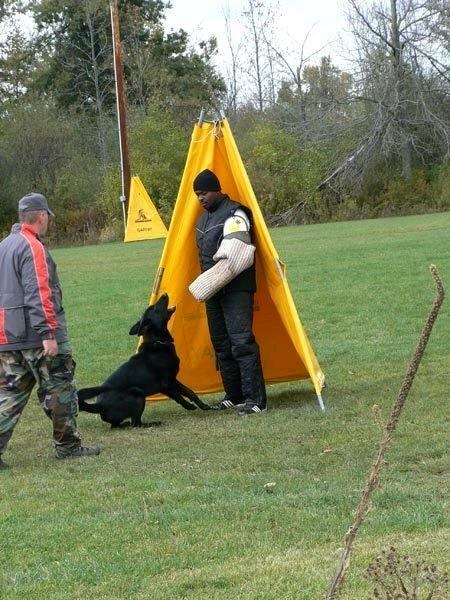 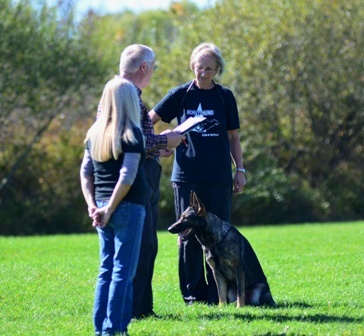 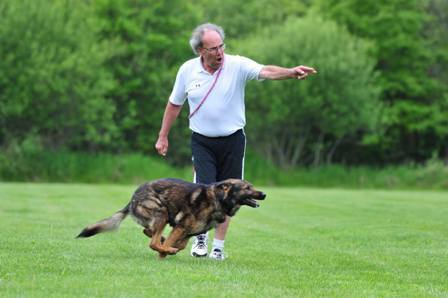 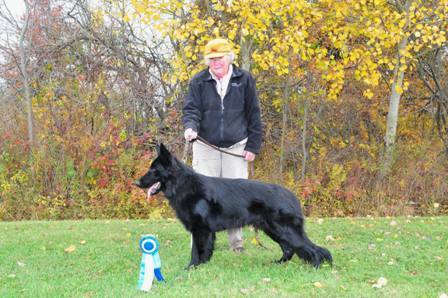 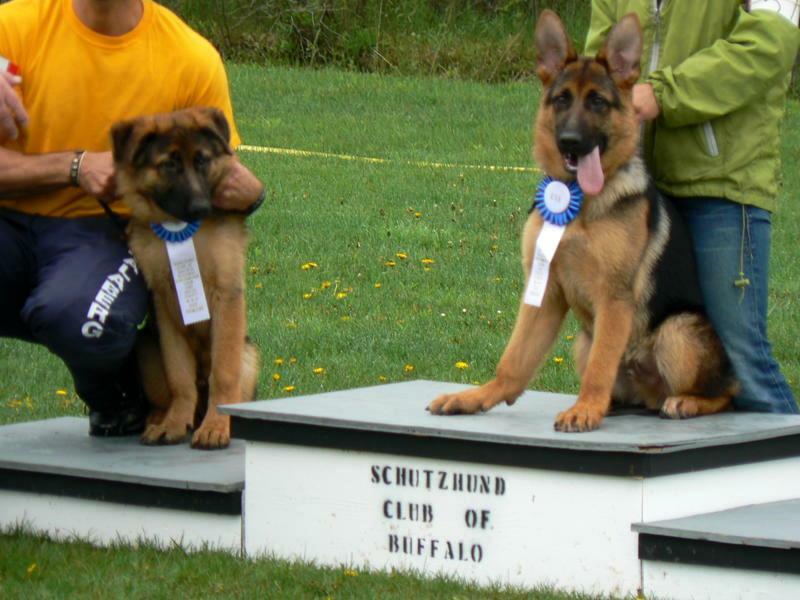 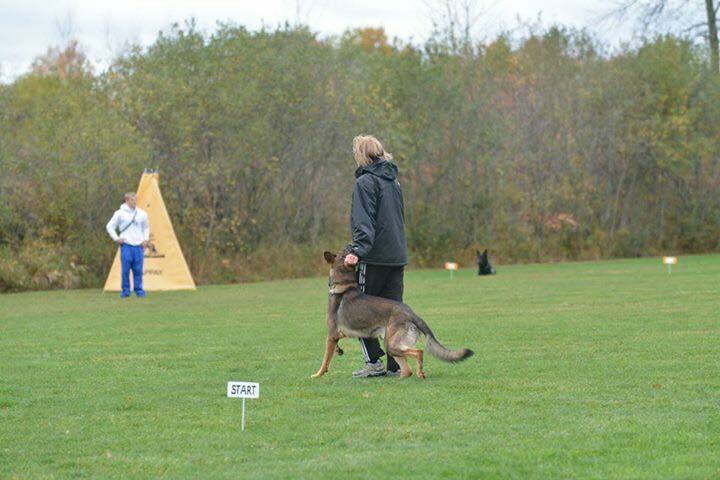 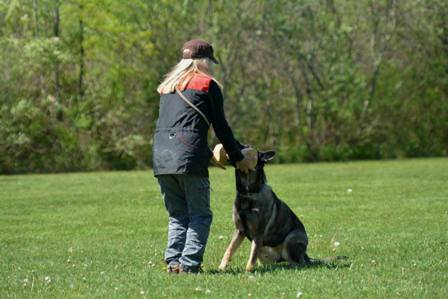 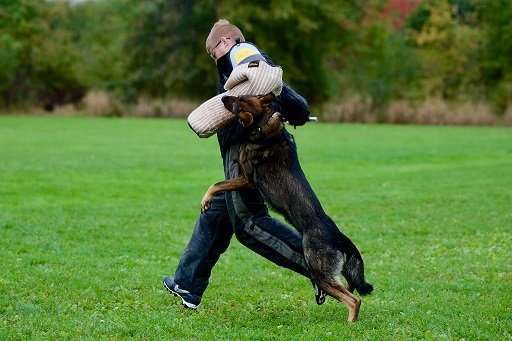 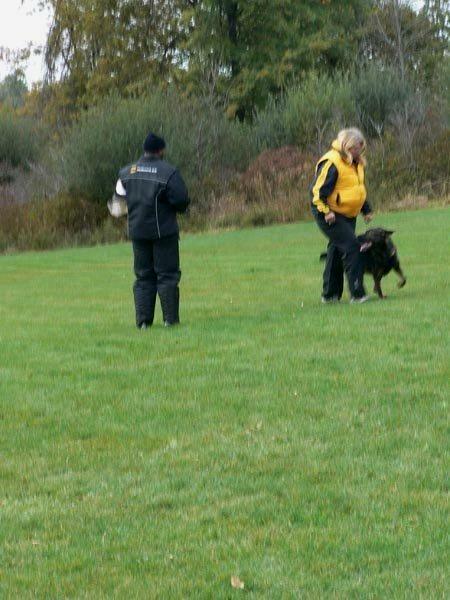 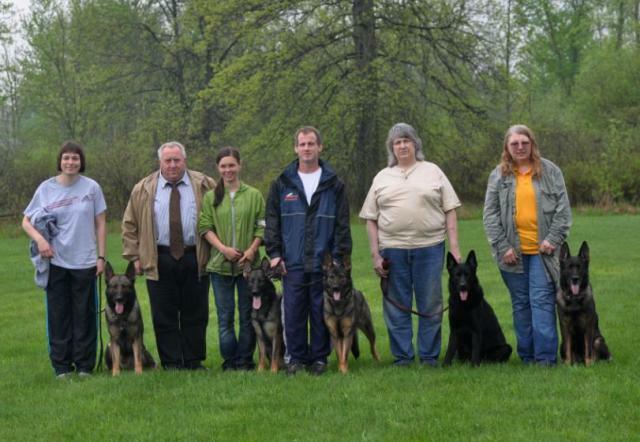 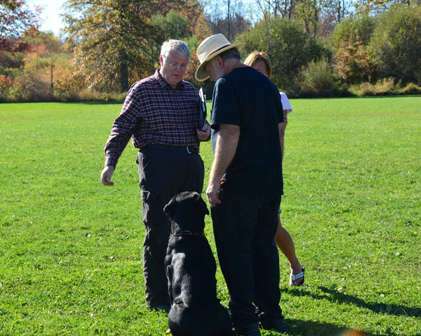 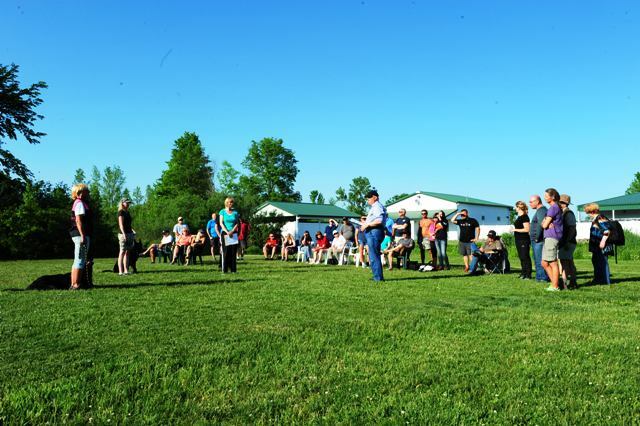 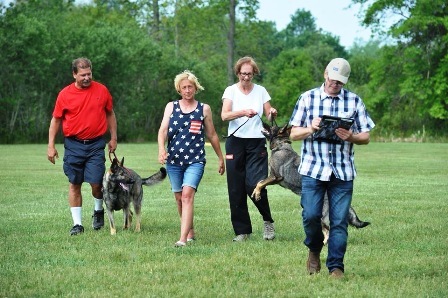 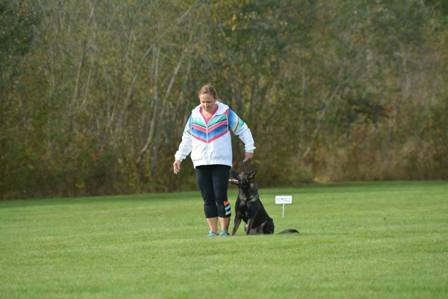 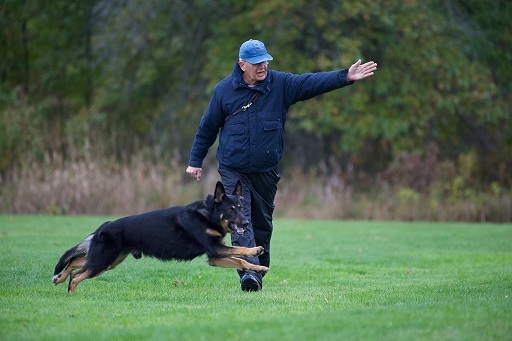 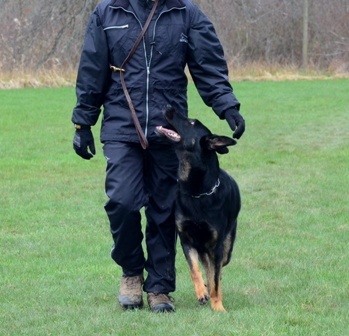 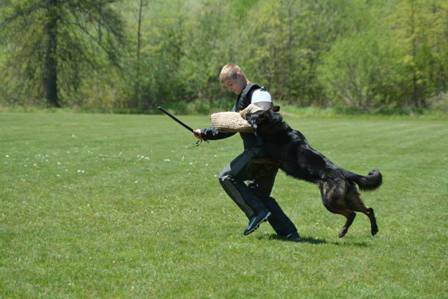 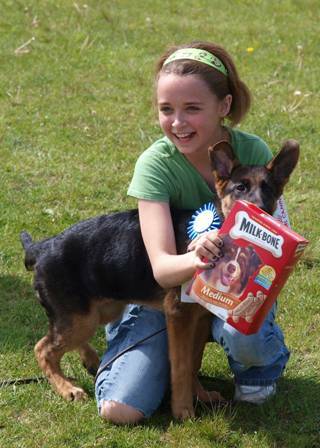 That`s the reason why I am so impressed of the Schutzhund Club of Buffalo. 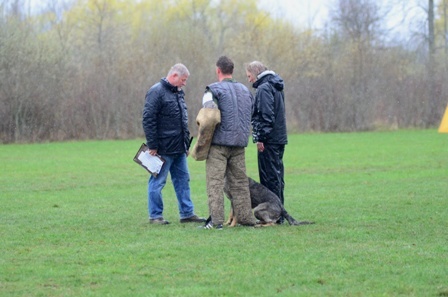 You, dear Kenneth, and your Team of the Club did such a great job and from the starting of the event until my departure. 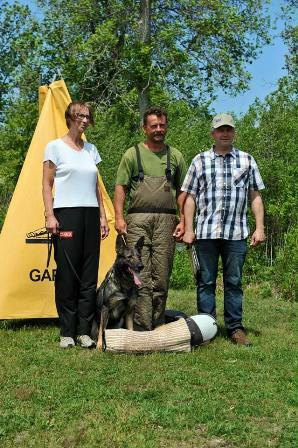 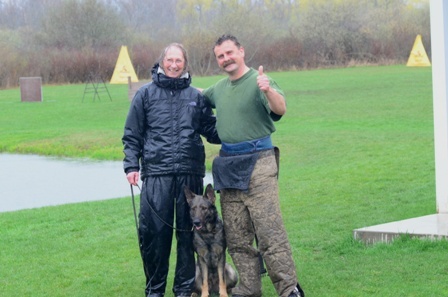 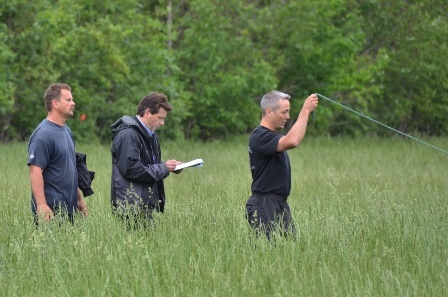 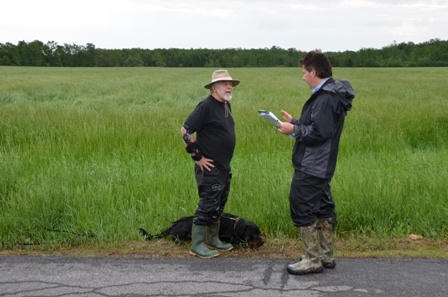 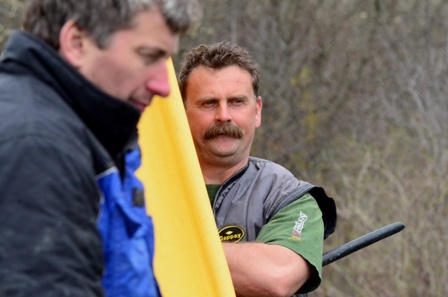 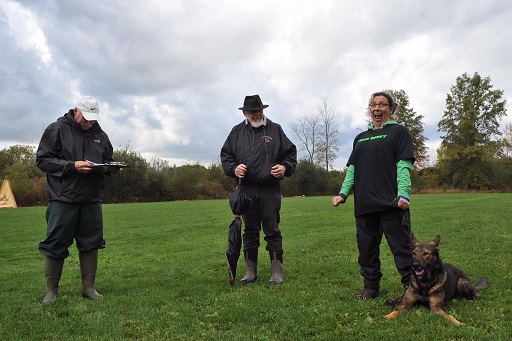 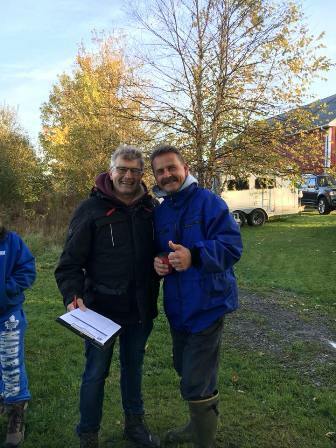 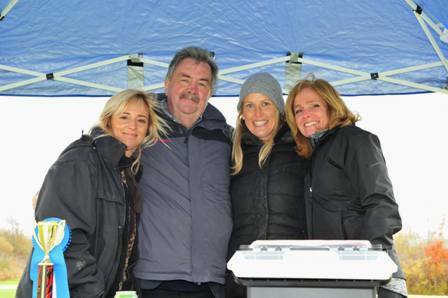 I also want to thank Carloyn Nervo (Trail Secretary), Richard Smehlik (Tracking Layer) and Radek Zalezak (Schutzhund-Helper) for the great work. 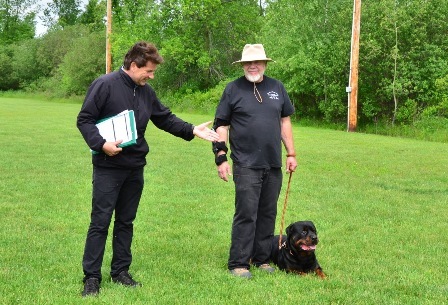 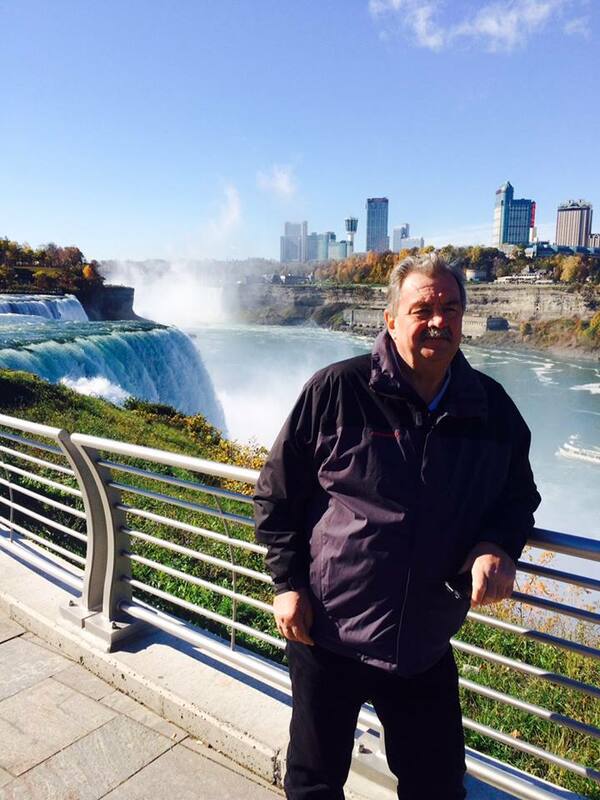 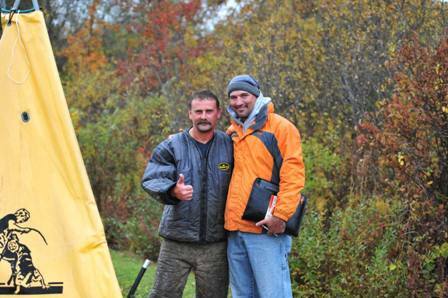 Don Yelle had done his international practical judgetraining absolutely perfect. 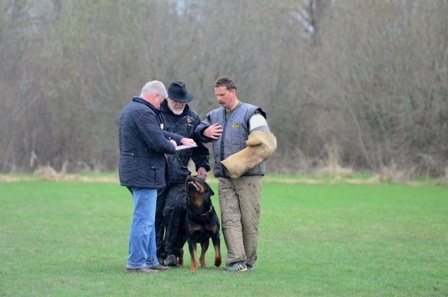 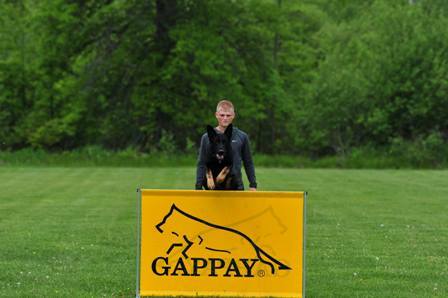 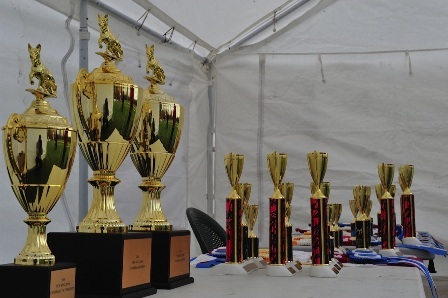 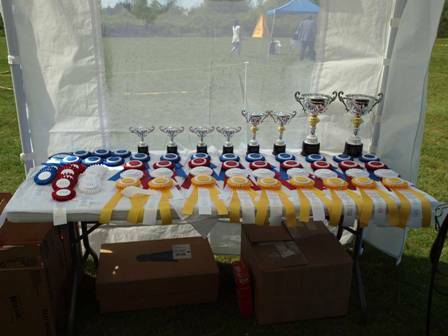 62 dogs where handled at this event, with patience and fair play and that is the major respect you can show a judge. 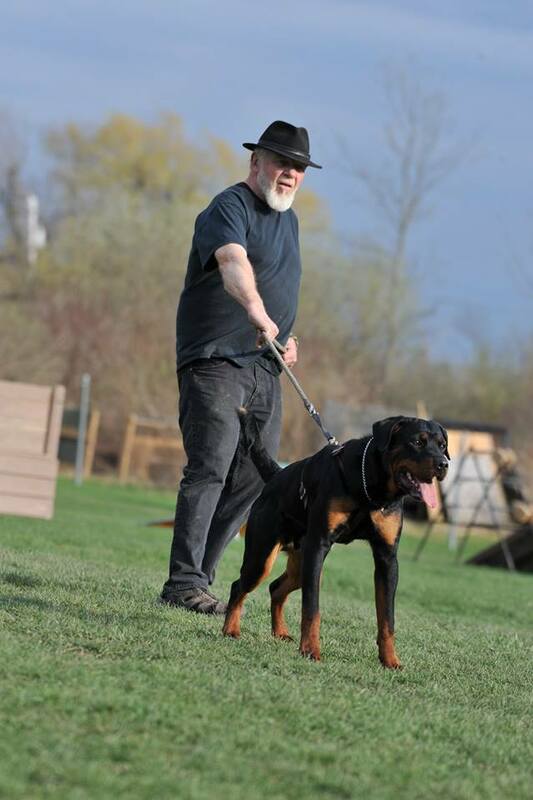 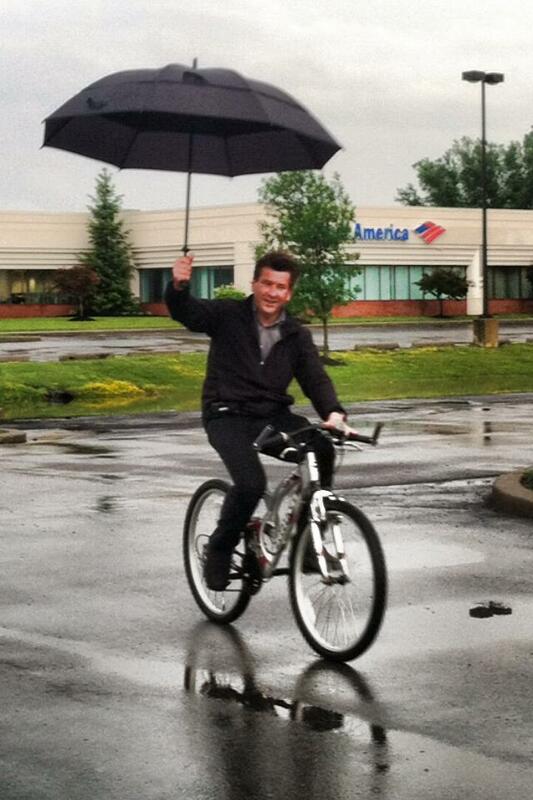 Thank You, Al Rinow, for the pictures!